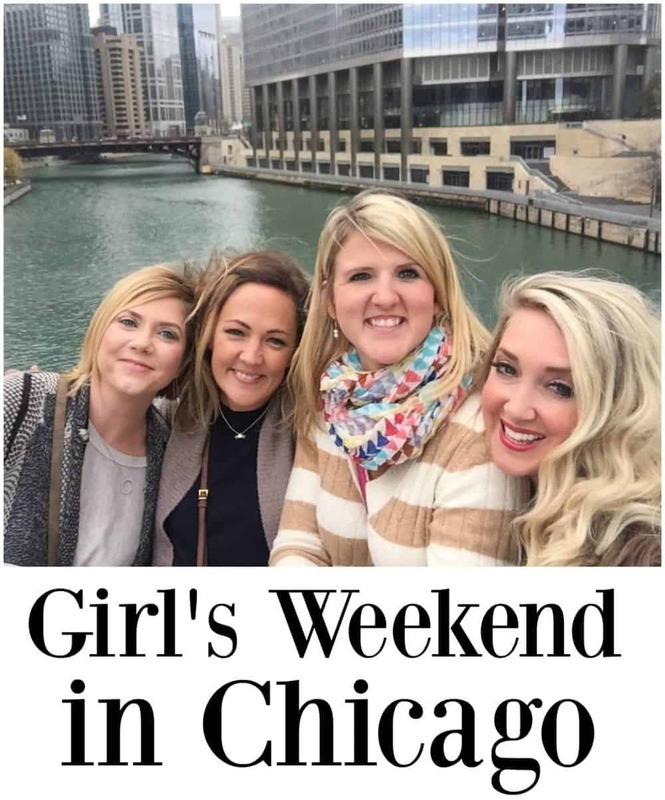 Thrilled to share the fun I had on my Las Vegas Girl’s Weekend! From beautiful hotels to amazing food, Las Vegas is the perfect place for a Girl’s Weekend! 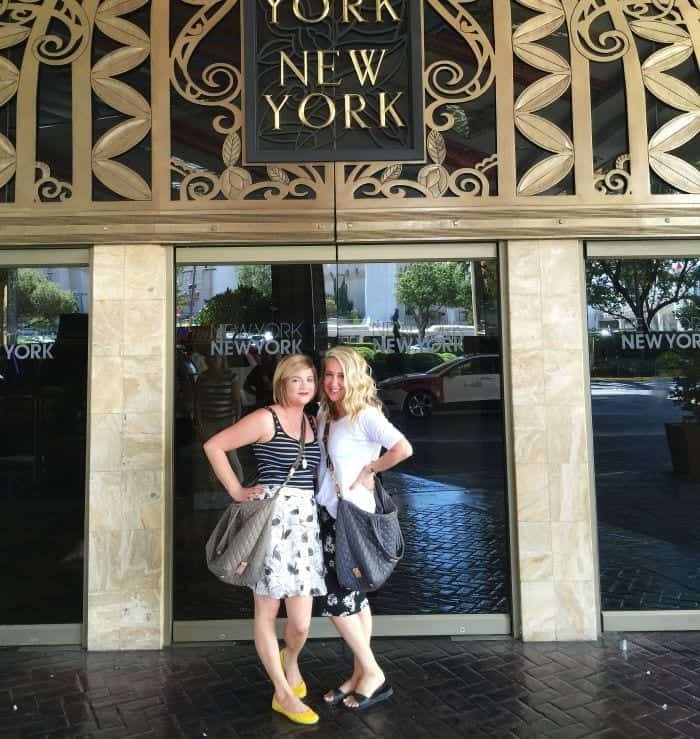 Amanda, Shelly and I got to stay at the lovely Delano Hotel above Mandalay Bay. There’s no casino or smoky lobby. It’s amazing for those who aren’t big gamblers and have a hard time dealing with smoky hotels. So nice! 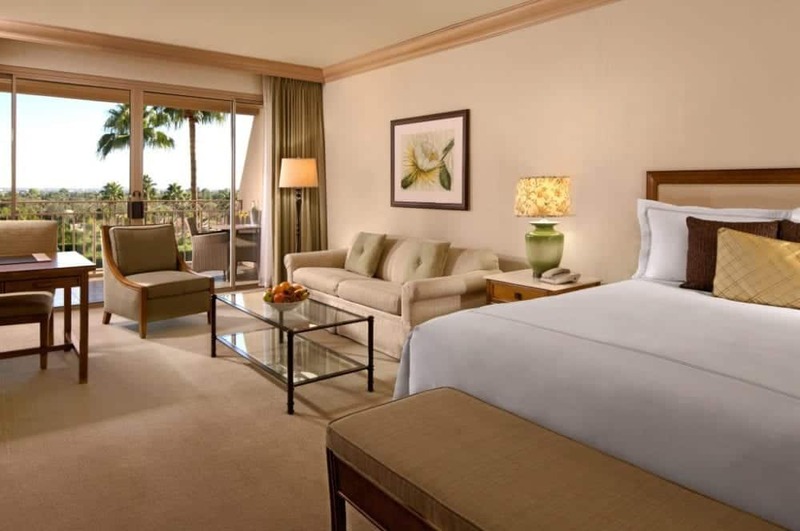 The rooms were spacious, clean and the bed was soft and cozy. Will definitely stay at Delano again. Be sure to check them out! 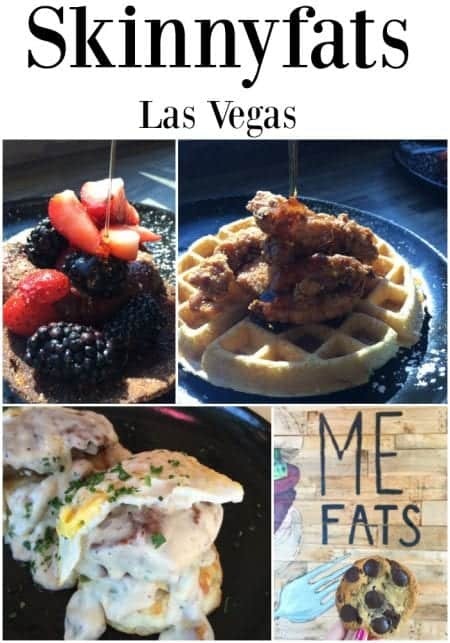 Our first morning, we ventured off of the strip to breakfast at Skinnyfats. They have a healthy side menu and a “happy” side, lol! I loved this place. 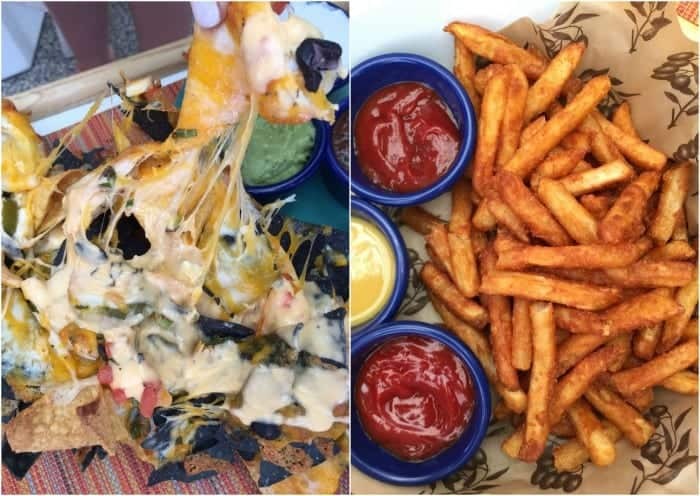 We might have ordered everything off of the “happy” side. Oops. 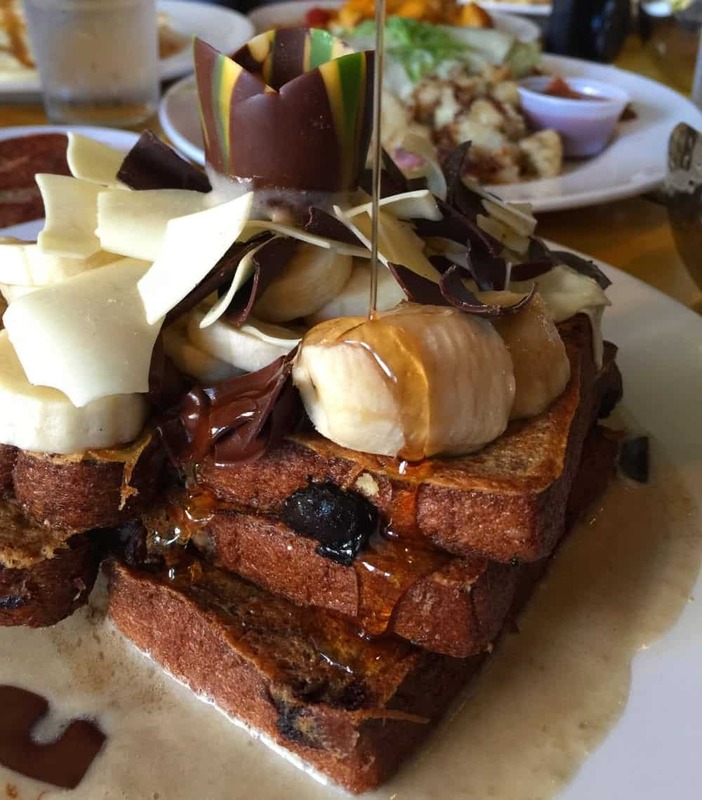 The Churro Nutella French toast, top left photo was amazing. Actually everything we ordered was great. Fun place to try if you are visiting. It was only about 10 minutes from the strip at the most. 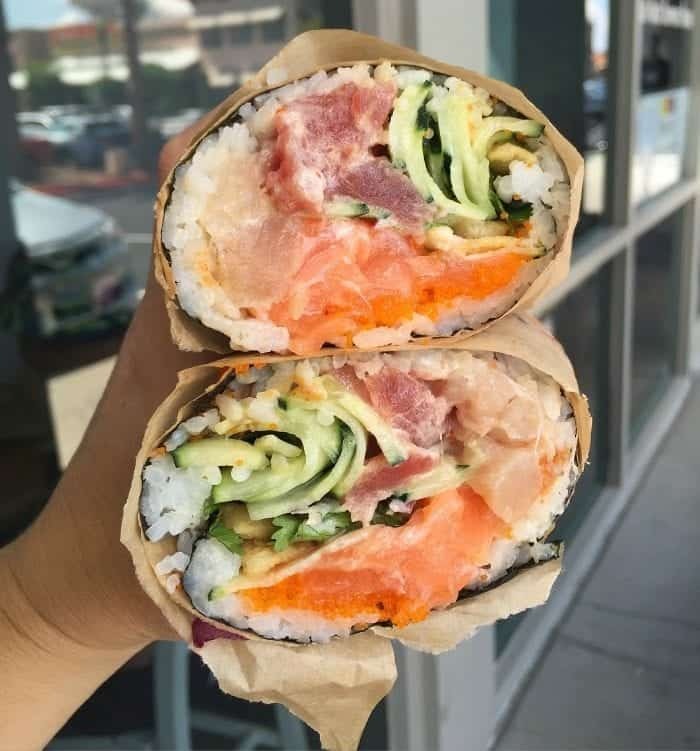 After some fun shopping we ventured off of the strip again to this SoHo Sushi Burrito shop. Look at all of that sushi!! So colorful and pretty. *Serendipity is no longer in Las Vegas** Later that evening we were back on the strip to Serendipity 3. 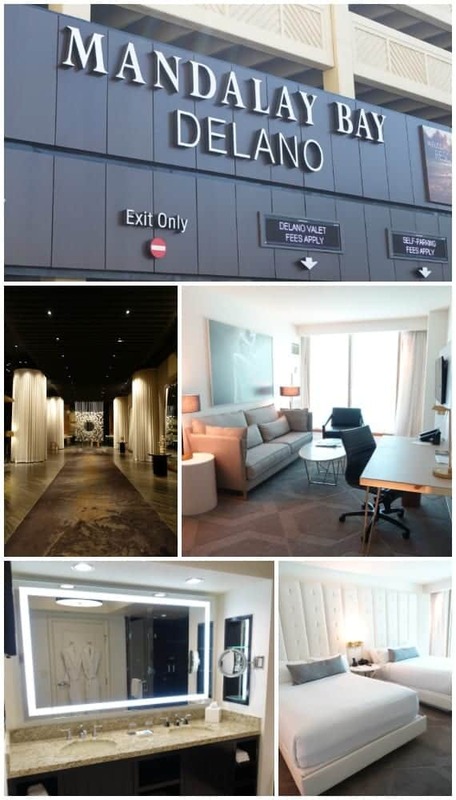 Most of you know Serendipity in NYC, the location in Las Vegas is huge compared to the NYC one. I enjoy both, but it’s nice having some walk space here in Vegas. Their menus are different as well. Look at all of these goodies!! 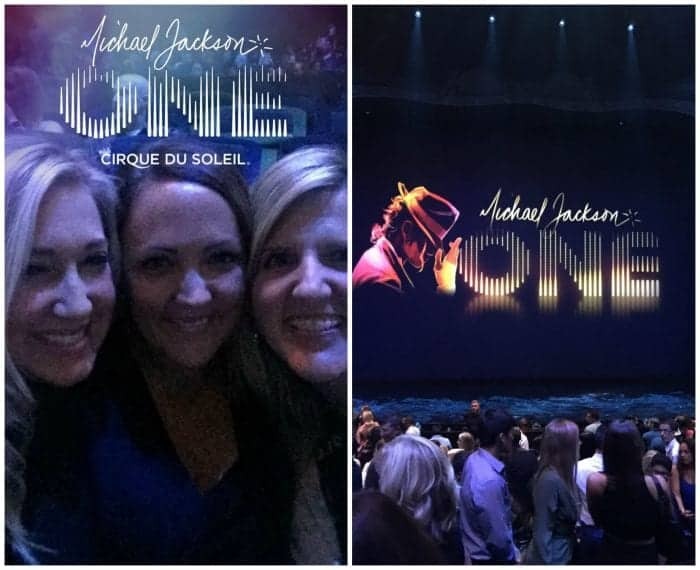 Got tickets to see Michael Jackson One at Mandalay Bay Friday night. We loved it! Great music, dancing and Cirque acts. Saturday morning we took off to downtown Las Vegas where the original best US casinos started out. 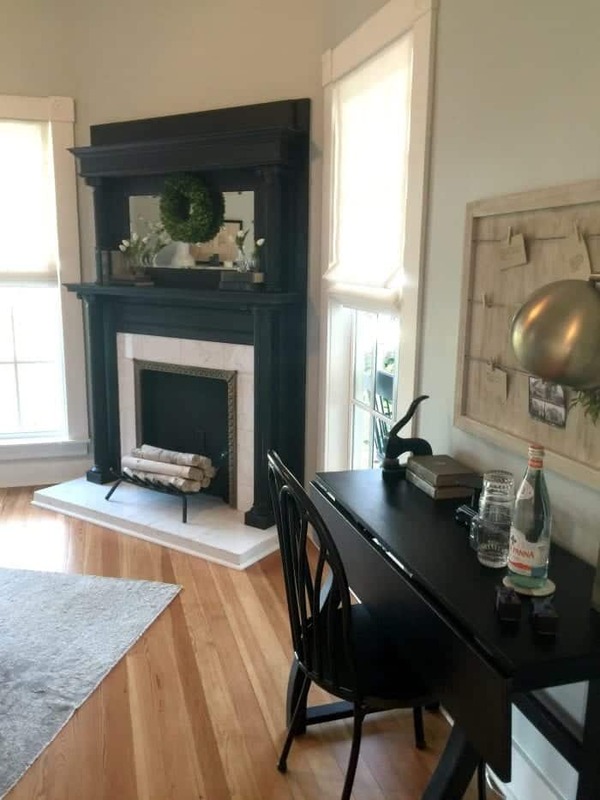 Super cute area. 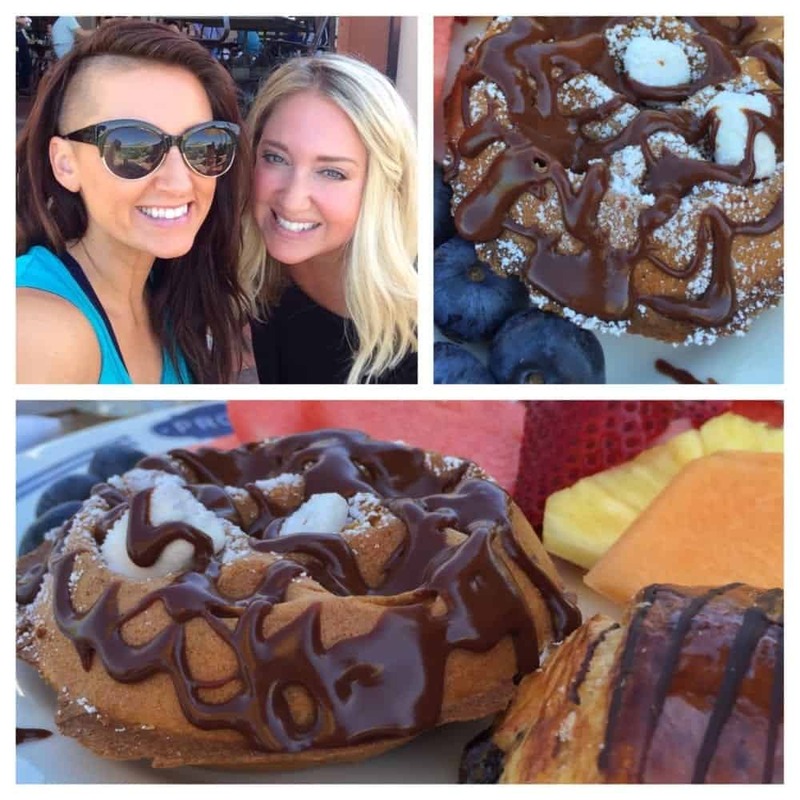 The Donut Bar….AMAZING. Make sure you stop here while visiting. About a 15 minute Taxi or Uber drive and you get these gorgeous donuts 🙂 The Churro Donut Ice Cream Cone is unbelievable. After some shopping we had lunch later that afternoon at a gorgeous restaurant in Bellagio Hotel that overlooks the fountains called LAGO. Everything was stunning. 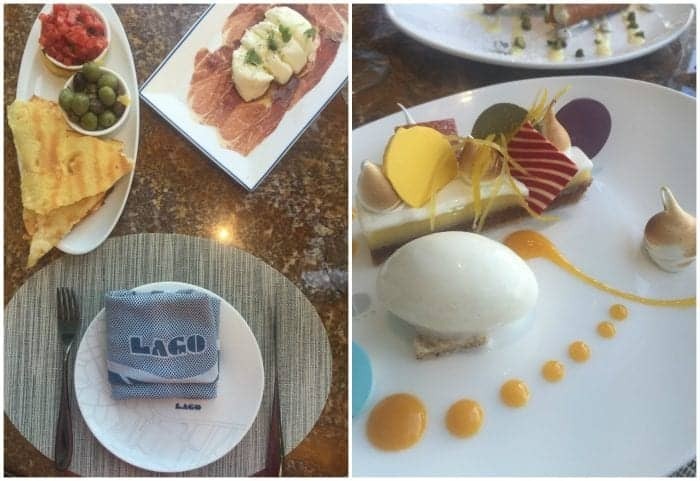 The bright restaurant, tables by the windows to enjoy the water show and the beautifully prepared food. 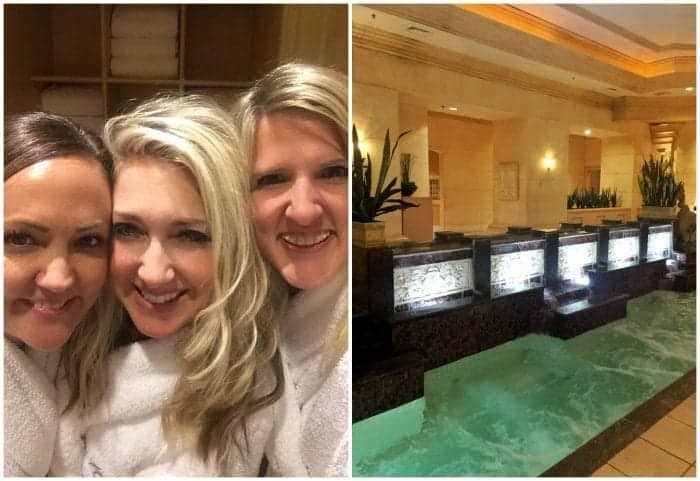 A girl’s weekend isn’t complete without a spa afternoon right? We made our way to Mandalay Bays beautiful spa for some much needed massages. Loved this!! A lovely dinner with a view! Dinner at Rivea was so much fun overlooking the strip. We had drinks at Skyfall Lounge with the same gorgeous views. My Raspberry Basil Lemonade was fantastic for those of you who don’t drink. We had a few places to squeeze in before heading to the airport. First up was Salted Malted off of the strip. This was about a 30 minute drive from the strip, but oh my goodness definitely worth it. A cute retired couple own the shop and make delicious breakfast sandwiches on homemade biscuits not to mention their array of desserts. This churro ice cream sandwich was a favorite of the morning 🙂 They even have a “Dole Whip” machine. I sampled it and it tastes EXACTLY like the ones from Disneyland. Pretty cool. 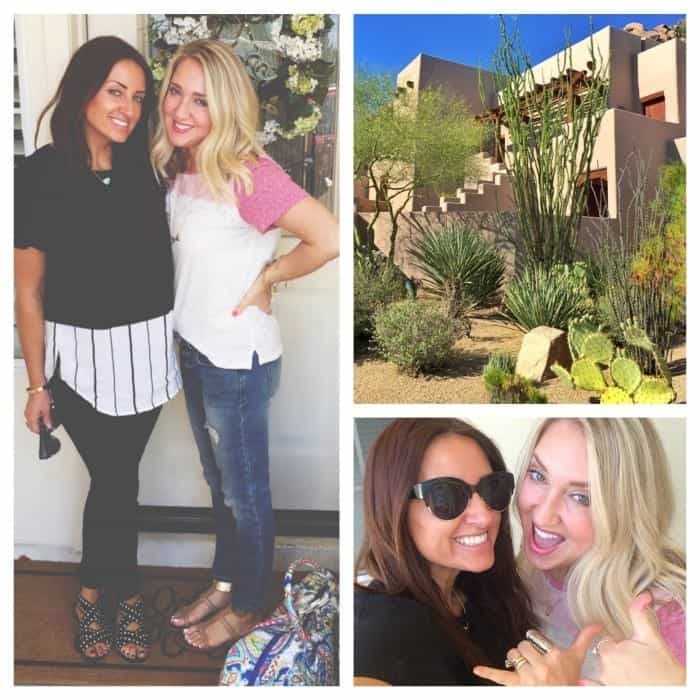 Sharing the Best Places To Eat in Arizona with you today! 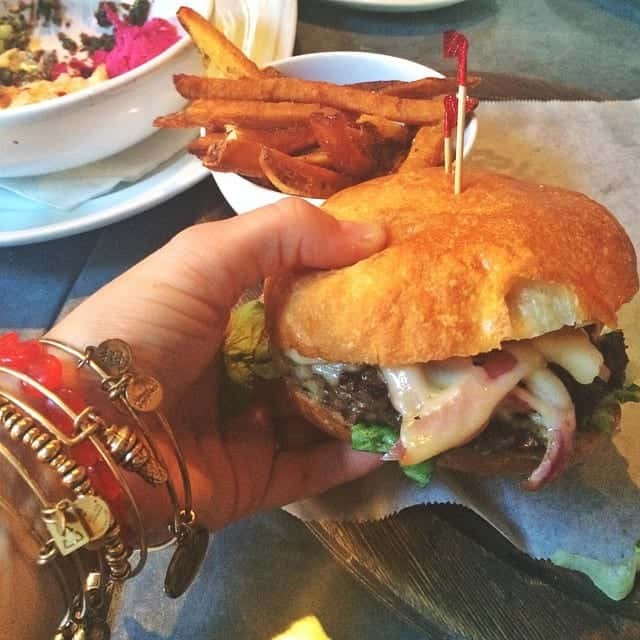 So many favorites, so hold on tight and get ready to make your list of places to try! 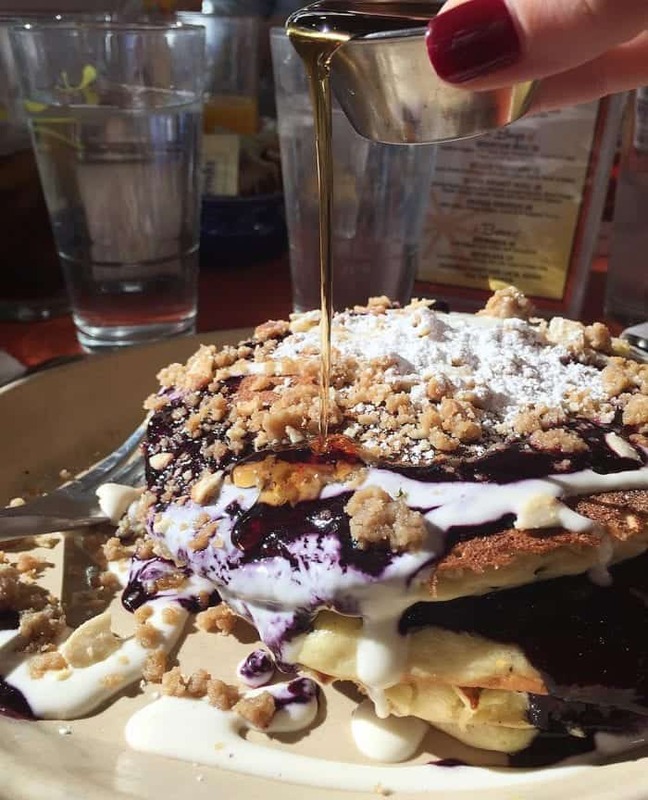 Just recently found this breakfast spot a few weeks ago, it’s called Butters Pancakes and Cafe located in Scottsdale. 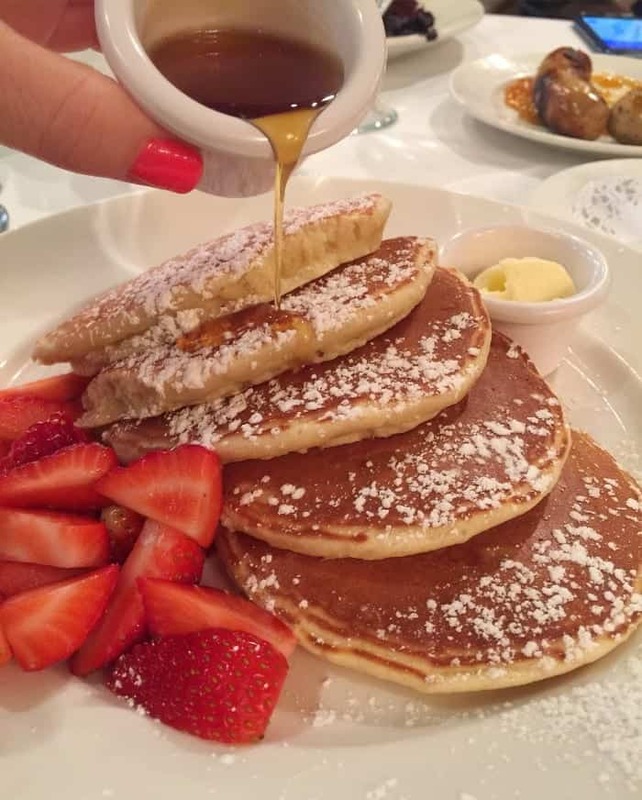 I’m telling you, some of the best pancakes I’ve had. This particular one is the Wildberry Pancake stack and it has a vanilla cream layered between the cakes. One of my favorite pancakes to date. Can’t wait to go back. 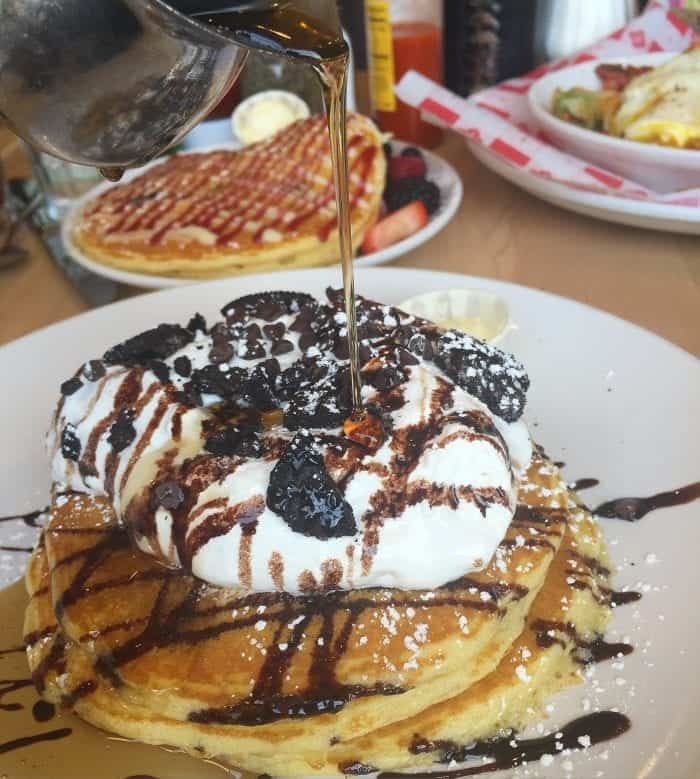 Another fun pancake from Butters called the Oreo S’mores. Hello! 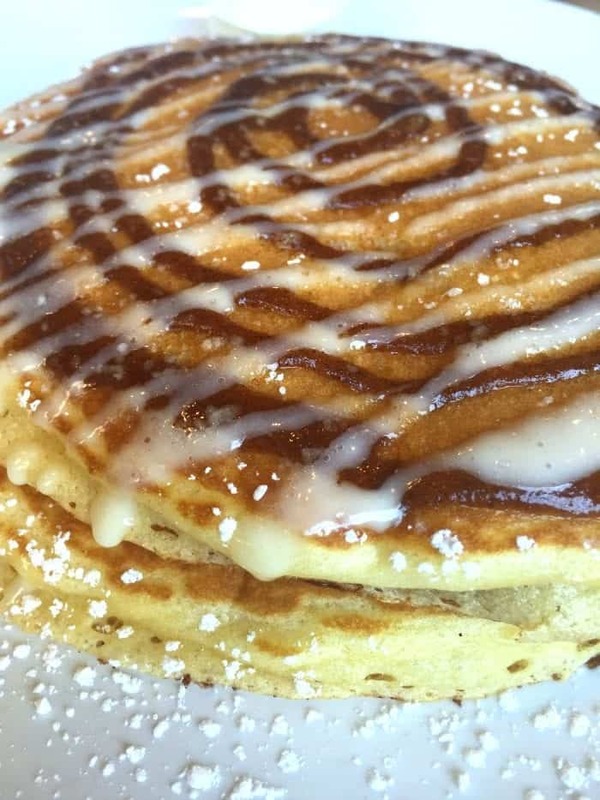 Their Cinnamon Roll pancake is stunning and worth an order too. I know that Shake Shack technically started in NYC, however I absolutely feel like this is a favorite spot in Arizona now that it is here! Some of the best tasting burgers around if you ask me. 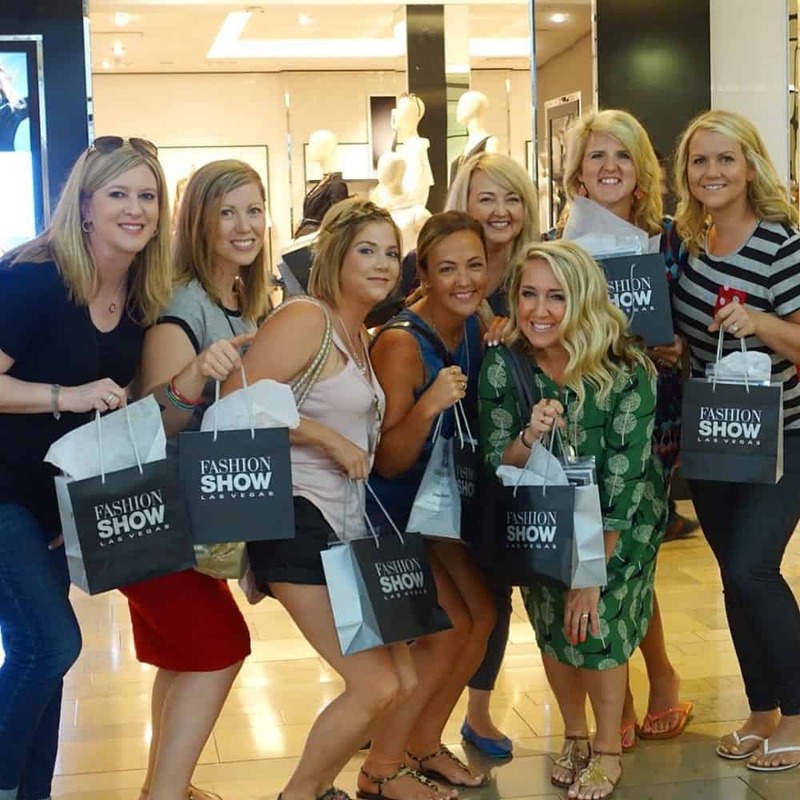 We visit the Scottsdale Fashion Square location. The one in the photograph is the Smoke Shack *double* with bacon! 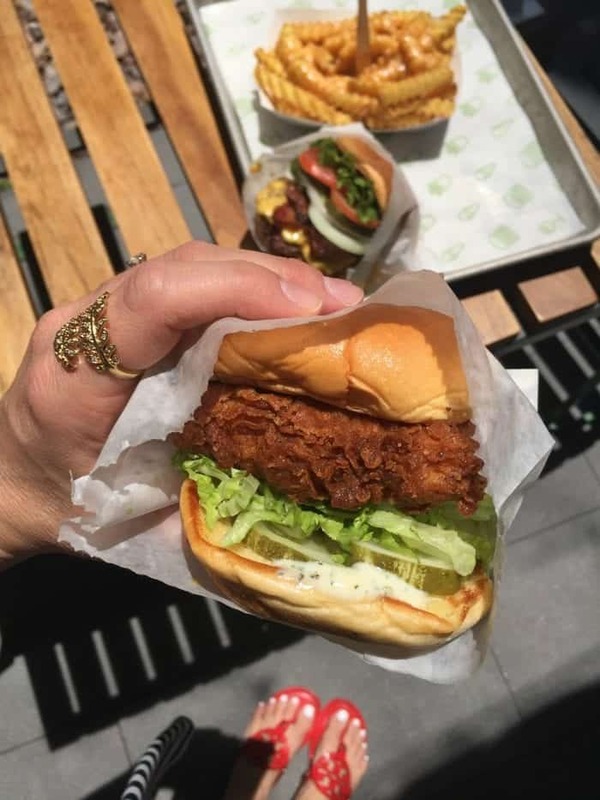 Not only does Shake Shack have amazing burgers, their Chicken Sandwich is one of my all-time favorites as well. Perfectly tender fried chicken in their signature soft buns. 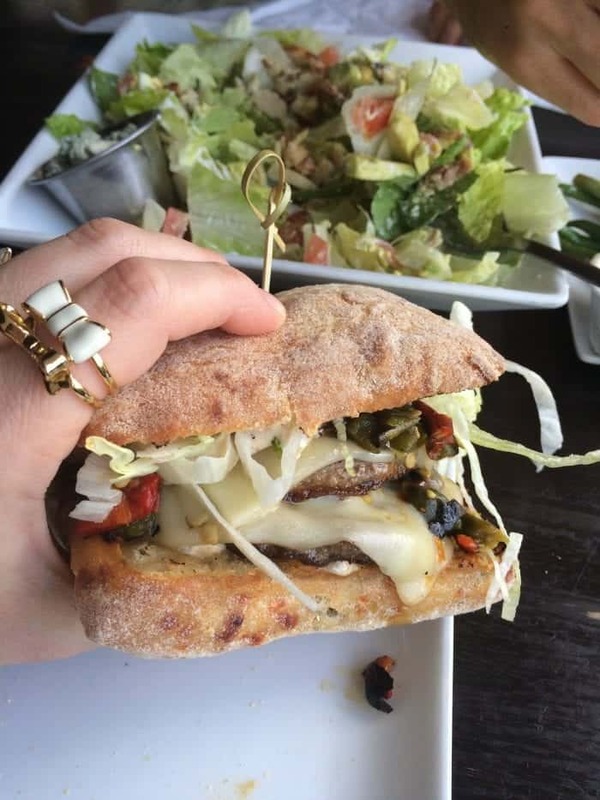 The pickle, lettuce and mayo….it just works. Yessss!! 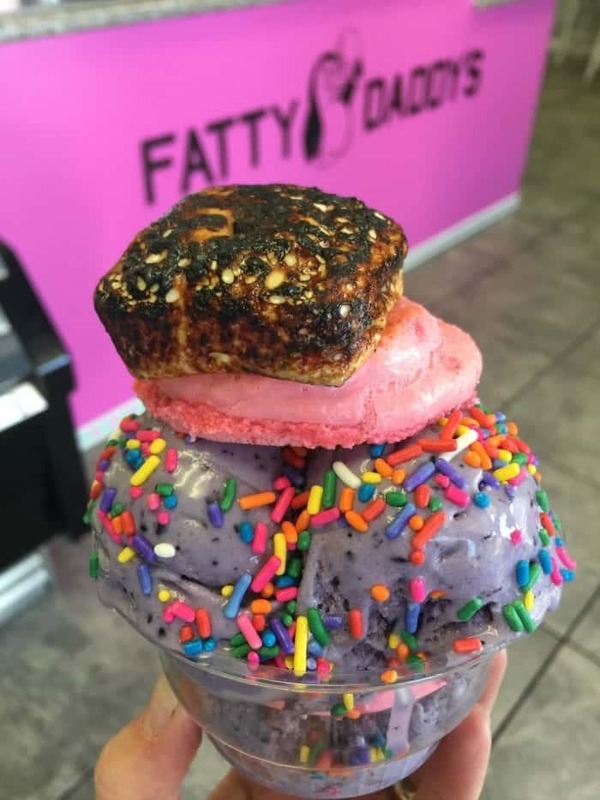 Fatty Daddy’s is a newer ice cream shop that specializes in unique homemade ice cream flavors such as fruit loops, lucky charms, chocolate birthday cake and so many more. 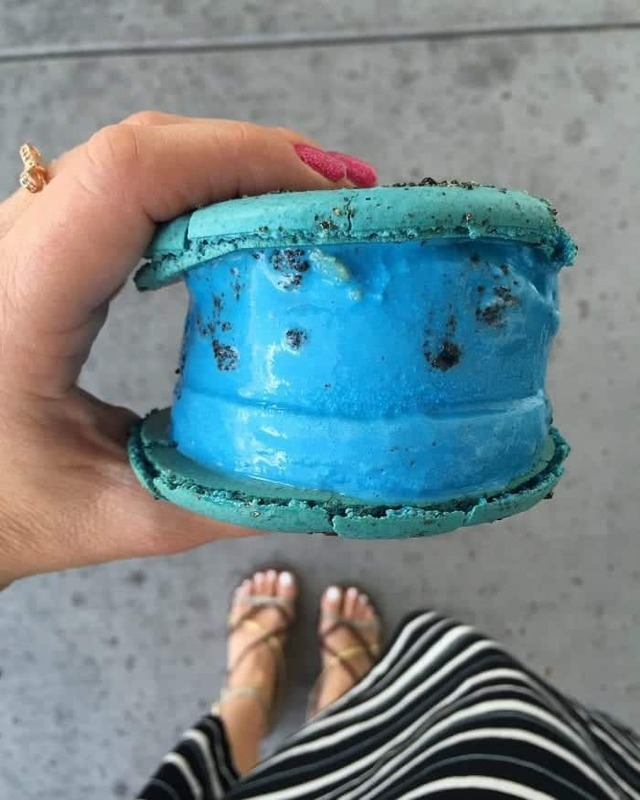 Not only that, but they make these awesome Macaron Cookie Cups. So much fun, this is a great place to visit. 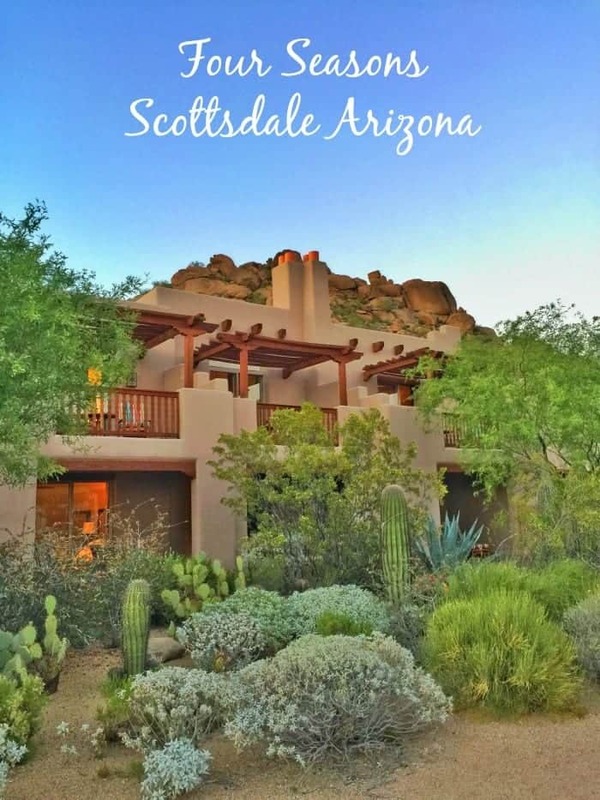 Also located in Scottsdale. 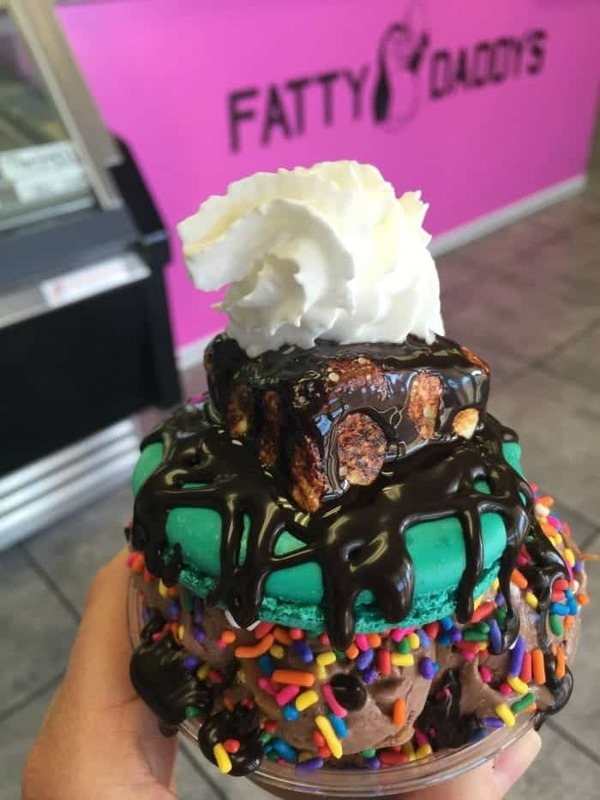 Another Fatty Daddy’s creation with Chocolate Peanut Butter Ice Cream and Coconut Macaron. Whoa. 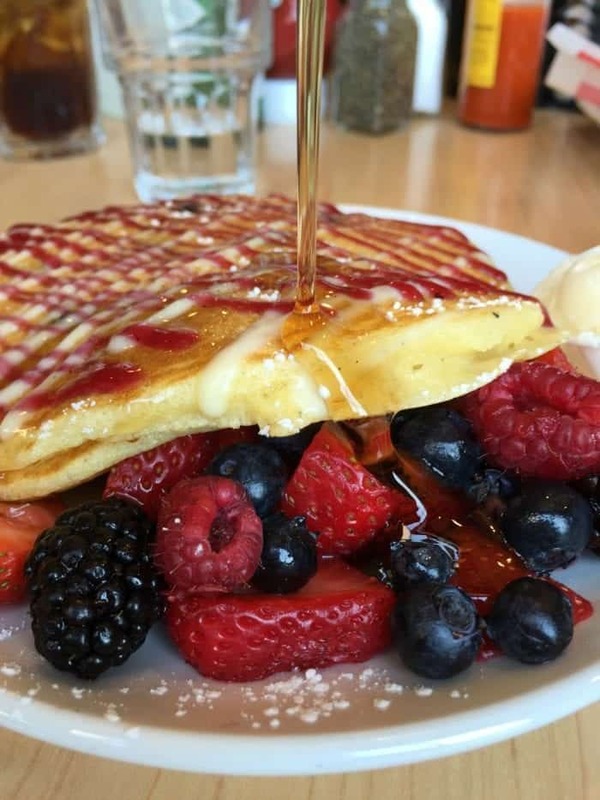 Another great breakfast spot is Snooze AM. 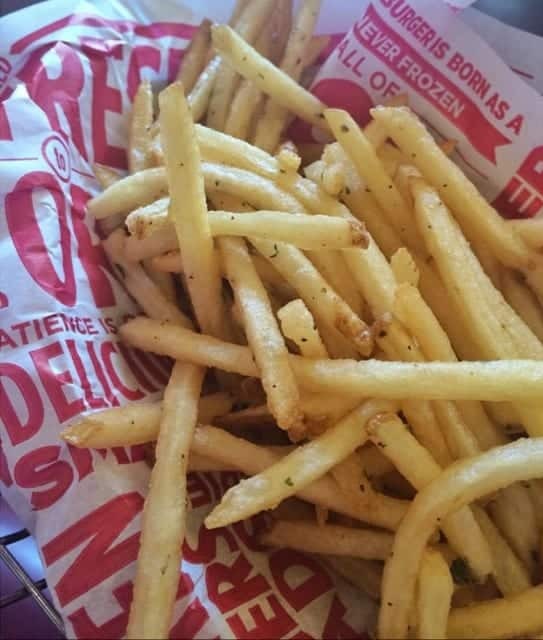 We usually go to their downtown Gilbert location. This is their Blueberry Danish Pancake which is by far my absolute favorite! Their egg scrambles and eggs benedict dishes are amazing as well. 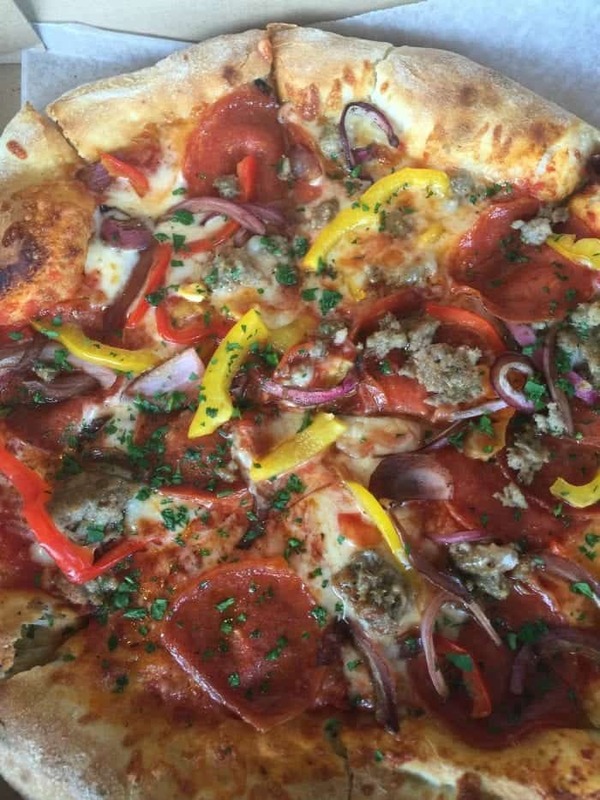 Sauce in Gilbert, Dana Park is a casual spot that makes an unforgettable pizza. Their salads are out of this world too. Awesome for lunch! Sassy’s in Mesa is such a cute cafe in Mesa, not only do they have breakfast and lunch options, their bakery case is to die for. 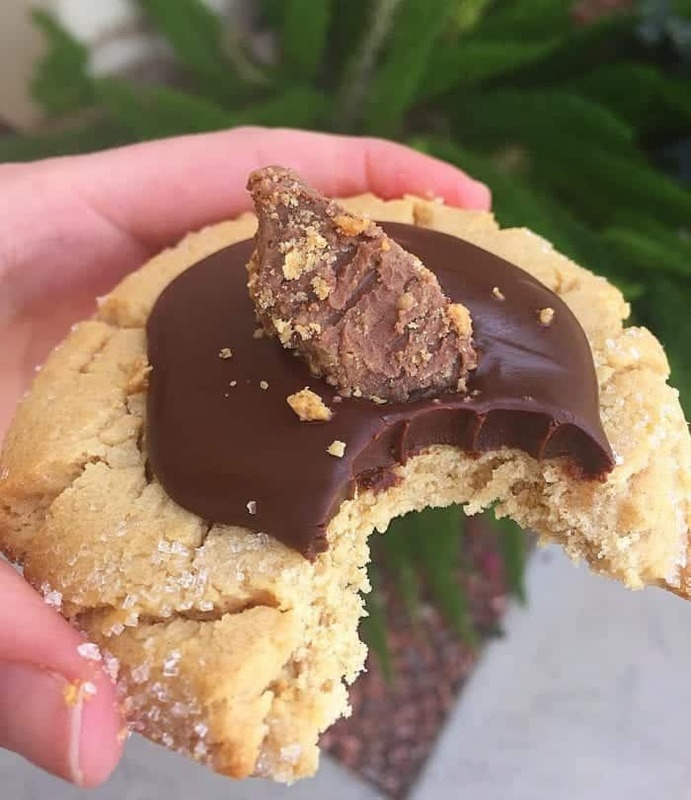 This peanut butter cookie with chocolate and peanut butter cup topping is my favorite! 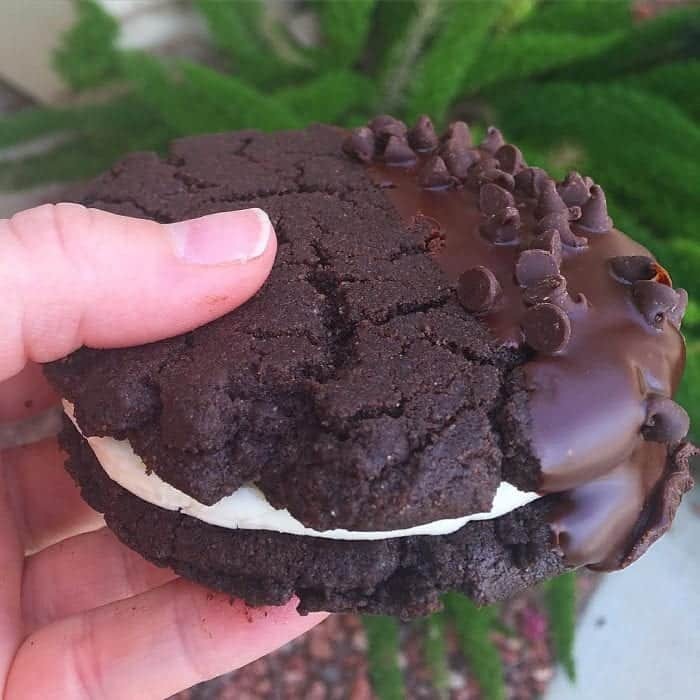 Another favorite from Sassy’s is this giant chocolate dipped chocolate sandwich cookie. Fantastic! 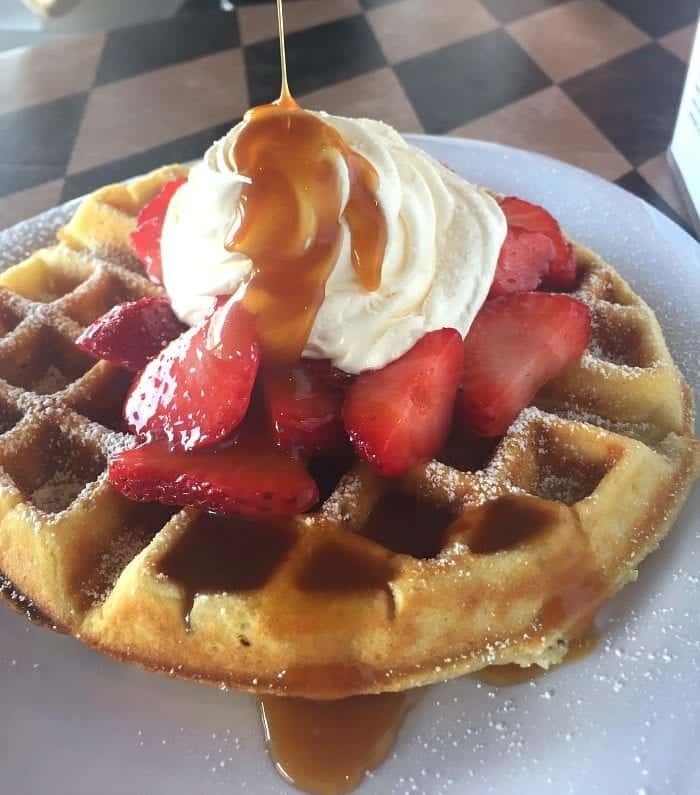 How beautiful is this Sassy’s Belgium Waffle?! That caramel-like buttermilk syrup should be illegal it’s so good!! 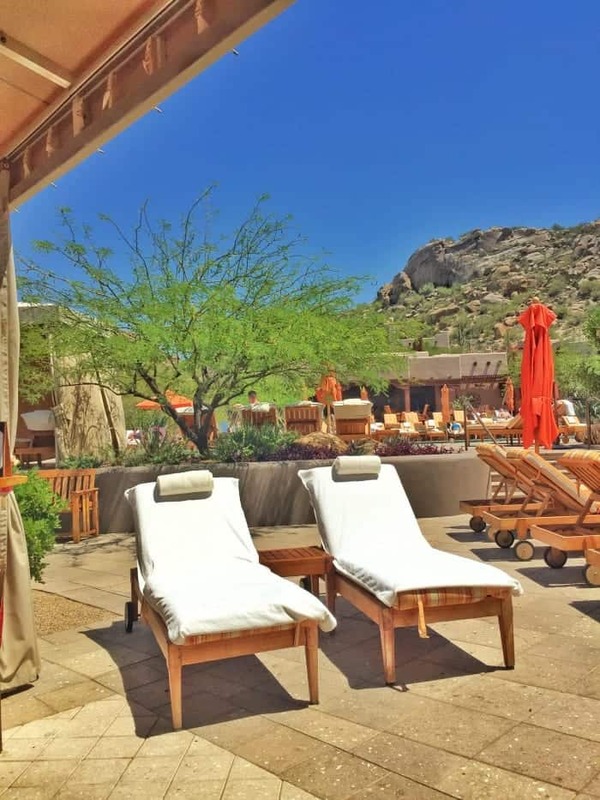 Four Seasons Resort in Scottsdale is one of my favorite places to visit. Not only are their grounds beautiful, their restaurants never fail to impress me. Proof is so great for weekend brunch, lunch or dinner…and look at that view?! We’ve visited on a number of occasions, here’s one of the plates I put together during a weekend brunch. Swoon! 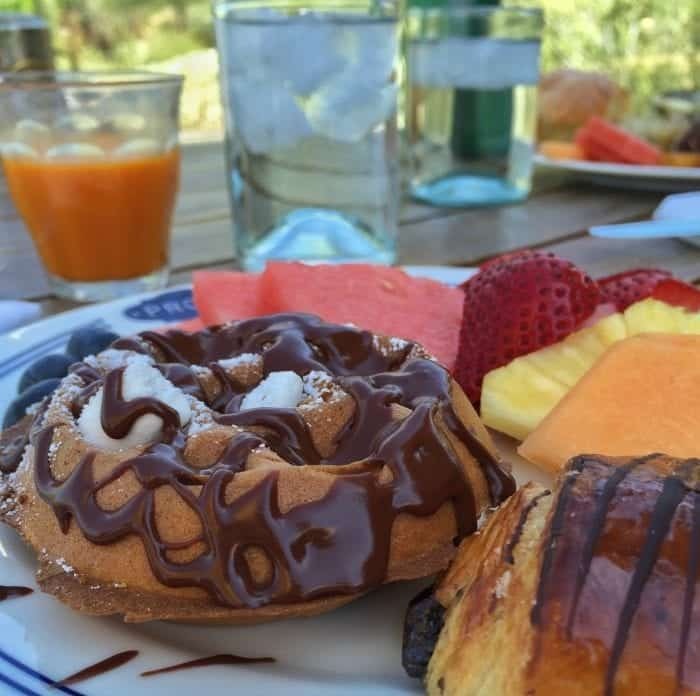 Fresh fruit, fresh juices, pastries, waffles, pancakes, eggs….you name it, they’ve got it. 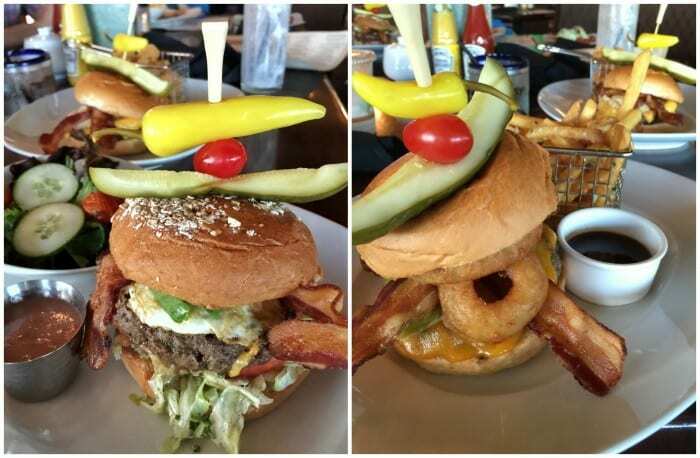 For lunch or dinner, Proof’s signature burger is out of control. Top it with an egg and watch the magic happen. 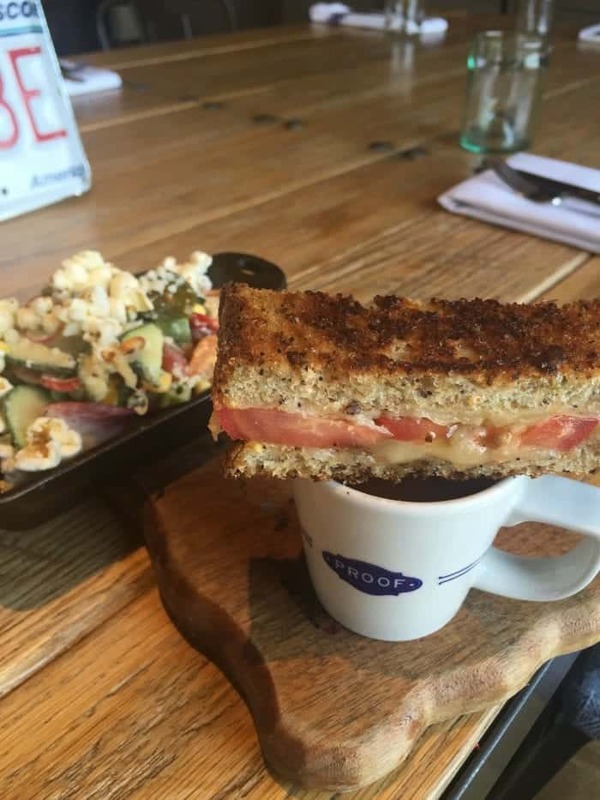 Their tomato soup and grilled cheese starter might be one of my favorite things ever. You’ve got to try it. 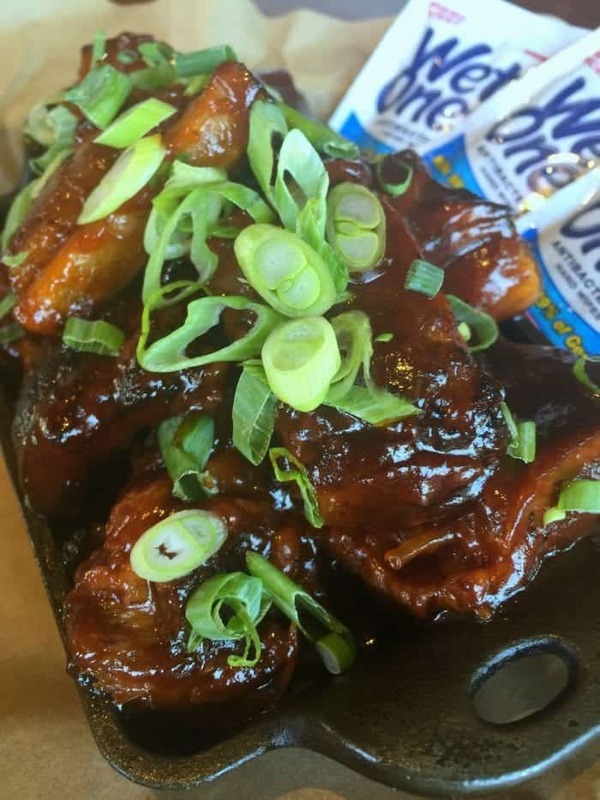 Their BBQ rib bites. An absolute must order. 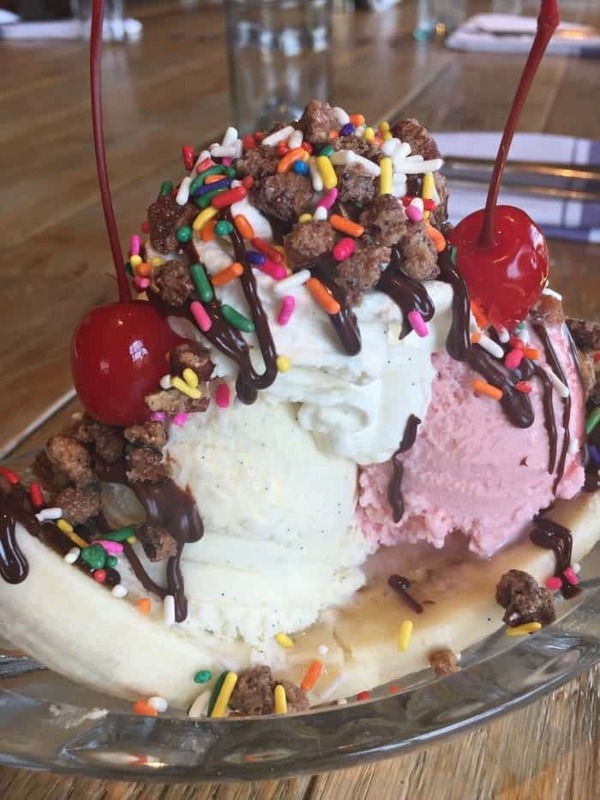 Their banana split….strawberry cake batter ice cream included. Amazing! 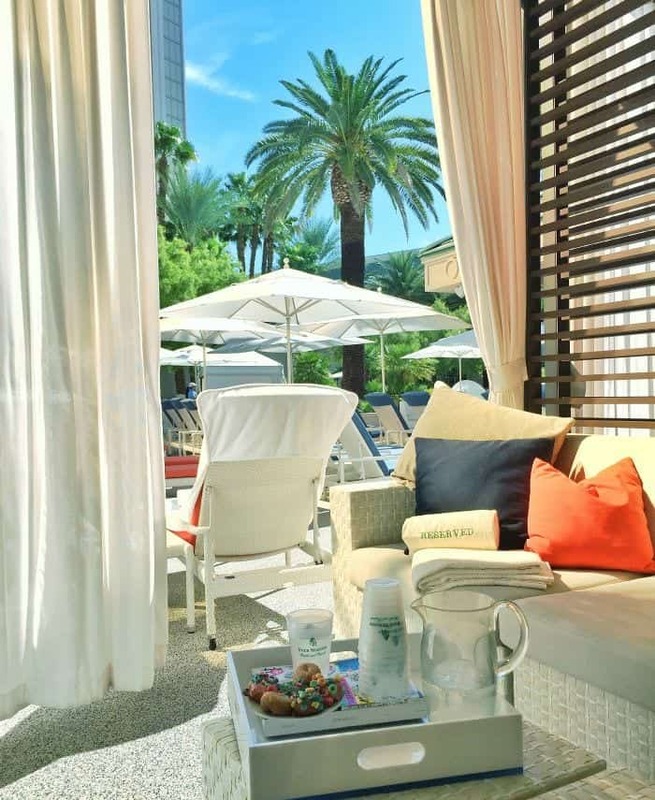 On a number of occasions, we spend the day at the Four Seasons pool under their cabanas. 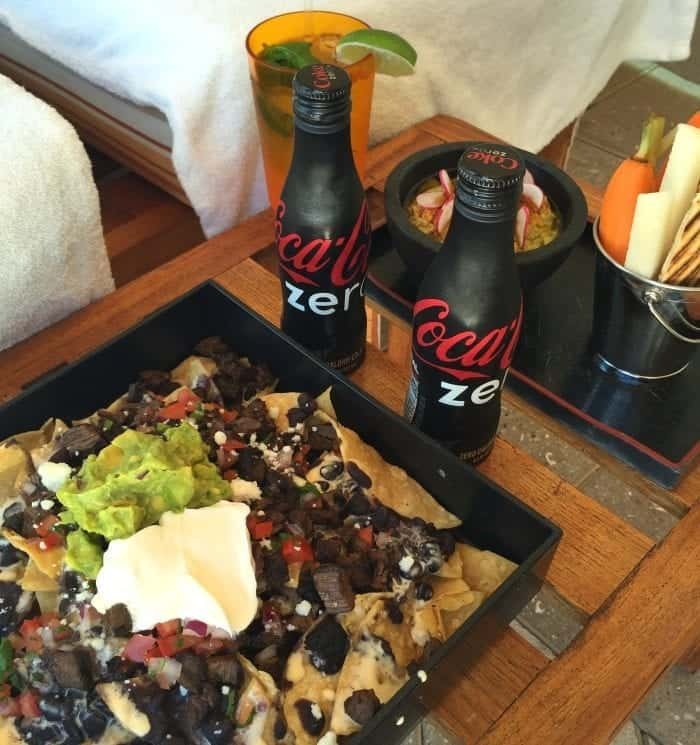 Not even kidding that these Carne Asada Nachos top the charts with some of the best nachos around. 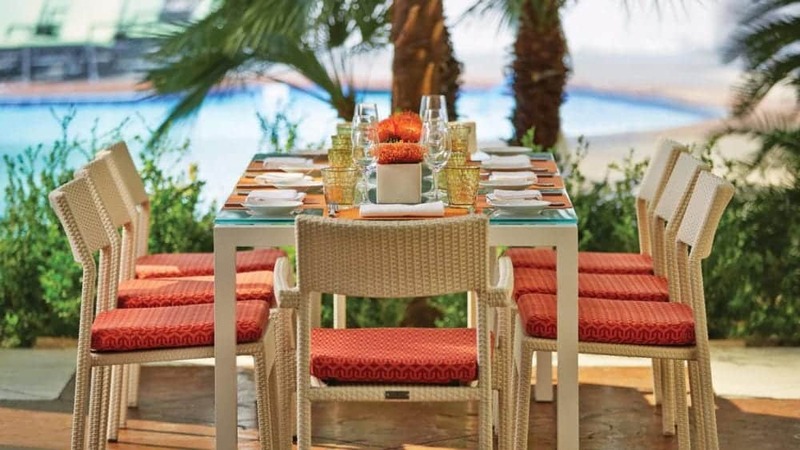 Not to be missed is Four Seasons restaurant Talavera. These buttery soft rolls in a cast iron skillet make everything ok in the world. Federal Pizza in Phoenix has some of the best pizza in the Valley. 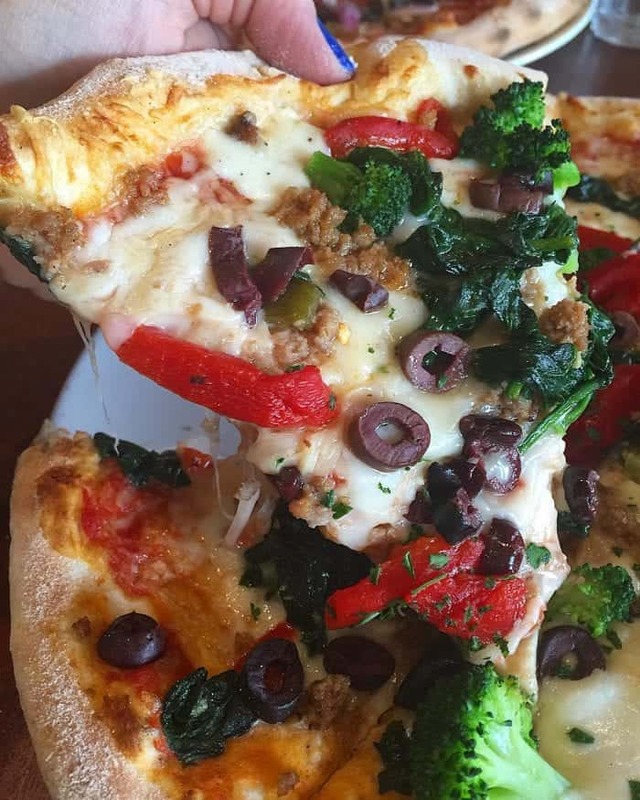 Wood fired ovens make for the tastiest pizza crust around! The Mission in Scottsdale is one of our favorite restaurants to visit when looking for a nice date night. Their food is always spot on. 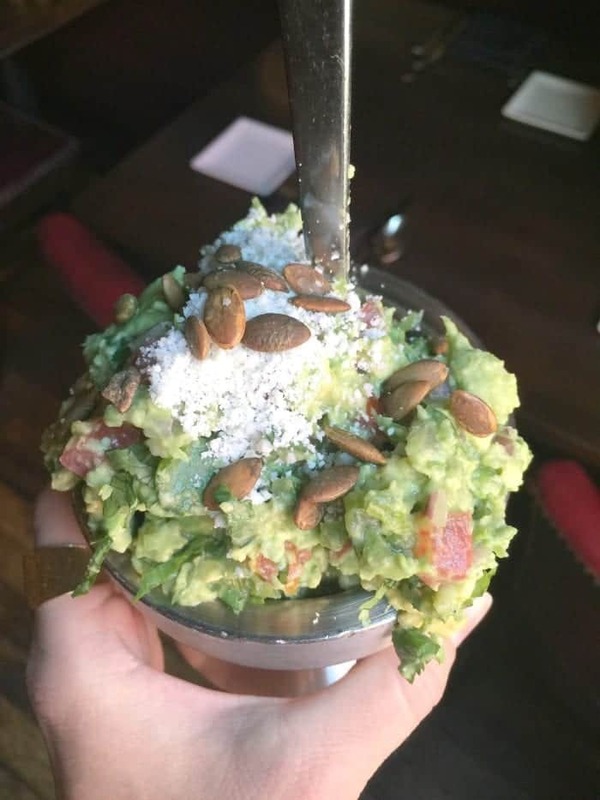 Their tableside guacamole can’t be beat! 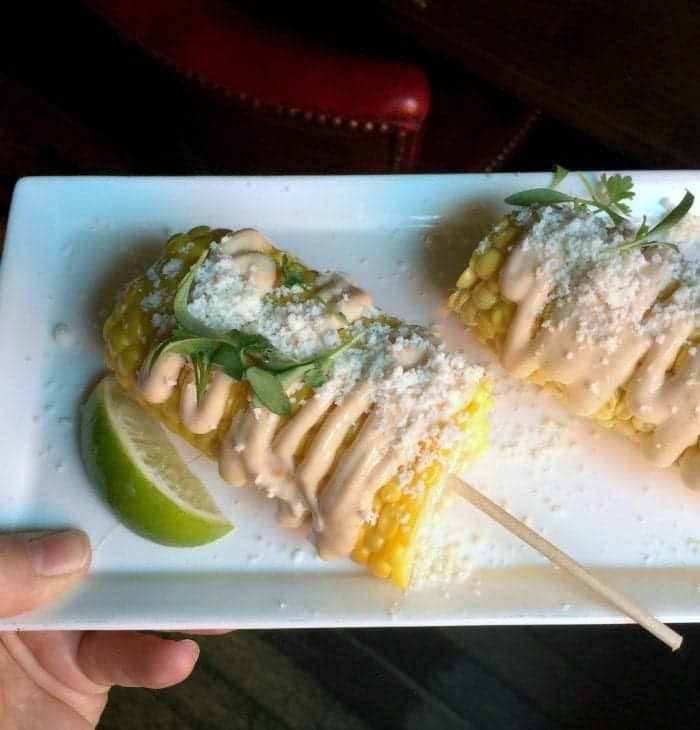 The Mission’s Street Corn. A must order. They’ll cut it off of the cob if you prefer to just enjoy it from a bowl. 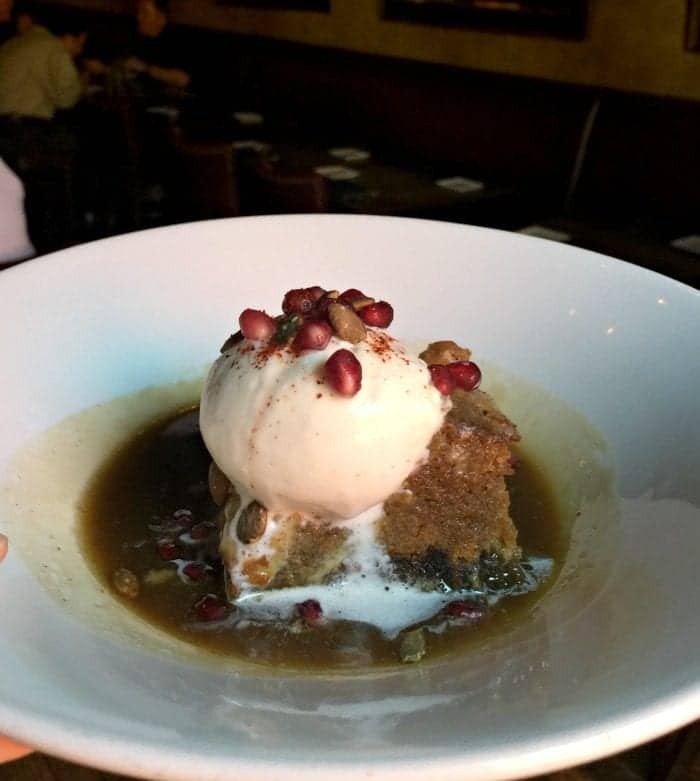 Their pumpkin bread pudding is so surprising. Doesn’t sound like much, but wait until you try it with the hot caramel and homemade vanilla ice cream with the soft pudding. One of my favorite desserts to enjoy. The Mission’s tacos are mind blowing. 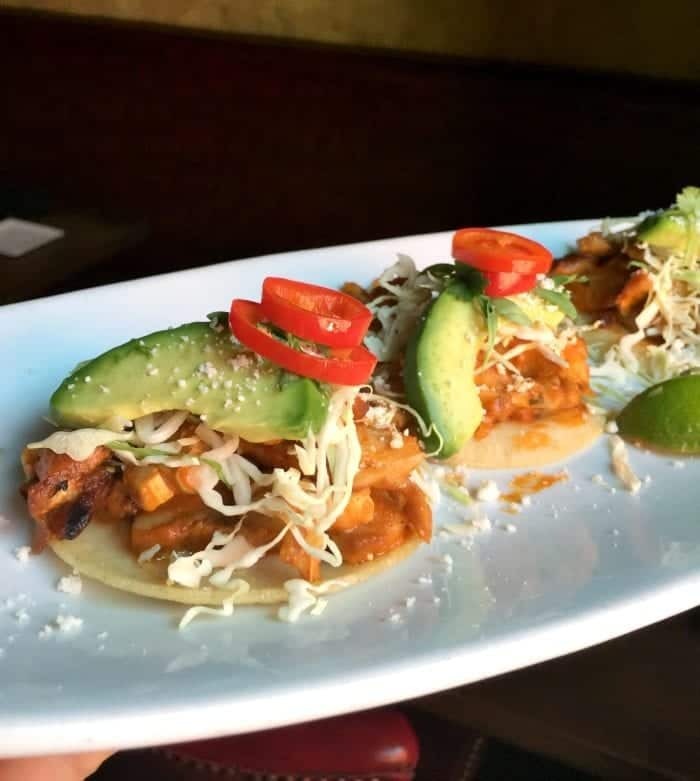 Here are the chicken tacos….so perfectly flavorful. 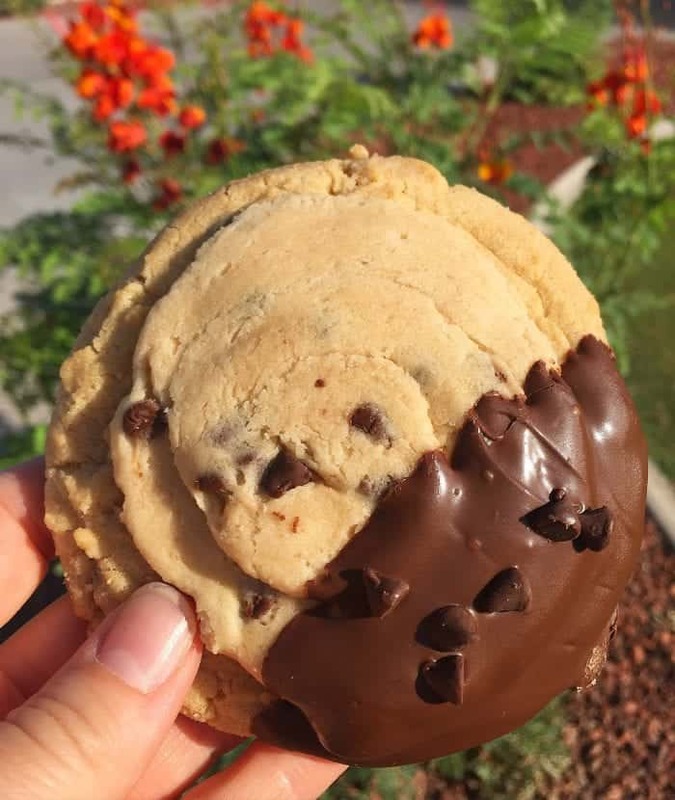 Another favorite dessert spot is Le Grand Orange aka “LGO.” The largest part of the location serves pizza however their bakery case is so beautiful with layered cakes, their signature salted chocolate chip cookie, cupcakes, bars, gelato and so much more. They also offer homemade English Muffins that will change the way you think about English Muffins forever. Their breakfast is pretty fantastic too. Not a whole lot of seating, so plan accordingly. 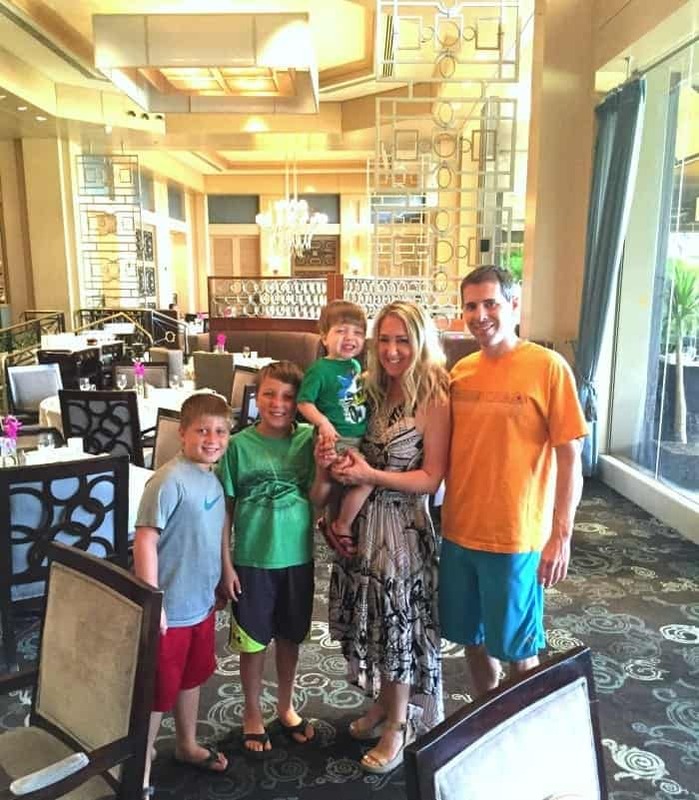 We had a lovely stay at The Phonecian last summer in Scottsdale. 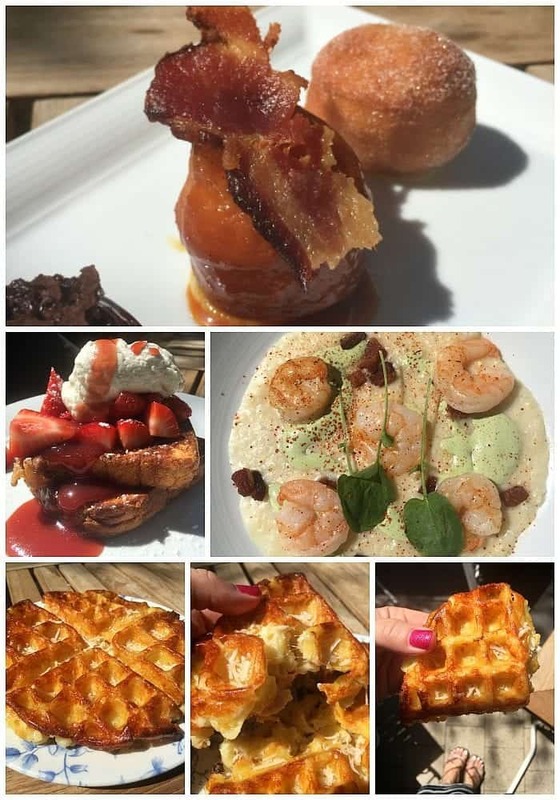 Their brunch was stunning and delicious. 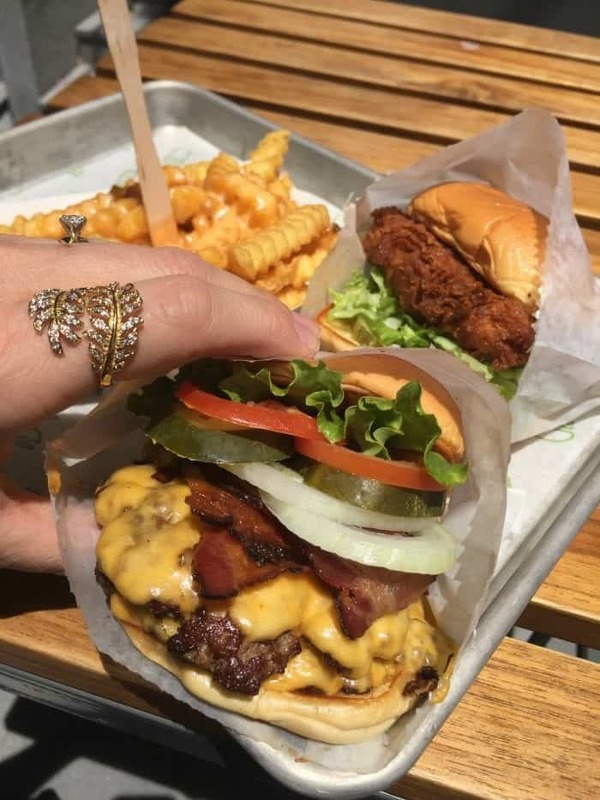 Can you even handle their burger? Pretty amazing! 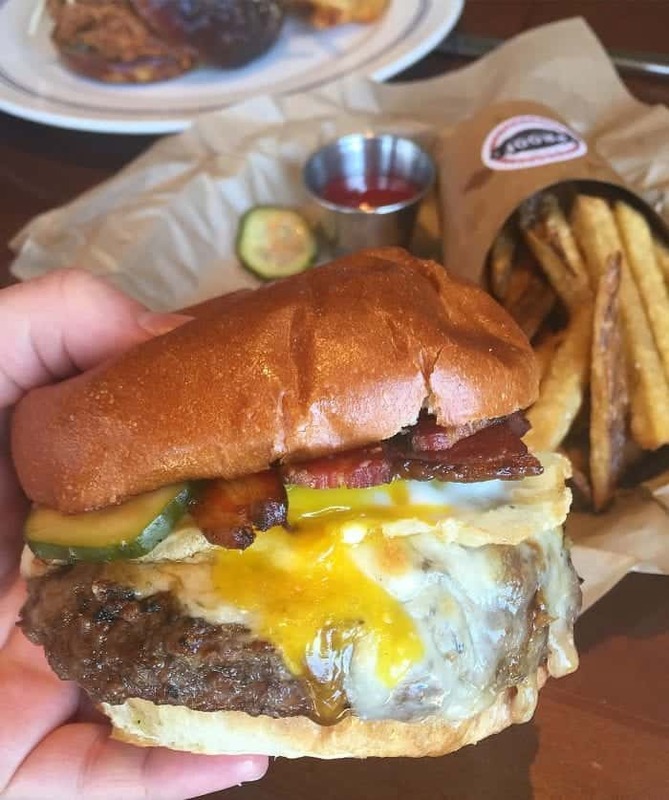 Relish Burger Bistro is a must! We had this do it yourself S’mores brought to the table. So incredibly fun with the kids! 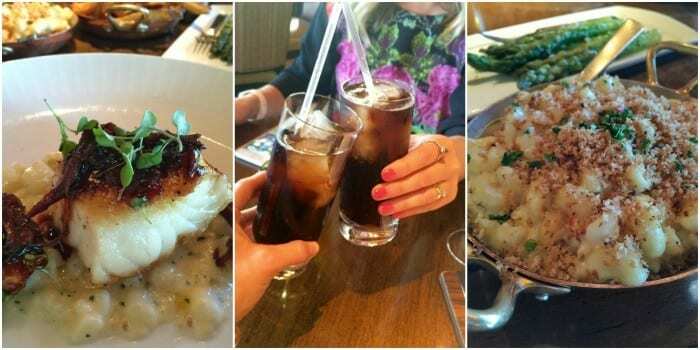 The Nordstrom Cafe in Scottsdale Fashion Square has always been one of my favorite places to get lunch and sometimes dinner! 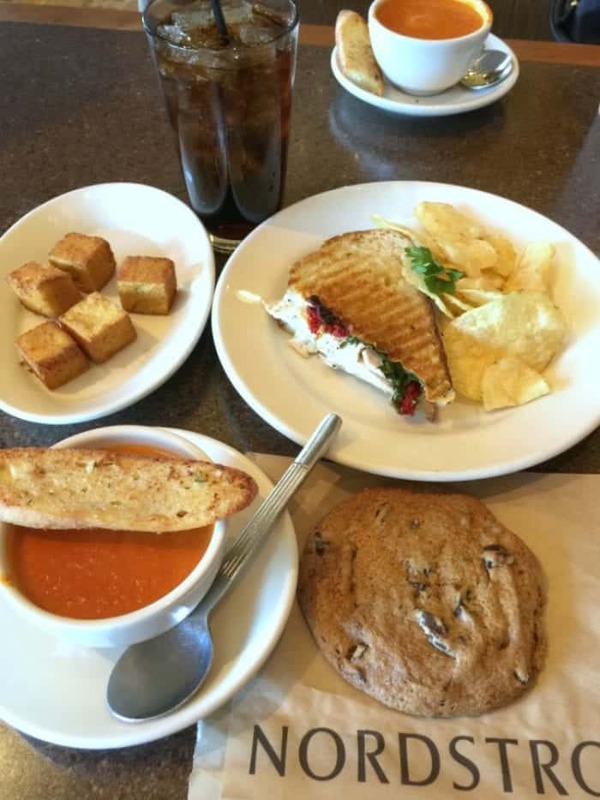 Amazing service, with some of the best soup and salads around…..the cookie is pretty unforgettable too 🙂 All of their baked goods actually. 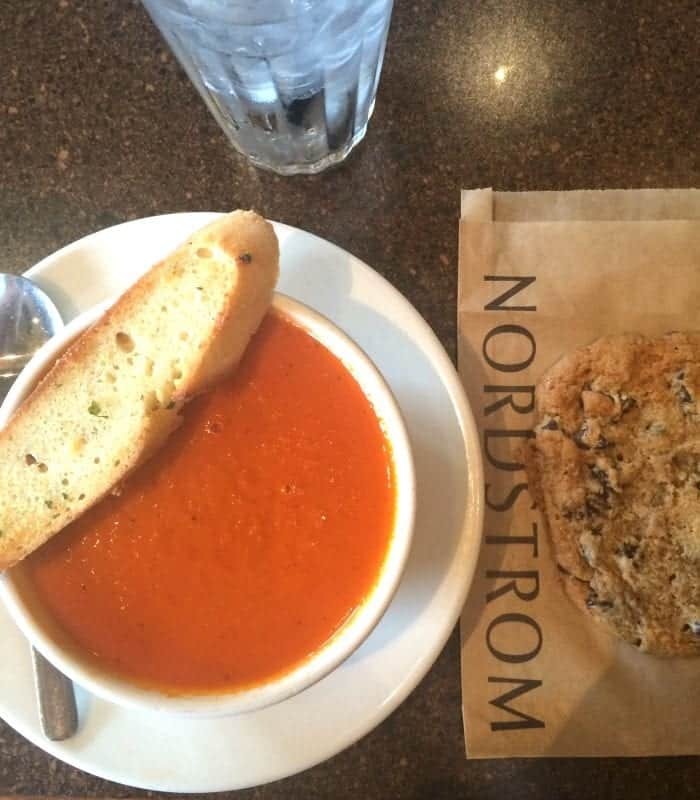 Nordstrom Cafe Tomato Soup….could eat this every single day. Don’t even talk about that cookie! Another favorite we enjoy for dinner for date night is St. Francis in Phoenix. 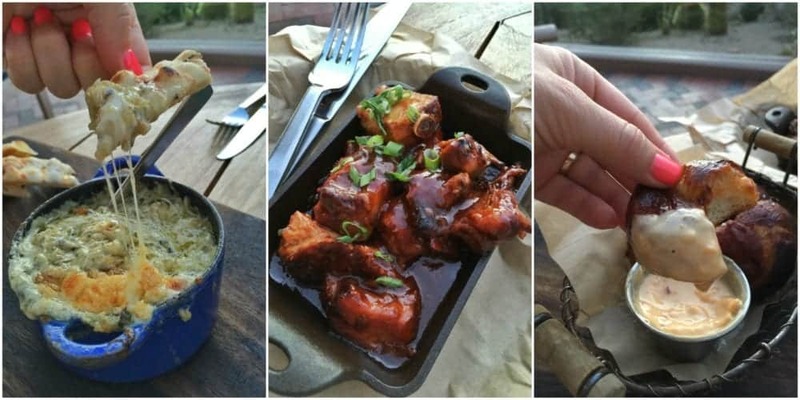 Gorgeous farm to table food, super cool restaurant vibe. Their signature burger is my favorite! Their appetizers are so lovely. 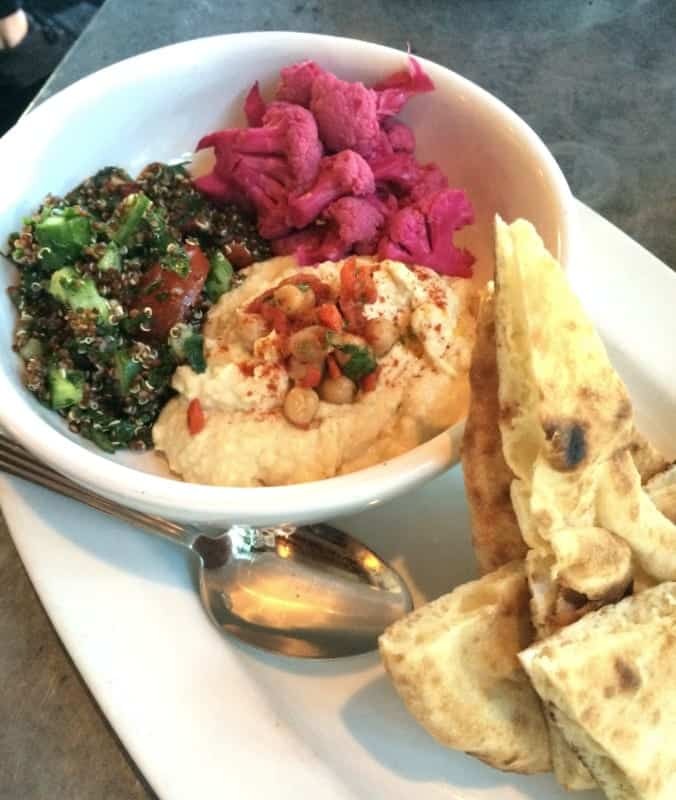 This hummus, pickled cauliflower and quinoa salad trio with pita bread is so great. 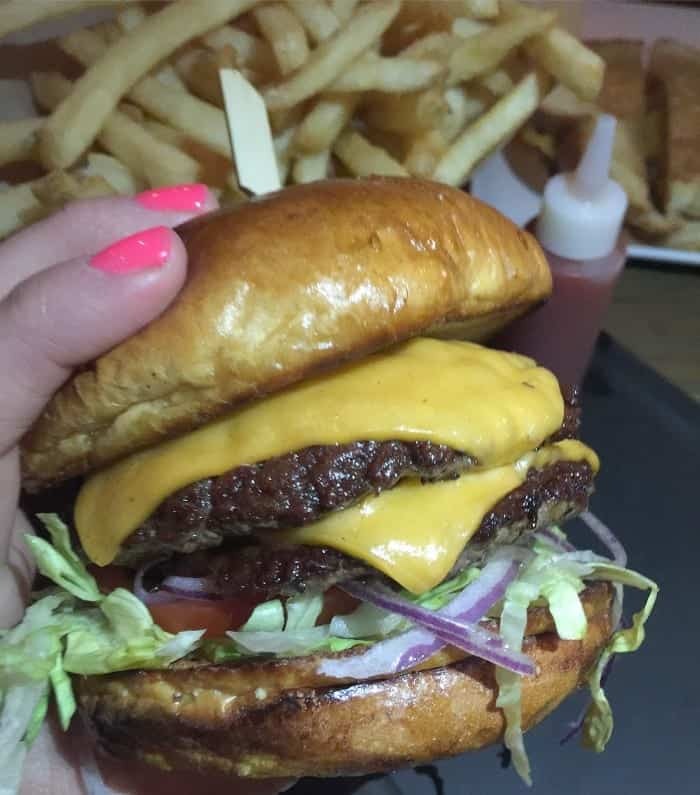 An inside shot of their burger. Yum!! 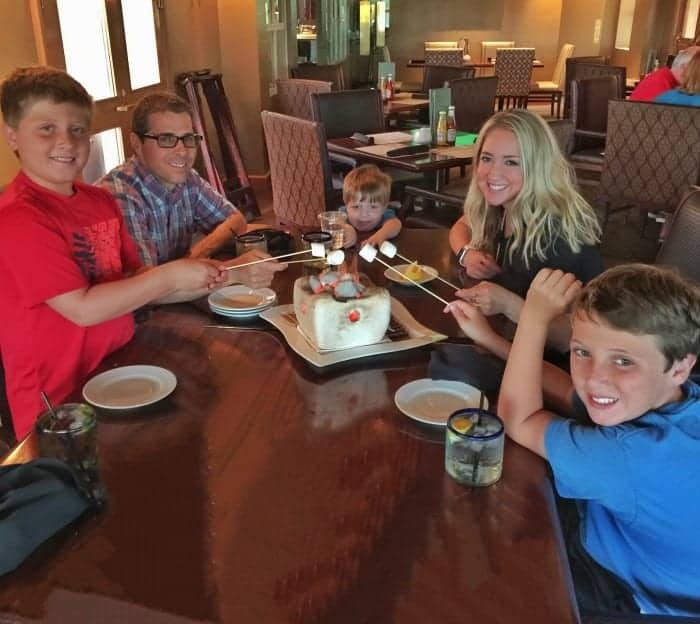 Sweet Republic in Scottsdale is an absolute favorite for ice cream. Look at this sundae! The Ultimate Sweet R Sundae. 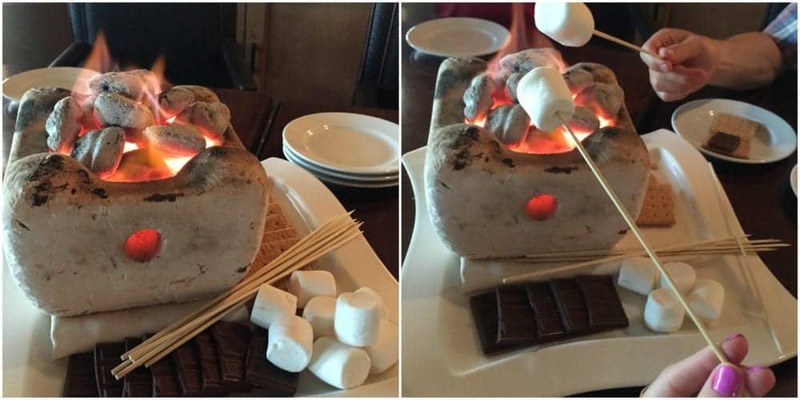 Look at that toasted marshmallow!! Their Toffee Banofi Sundae is to die for! 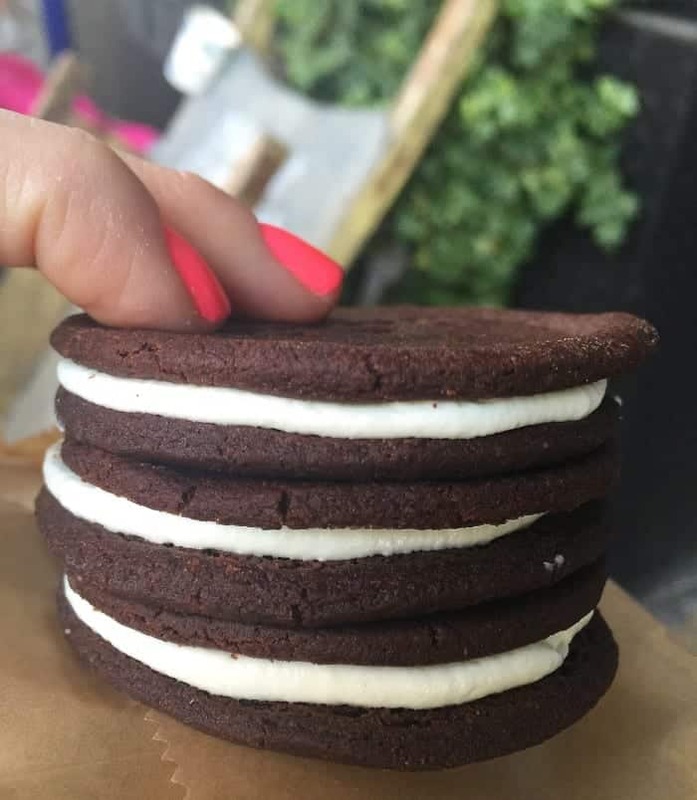 Their cookie ice cream sandwich makes my heart sing. I always get the peanut butter chip inside my cookies. Oh baby it’s good. Liberty Market located in Old Town Gilbert is such a great place for dinner and dessert. 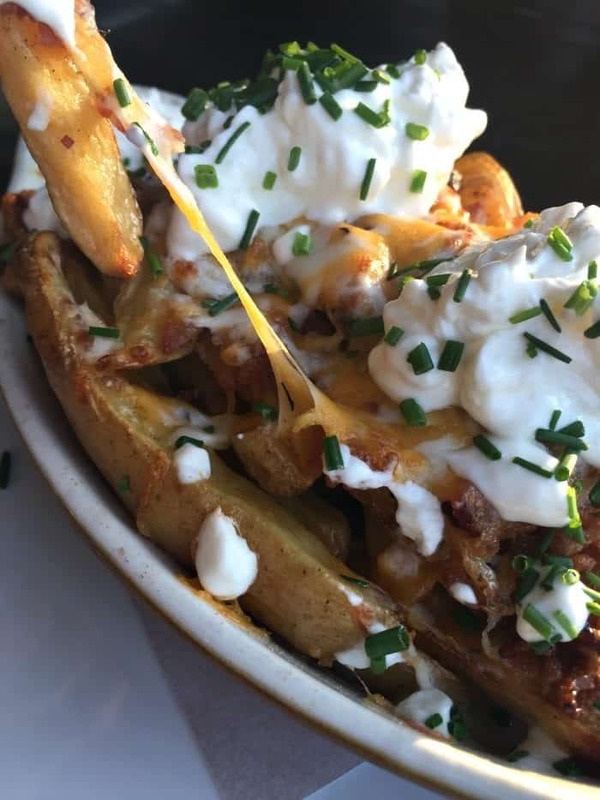 Look at these loaded Fingerling Potatoes! 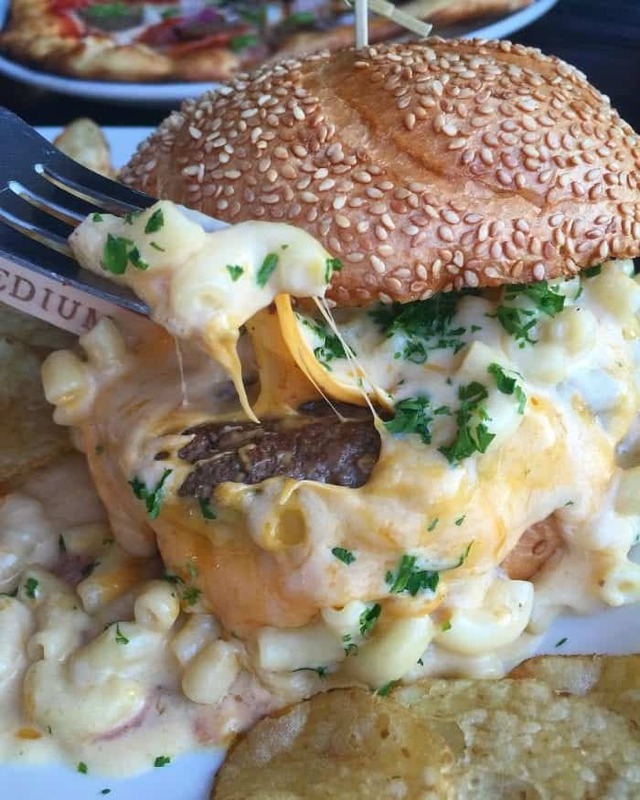 Now, this was a “special” burger of the week…the “Mac and Cheese Burger.” I have no words. It was as good as it looks. 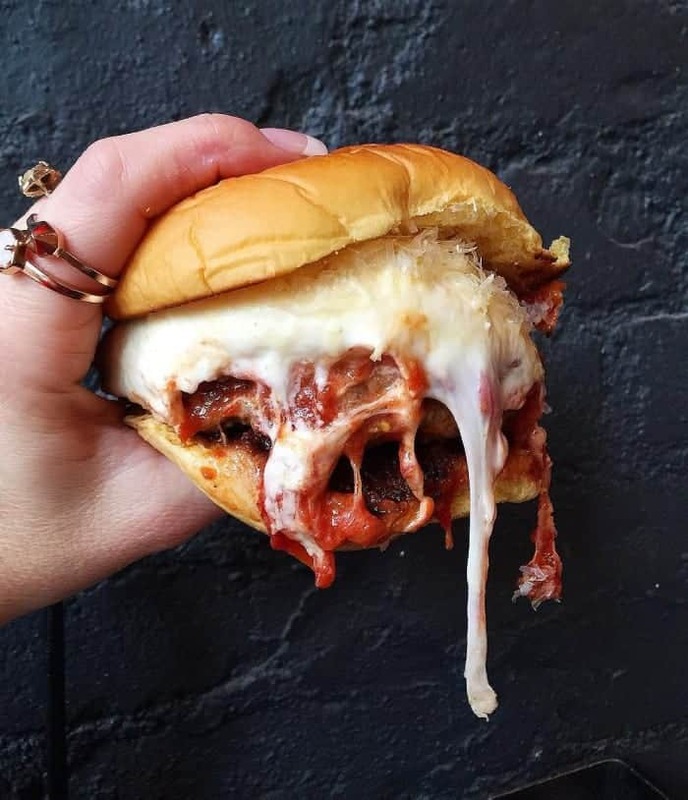 Liberty Market’s 6 Alarm Burger. Fiery hot and amazing!!! Worth Takeaway in downtown Mesa is a gem! 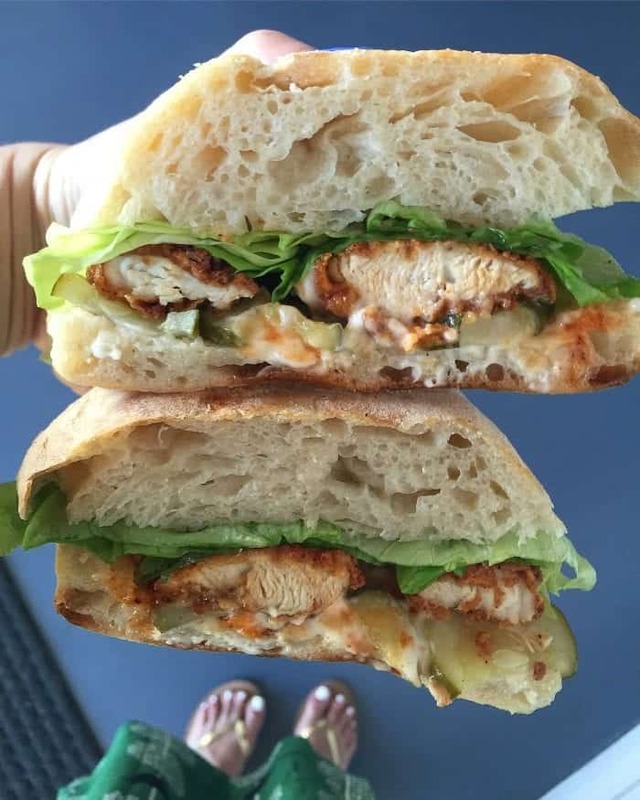 A small but quaint little cafe that serves up a great breakfast menu and beyond tasty lunch options including this Spicy Chicken Sandwich on Ciabatta! You’ll also find homemade pickles and some of the best caramels made from goat’s milk right by the register. Try them!! 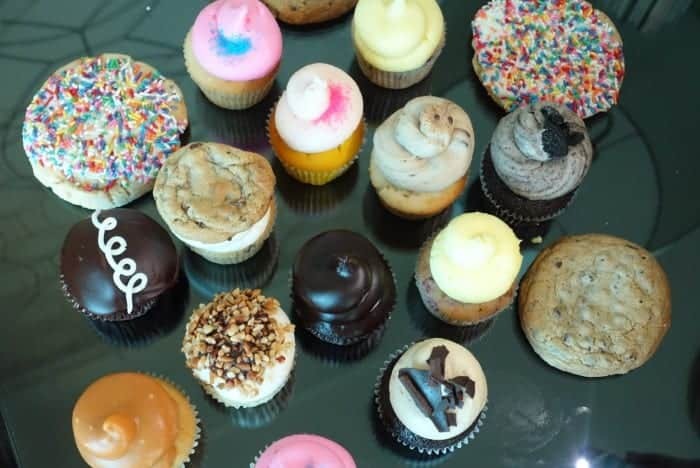 The Sweet Tooth Fairy in Gilbert has some of the most beautiful and delicious desserts around the Valley. 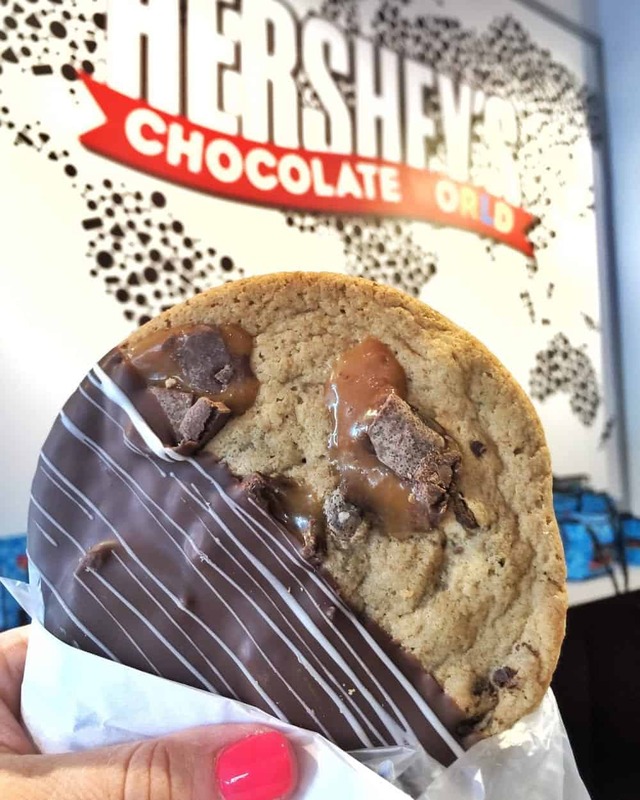 I mean, look at this Cookie Dough Chocolate Dipped Cookie?! 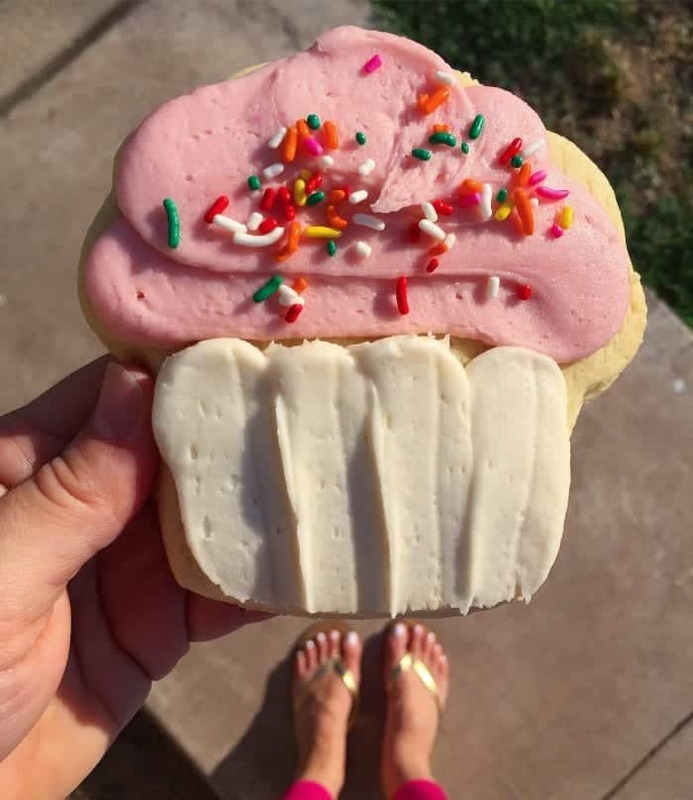 Another Sweet Tooth Fairy adorable sugar cookie. Love this one! Their cake bites and cupcakes are equally as great! Postino’s has a few locations around the Valley. 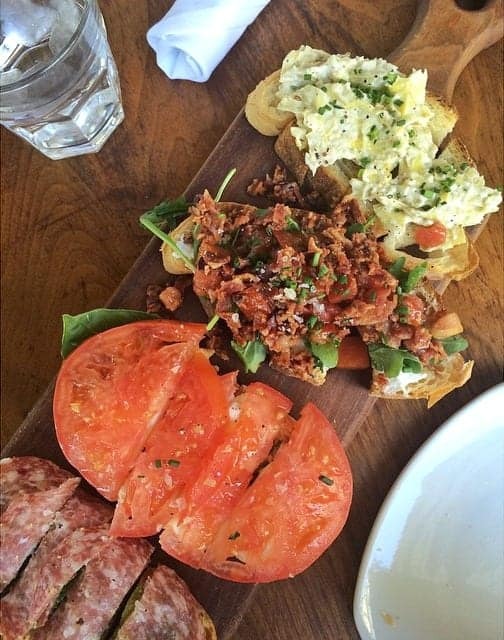 It’s worth going just for their Bruschetta Board alone. They’re all amazing! Love this place. 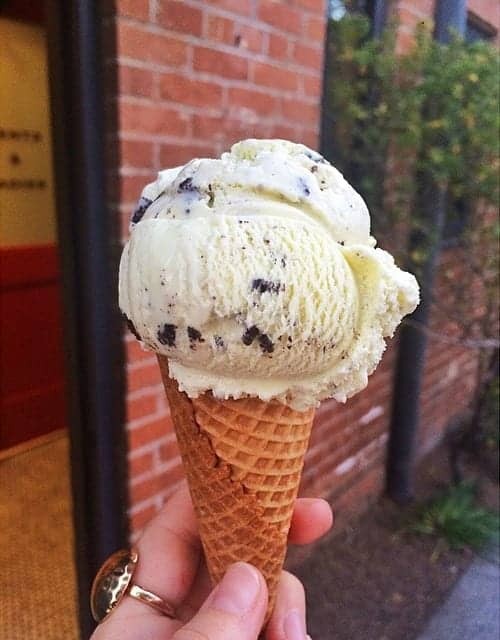 Churn in Phoenix for some of our favorite homemade ice cream. 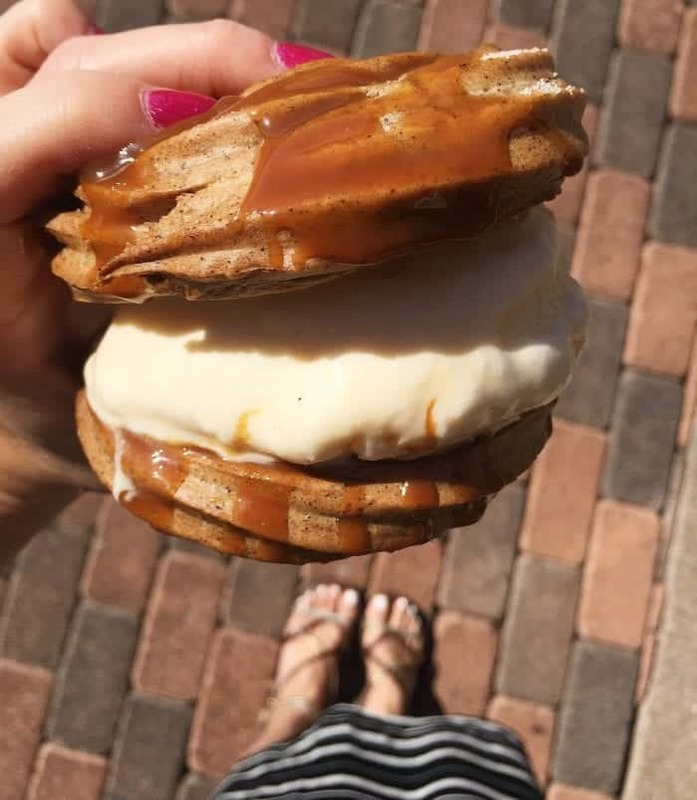 Their cookies and mint is one of my favorites on the planet 🙂 Amanda and I recently had their salted caramel cookie sandwiched with their madagascar vanilla ice cream. Crazy amazing!! Other favorites coming soon not photographed! 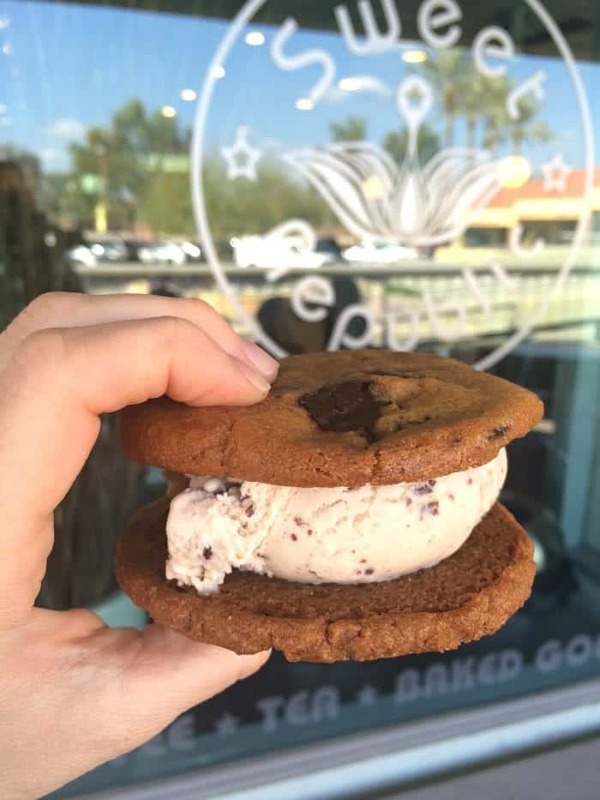 The Baked Bear in Scottsdale for extreme Ice Cream Sandwiches with cookies, brownies and doughnuts! Gadzooks for made to order enchiladas in Phoenix. 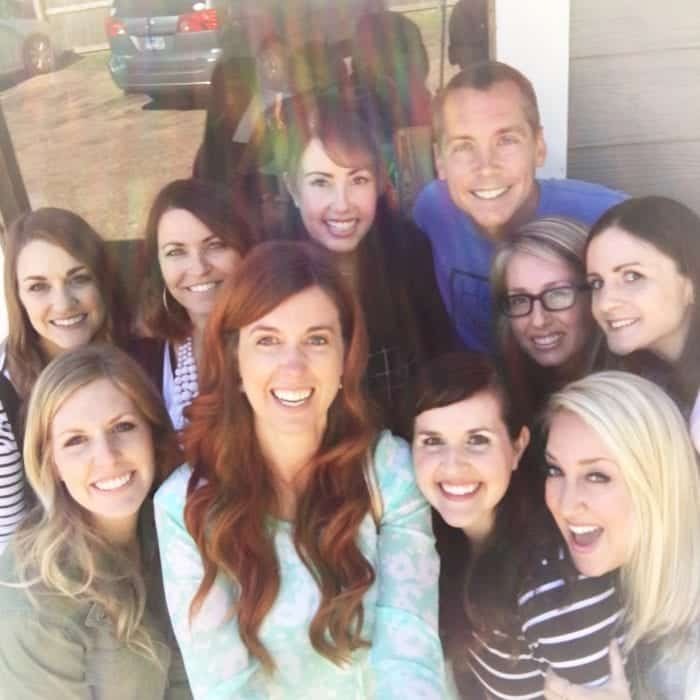 Our list is always growing, would love to hear your favorites around the Valley! 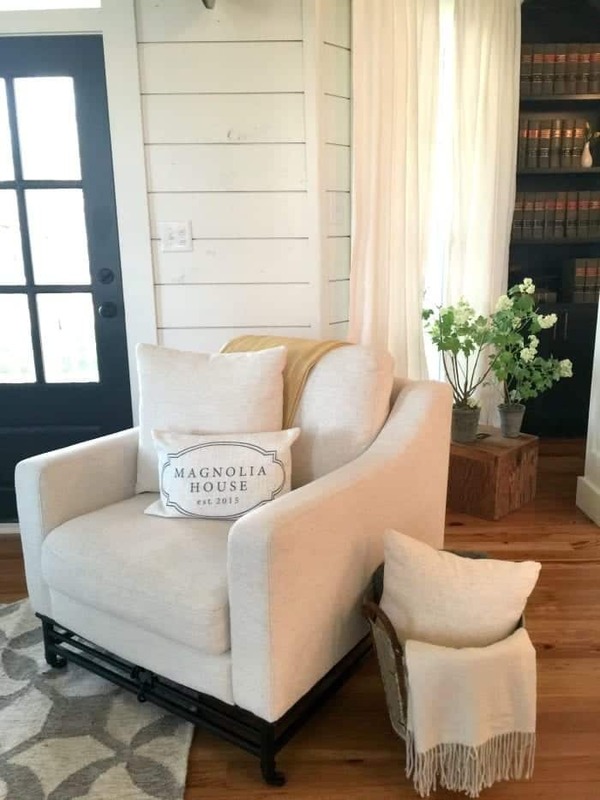 So excited to share my stay at The Magnolia House in Texas from a couple months ago. What a dream! 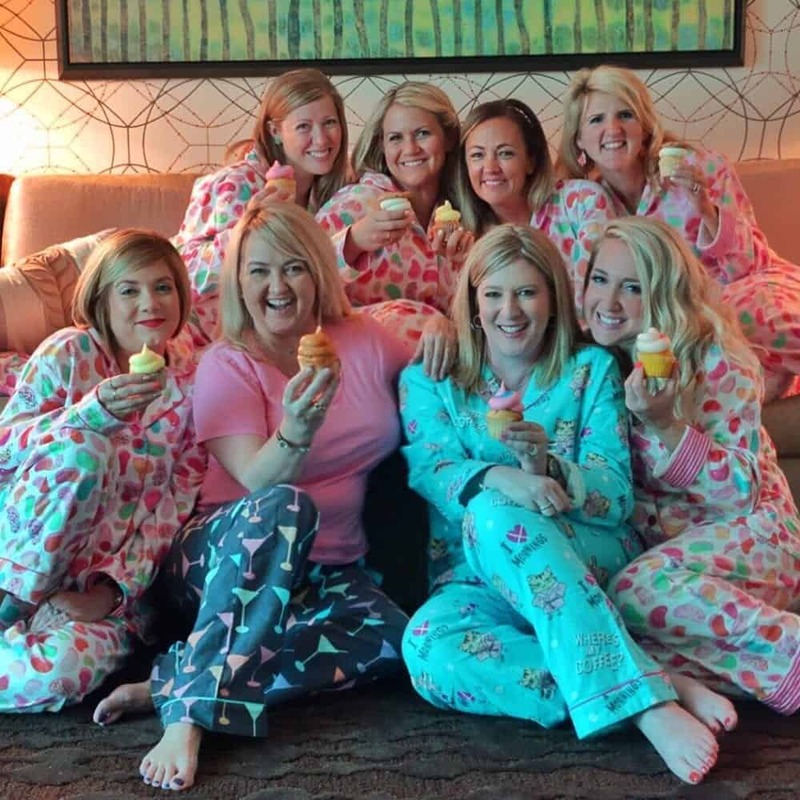 Left Top Row: Maria of Two Peas and Their Pod, Sarah of Pretty Providence, Me, Kristen of Six Sister’s Stuff, Kristyn of Lil Luna, Jennifer of Tater Tots and Jello. Left Bottom Row: Kelli of Lolly Jane and Kristen of Capturing Joy. 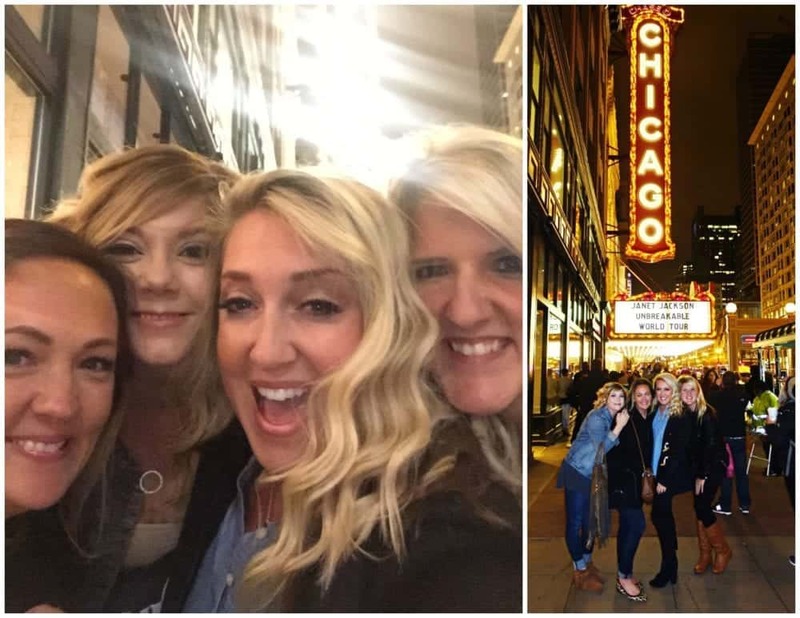 Had the best weekend with these talented ladies. 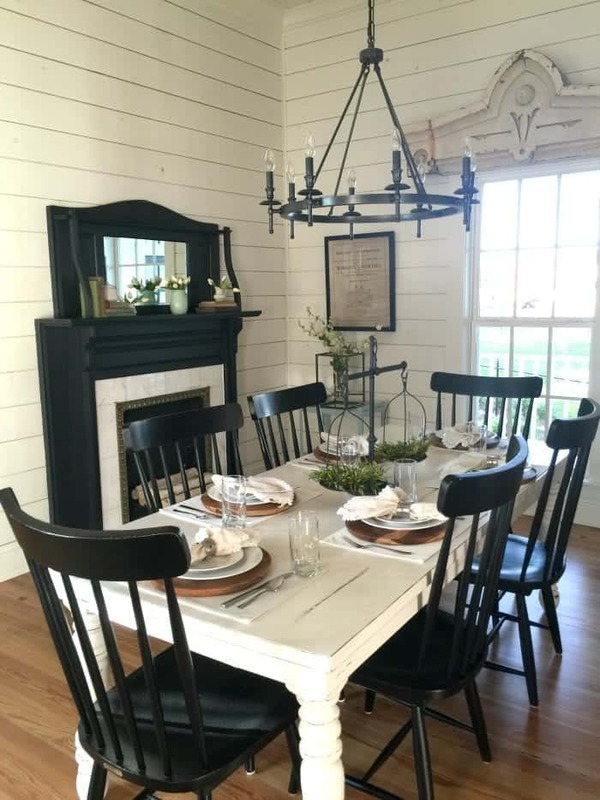 We were lucky enough to be able to stay in The Magnolia House which is next to impossible to get a reservation. I soaked in every second in this beautiful home and weekend! 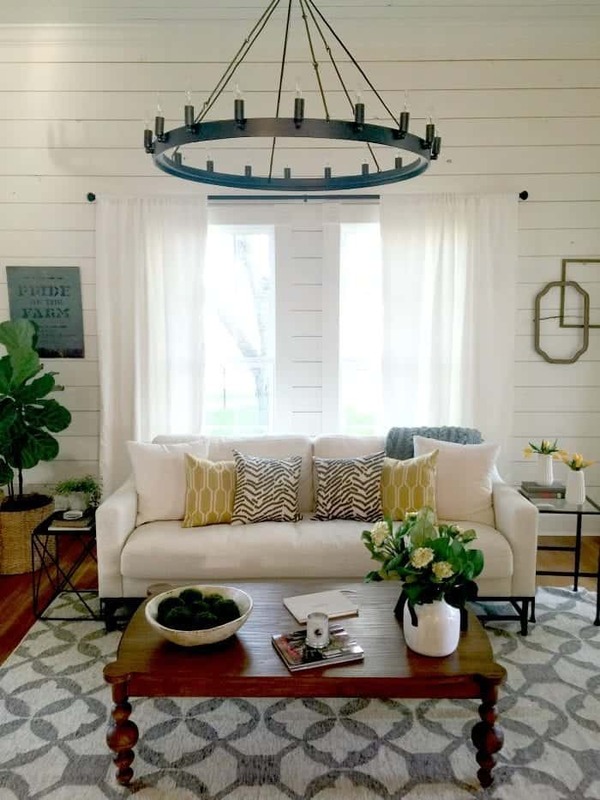 If you are a Fixer Upper fan, you know that Joanna Gaines has impeccable taste. There was no detail left undone. 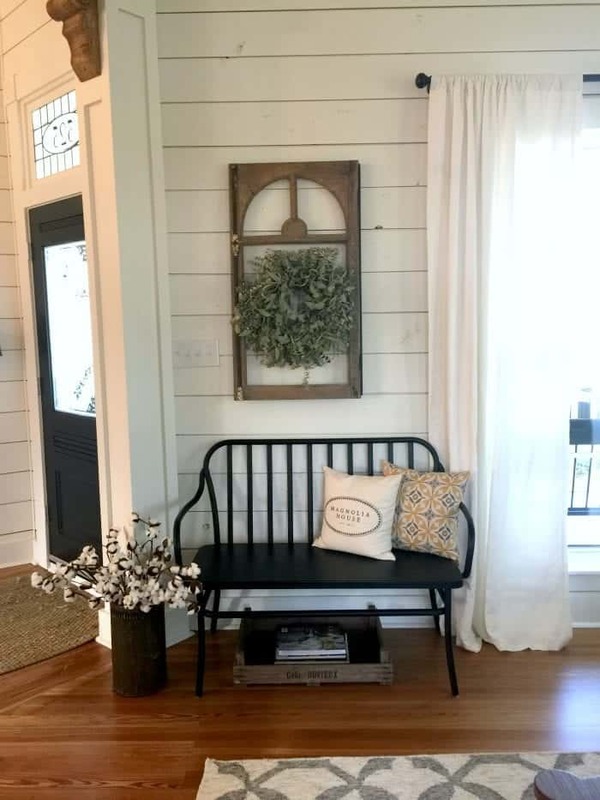 This little sitting area was near the front door. Love! This bathroom was so gorgeous. 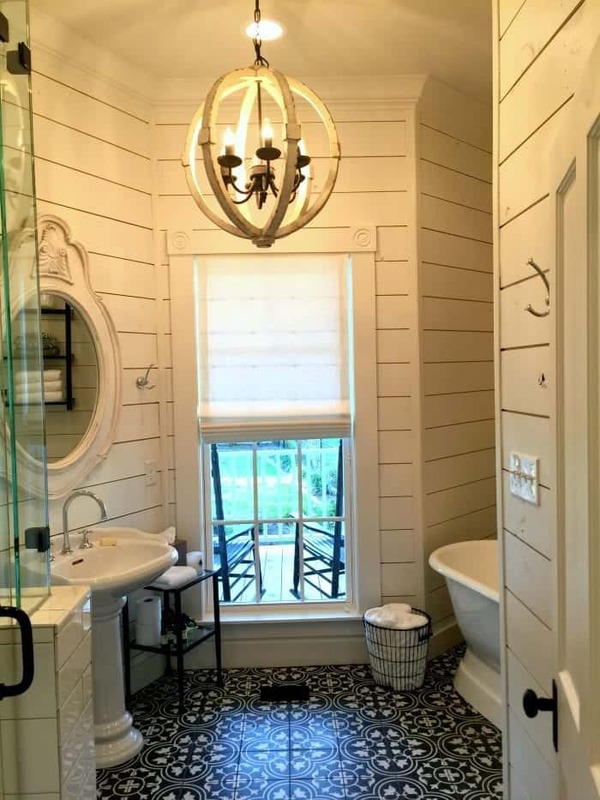 I’ve got to get this tile, so pretty! Bathtub area on the first floor. 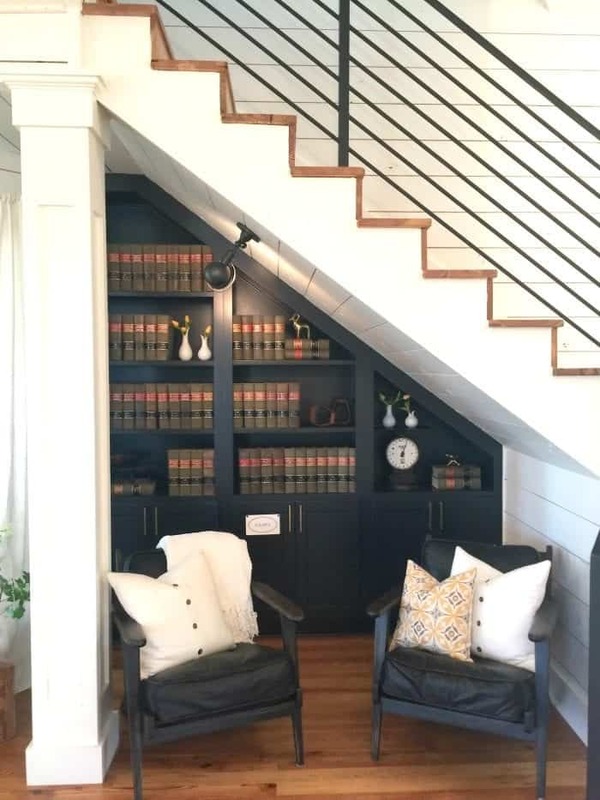 This reading nook on the first floor was one of my favorites, perfect. 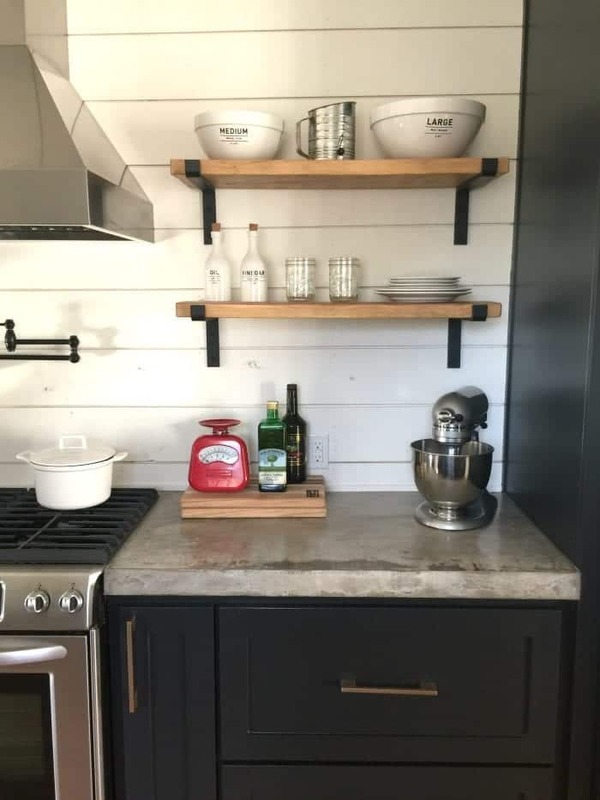 The kitchen was lovely. They had pastries for us in the morning we heated up in the oven. 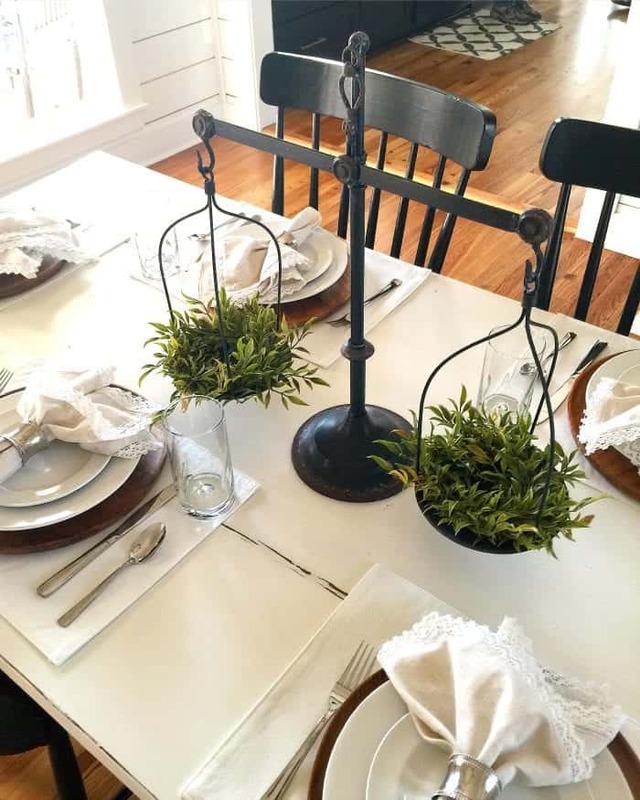 The dining room table perfectly set. 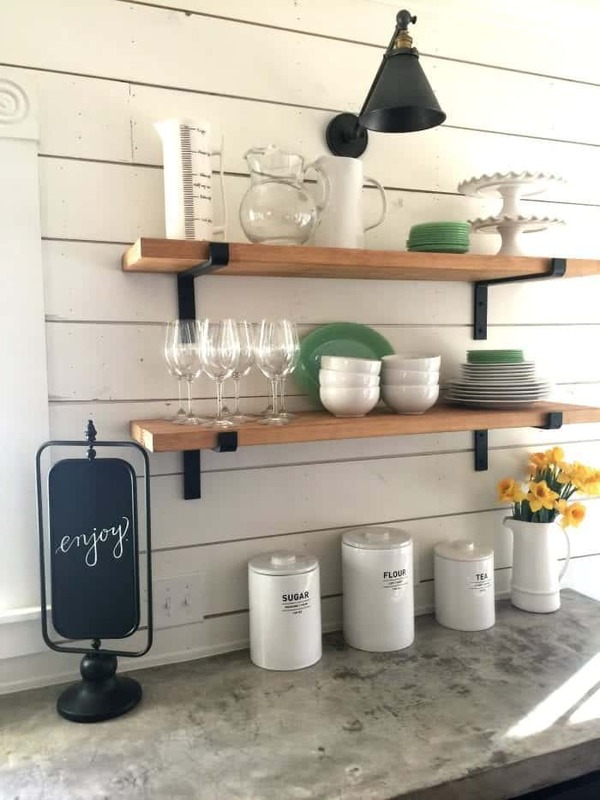 The kitchen shelves, love this look. Here’s the other side across from the sink. 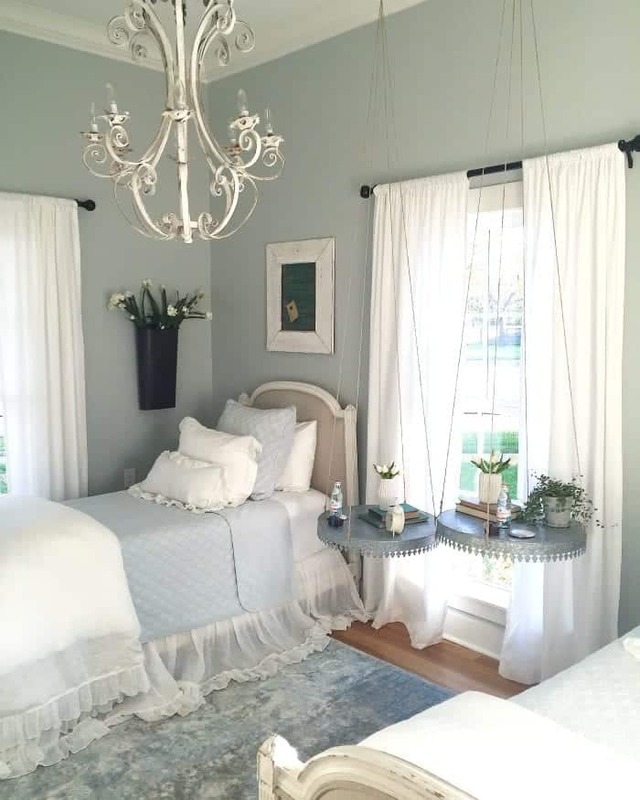 How dreamy is this bedroom?! I got to sleep in this one. The upstairs bedroom. 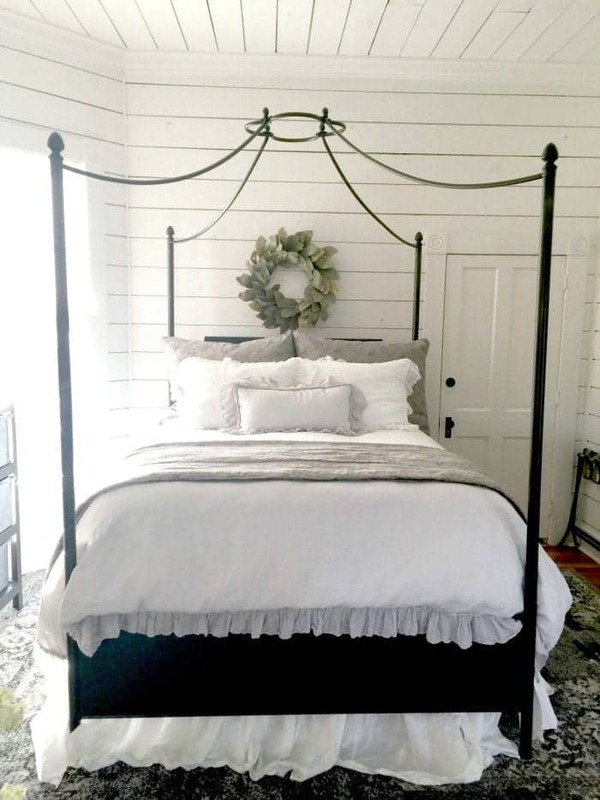 Can you even handle this canopy bed?! 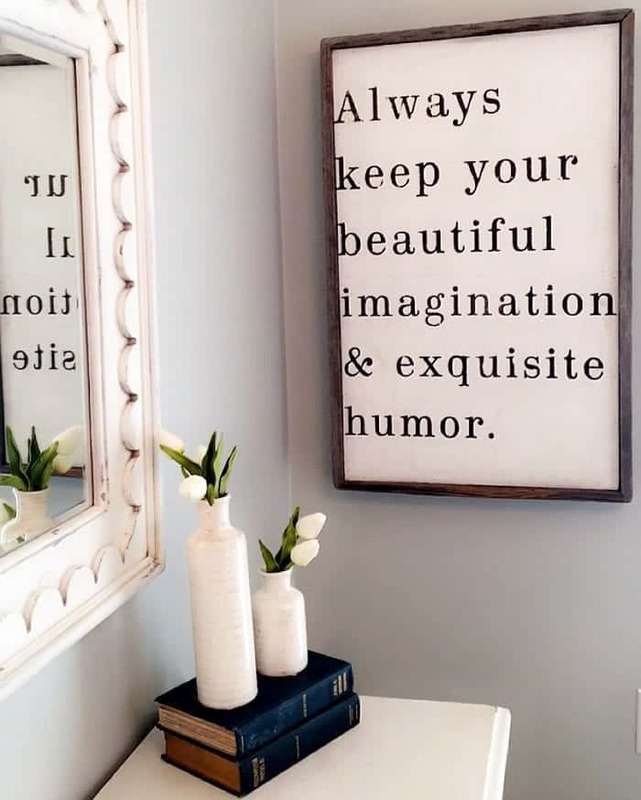 One of the corners in a downstairs bedroom. 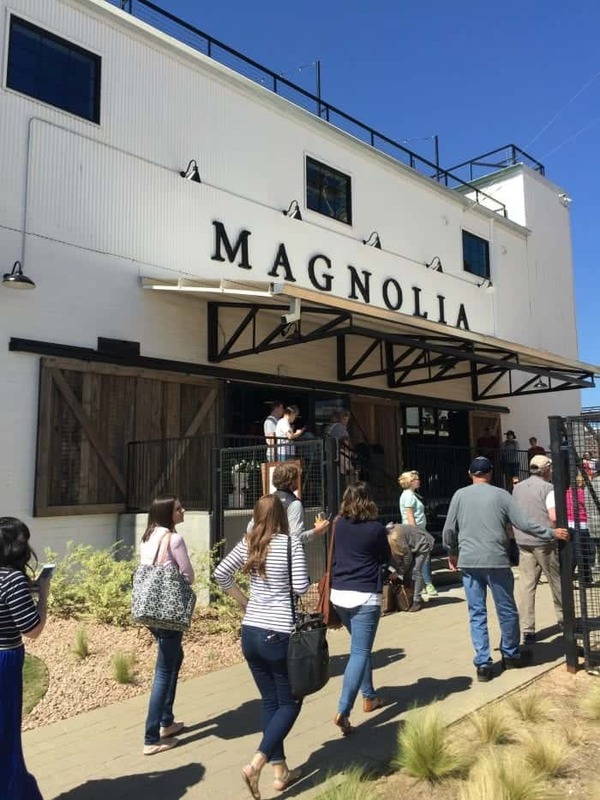 We were all so excited to go shopping at Magnolia Market. If you’ve been to Disneyland on it’s busiest day, times that by two and that’s what it was like inside, lol! Not even kidding. It was hard to even shop there were so many people around. I still had fun, but good grief there were zillions of people! On the rooftop of the Market. 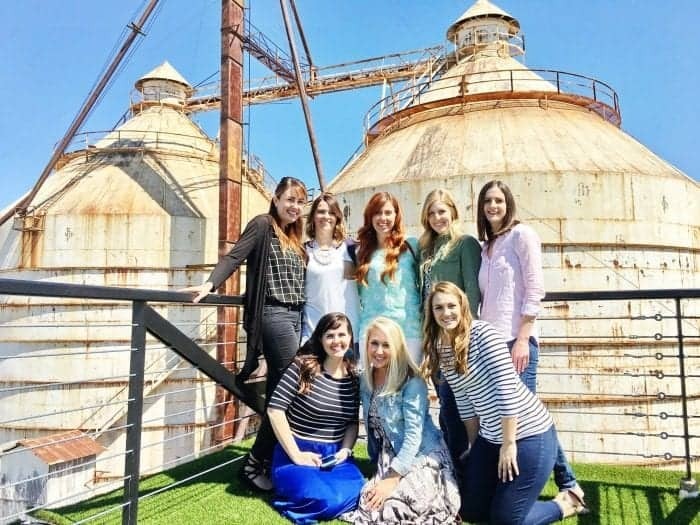 We were lucky enough to get a private tour and got to check out the view from the rooftop. 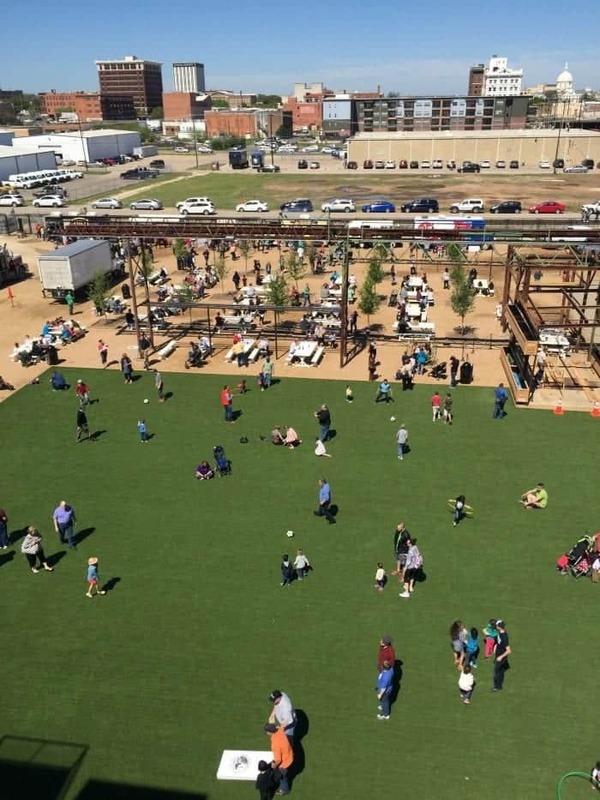 This is such a great place for families. Wish it were closer to AZ! Another highlight was getting to meet Clint and his wife at their shop. Harper and Co. Great times! 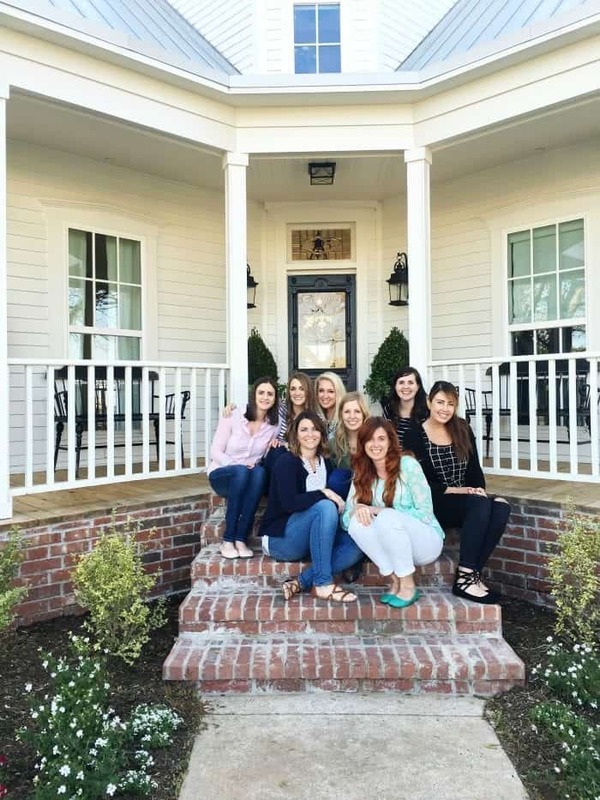 So grateful I got to spend time with these ladies at the Magnolia House. Sharing Best Food in NYC! 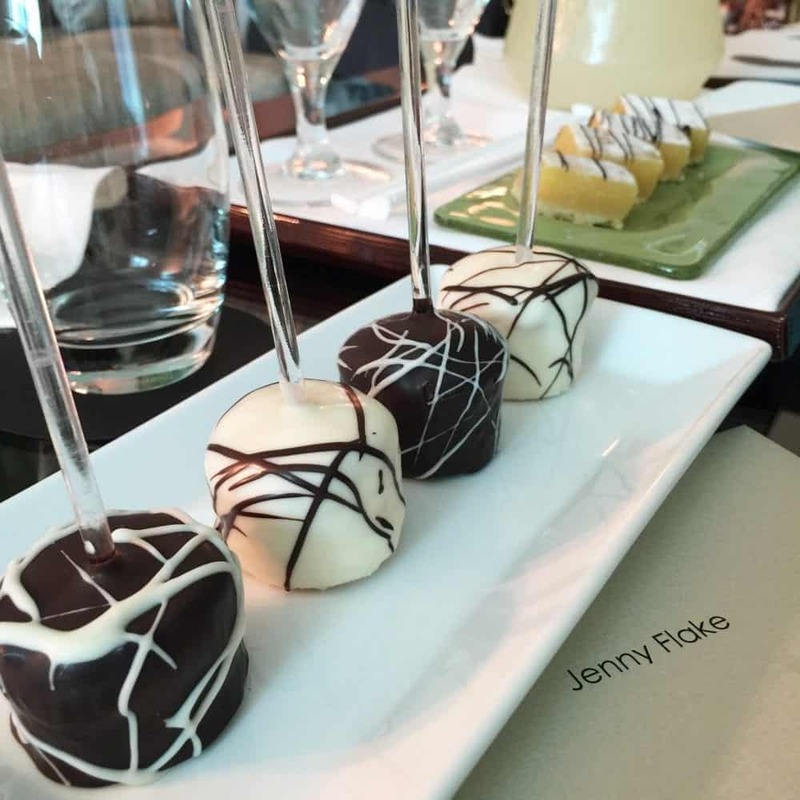 New York City Weekend For Foodies! It’s no secret that NYC is one of my all-time favorite cities to visit. Everything about it just makes me so happy. The food, the views, the energy. It’s contagious. Had a blast putting together my favorite eats over the last few years. Hope you enjoy! 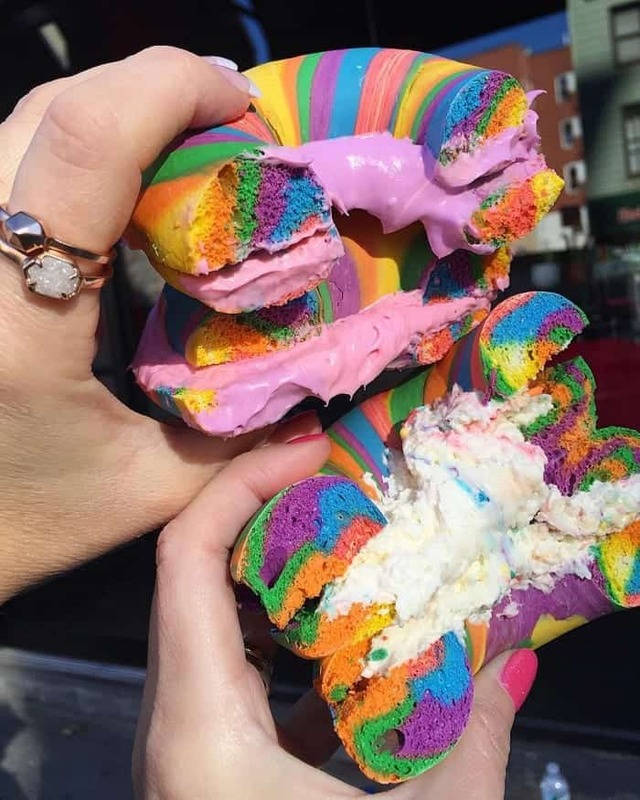 When I saw these gorgeous Rainbow Bagels on Instagram, I knew I had to hunt them down. Amanda and I took the subway to Brooklyn, found The Bagel Store and enjoyed these colorful gems. So fun to photograph too! 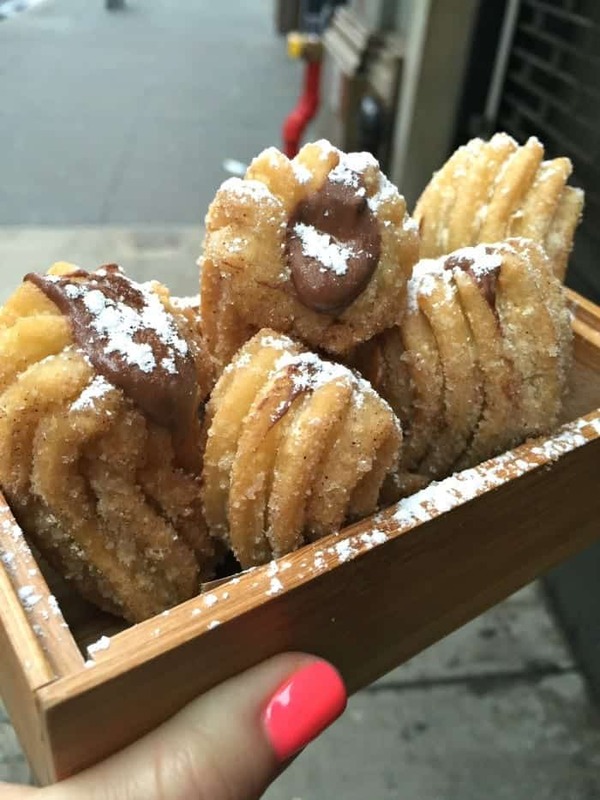 One of my newest discoveries are these Nutella Stuffed Churros from Boqueria. 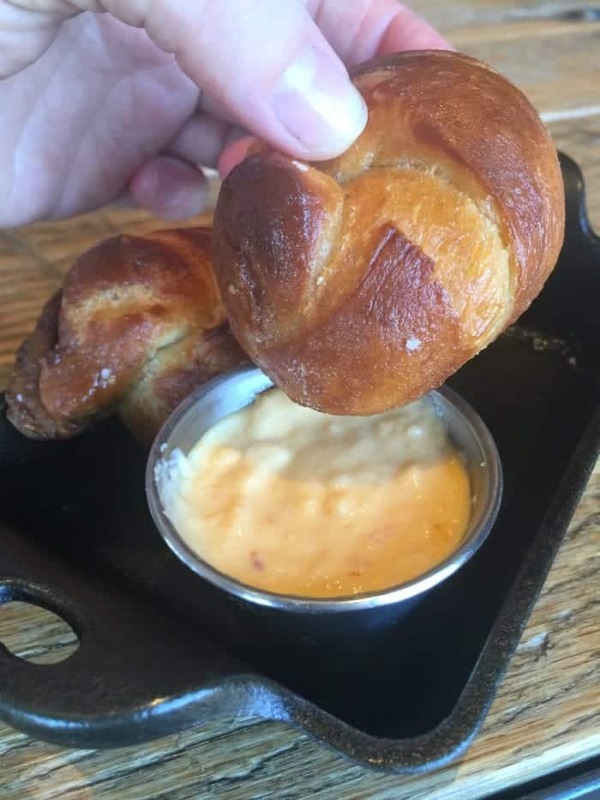 I also spotted these on Instagram and while I was in town with my husband last month hunted the little restaurant down. 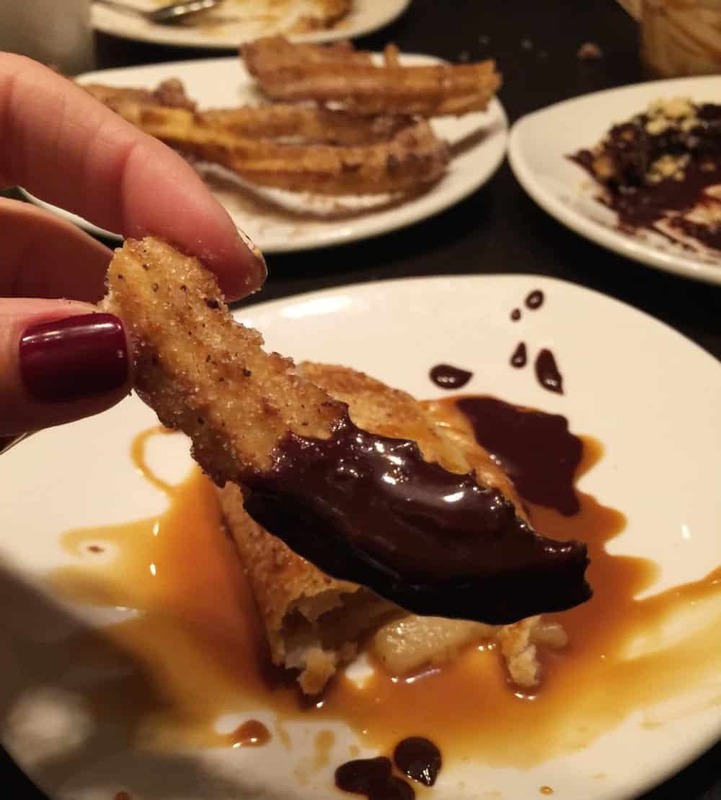 You should know, Boqueria is a small plates/tapas restaurant, they sell cheese and wine…..and these churros. We only ordered the churros and oh my goodness I am hooked for life! One of my favorite stays in NYC has hands down been Waldorf Astoria Towers. This hotel had so much charm, I could hardly stand it. 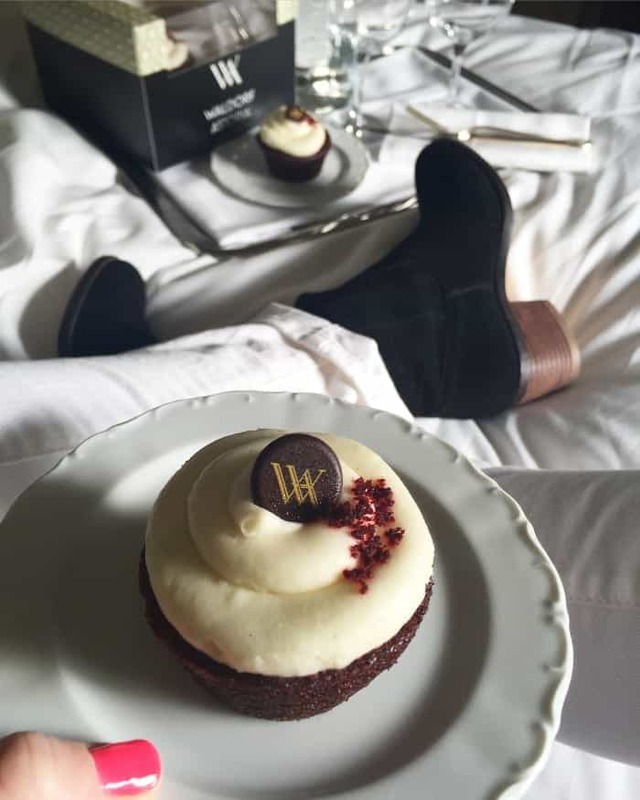 I enjoyed some of their red velvet cupcakes last month with my husband 🙂 Wait until you see their Sunday Brunch a few pictures down. I have to give a huge shout out to Matt Bernson Shoes. I wore my Matt Bernson Colt boots all day last month with my husband. We tracked it and we walked 11 miles that day. These boots were so comfortable and I couldn’t have been happier with them. Check out Matt Bernson next time you are in the city and online! One of my very favorite shoe brands. 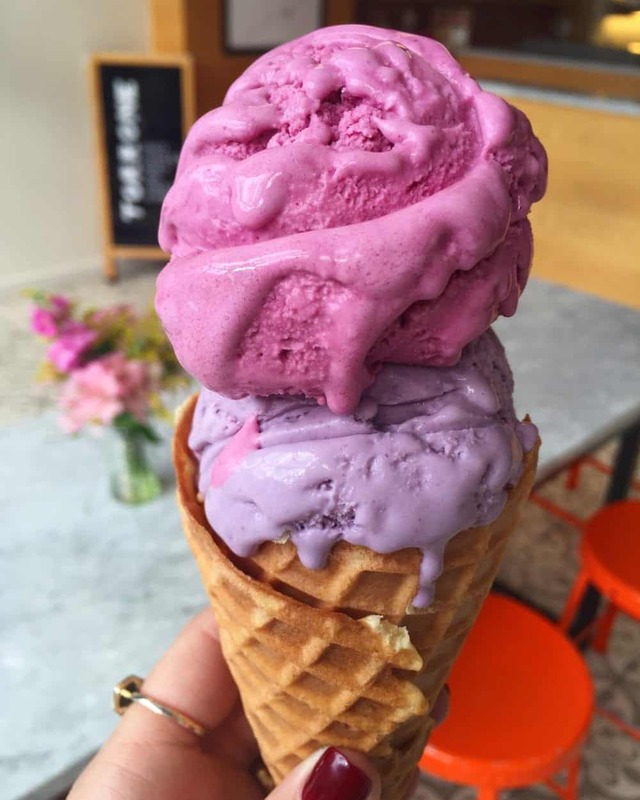 This ice cream cone from Emack and Bolio’s is about the coolest cone around. 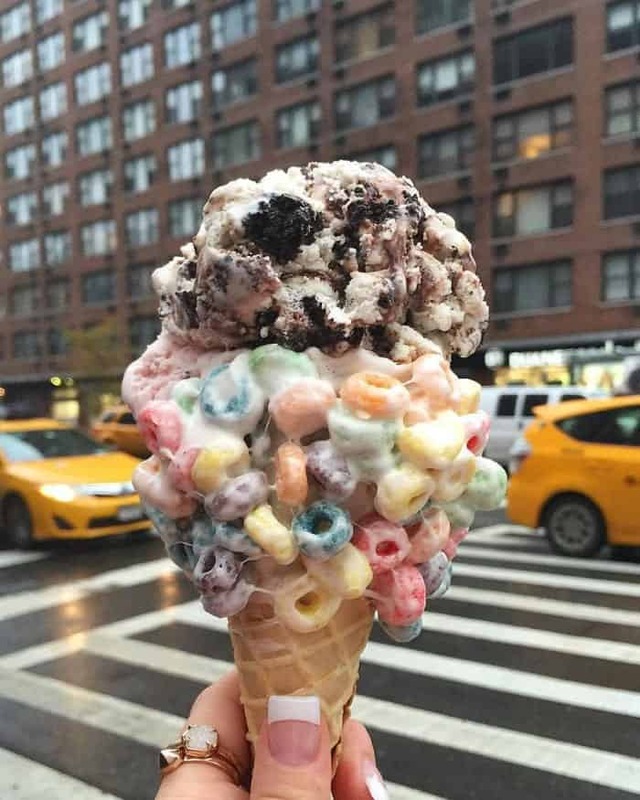 They literally add crispie treats of all kinds to their waffle cones. Plus the ice cream is all homemade and absolutely delicious. I believe I got the S’moreo. Yum! 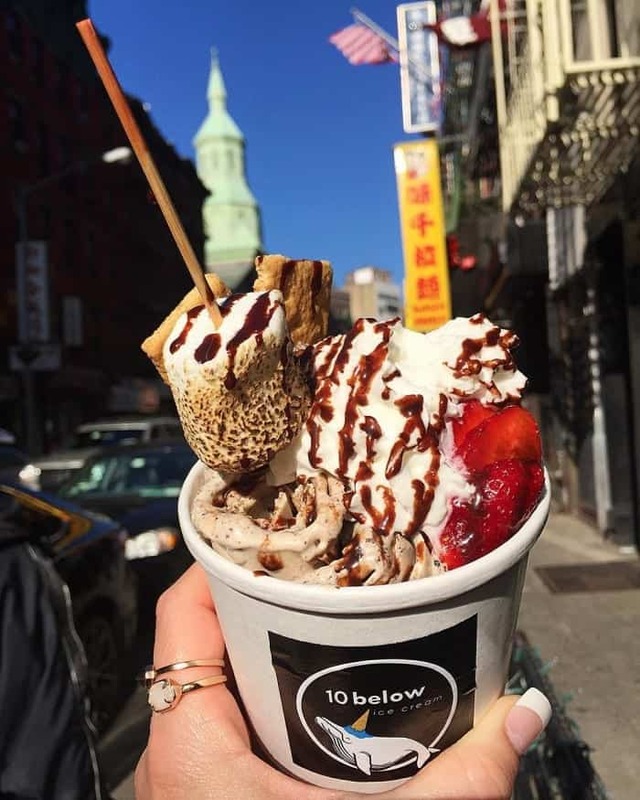 10 Below Ice Cream makes gorgeous rolled ice cream creations as you can see are drop dead gorgeous. 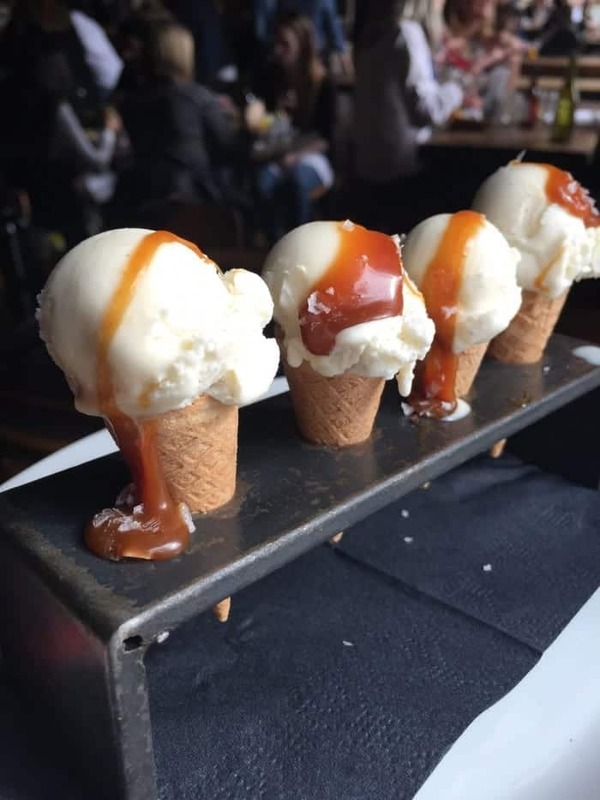 You get to watch them prepare your ice cream on a frozen slat and roll it right up. Really enjoyed this one. Max Brenner has been a long time favorite. 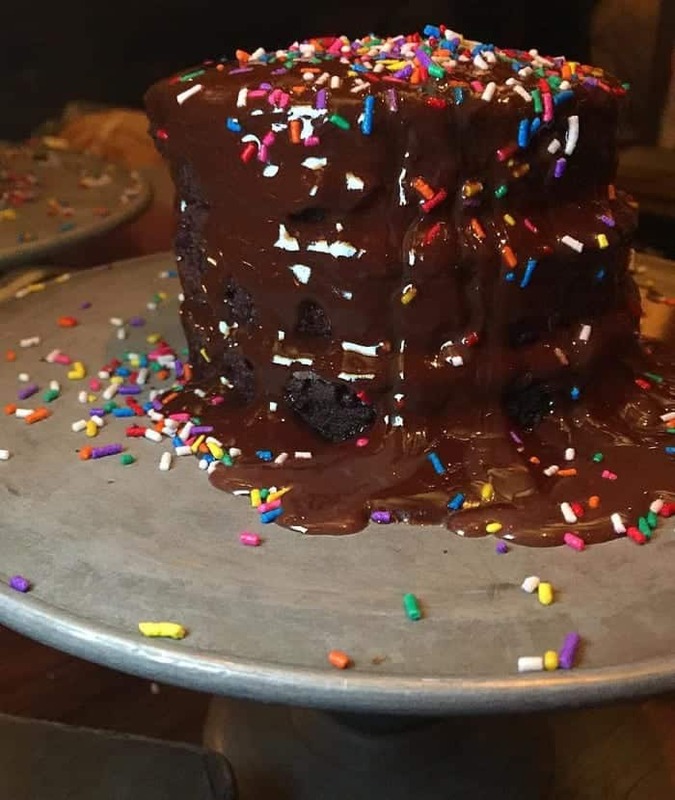 From their crazy waffles, amazing milkshakes to this make your own chocolate layered cake. I always recommend a Max Brenner experience while in NYC. 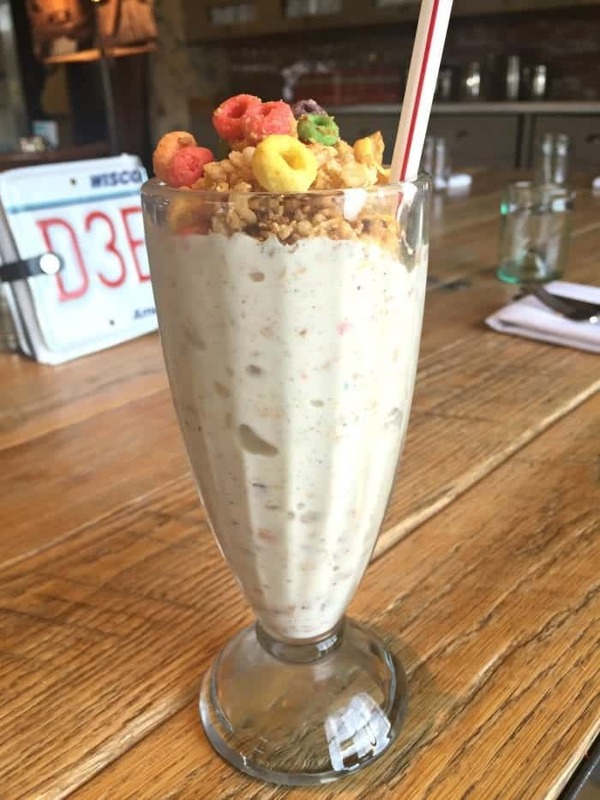 Not photo’d here, but you HAVE to order the 80’s milkshake. 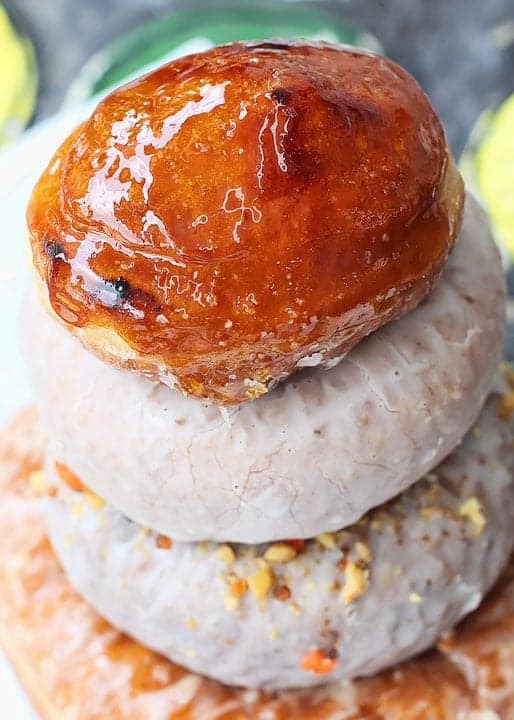 A homemade magic shell on top….to die for. 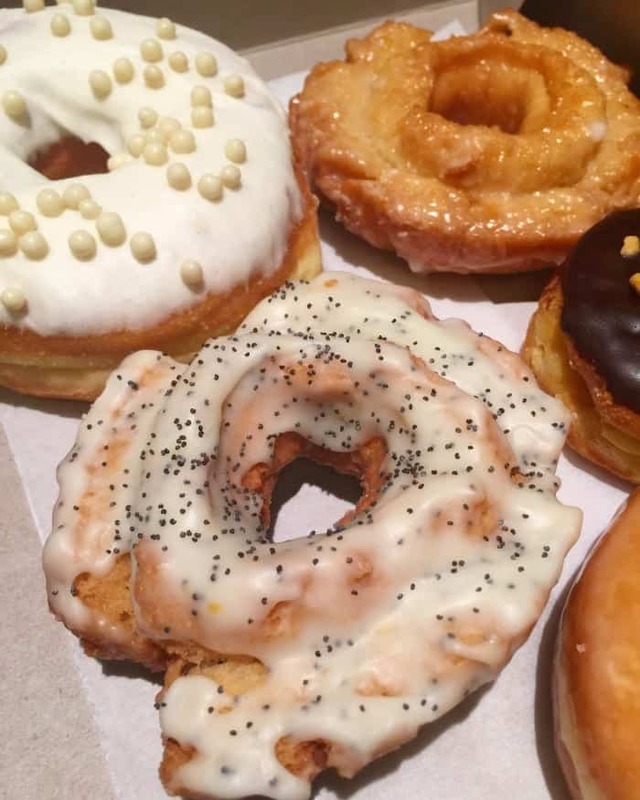 Dominique Ansel Bakery is also a must visit. 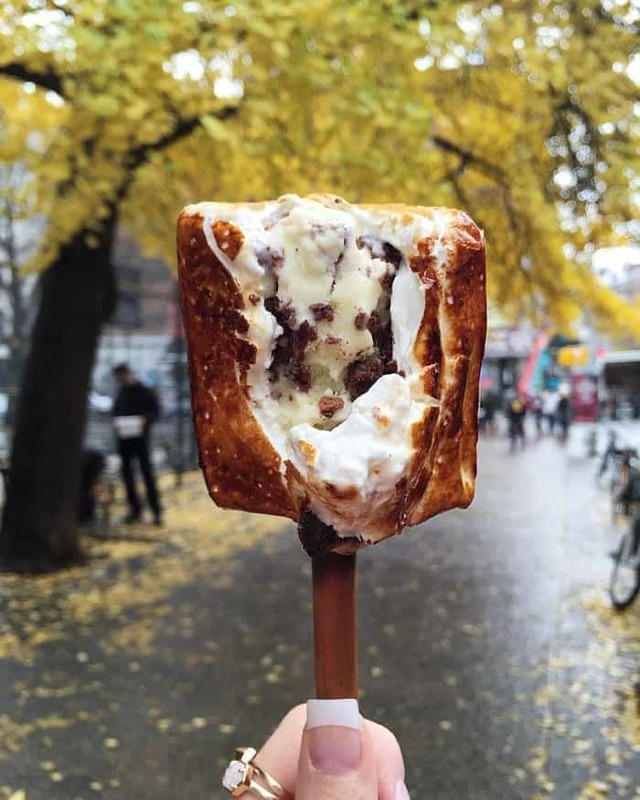 This Frozen S’more on a stick is so much fun. 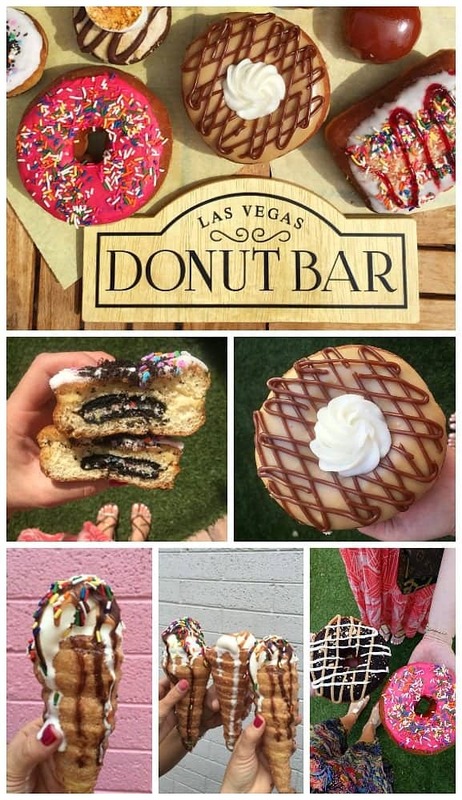 They also have the famous cookie shots….that I still haven’t had yet and they’re home of the delicious Cronut! Check em’ out. 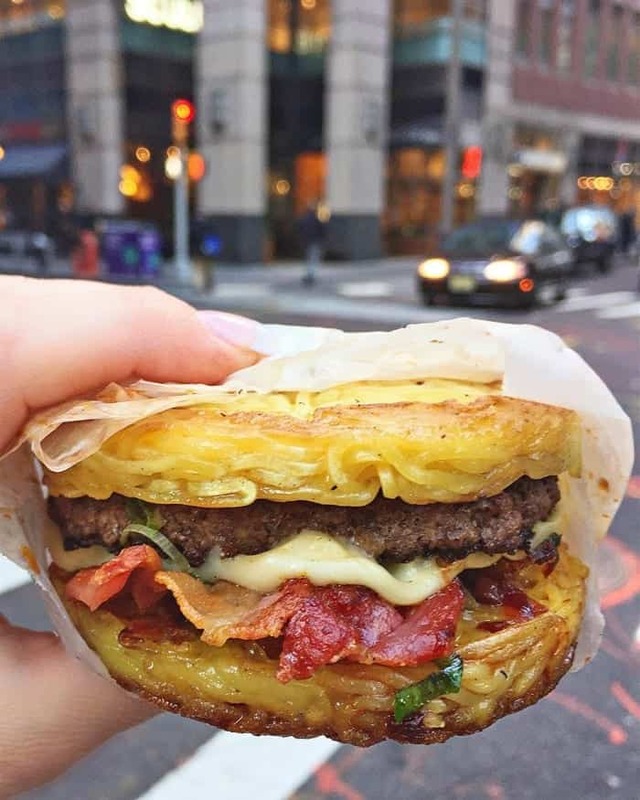 Ramen.co has this Ramen Burger that was so crazy good you just have to try it yourself!! 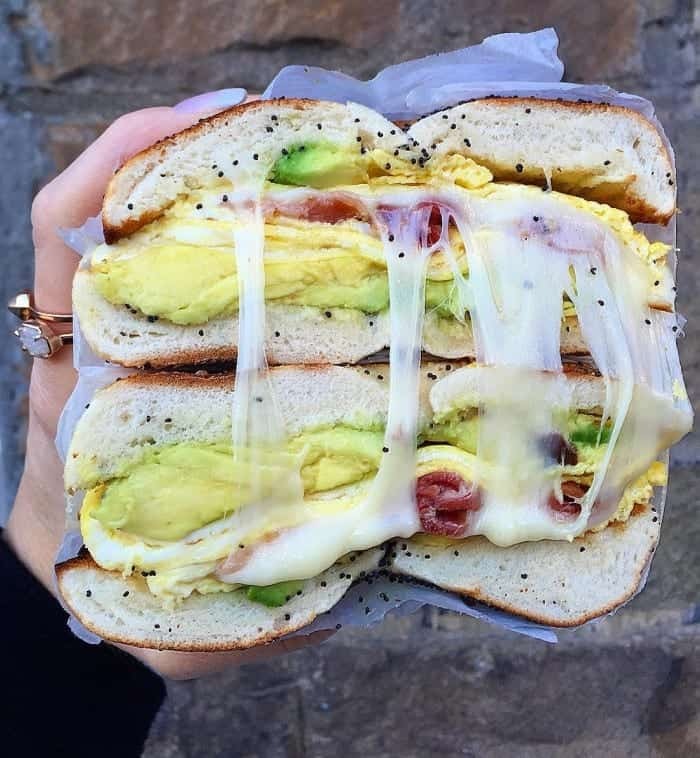 Space Market by NYU has the most amazing bagel sandwiches. It’s like a cute little market where you can grocery shop, but they have a sandwich area you can place an order through dinnertime. Amanda and I ordered this egg, cheese, avocado and bacon bagel. Amazing! 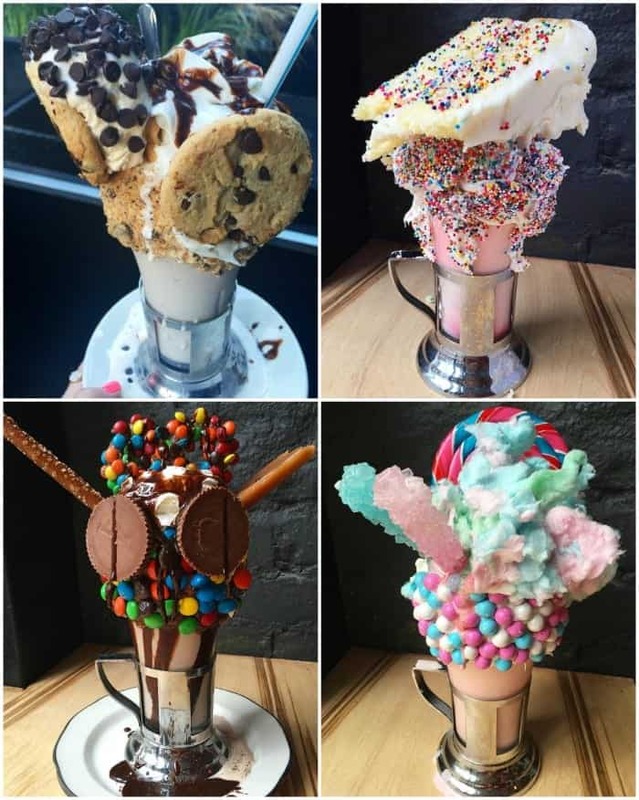 Black Tap has taken the internet by storm with their gorgeous milkshakes. Have you seen anything more beautiful?! 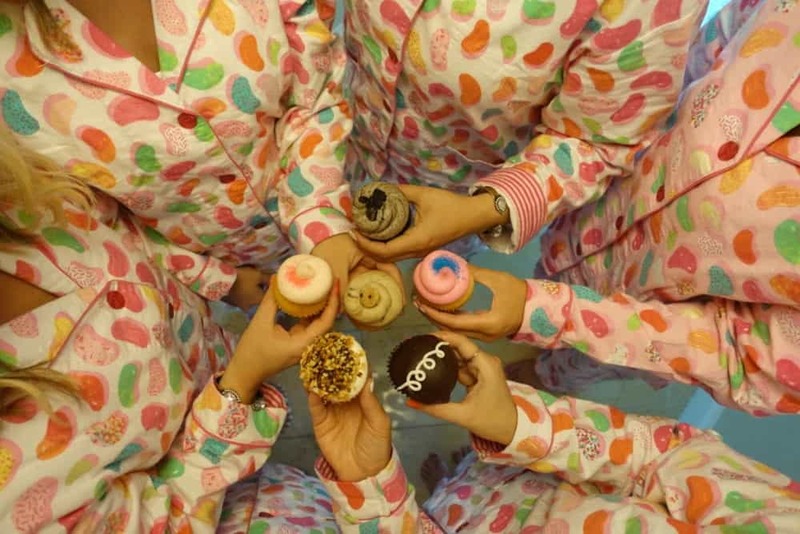 We’ve got their Cookie Milkshake, Birthday Cake, Sweet and Salty and Cotton Candy. Be prepared to have quite a line waiting to get into their restaurant. Line up before they open, that’s going to be your best bet. Good luck!! Black Tap also offers some of the best burgers I’ve ever had. 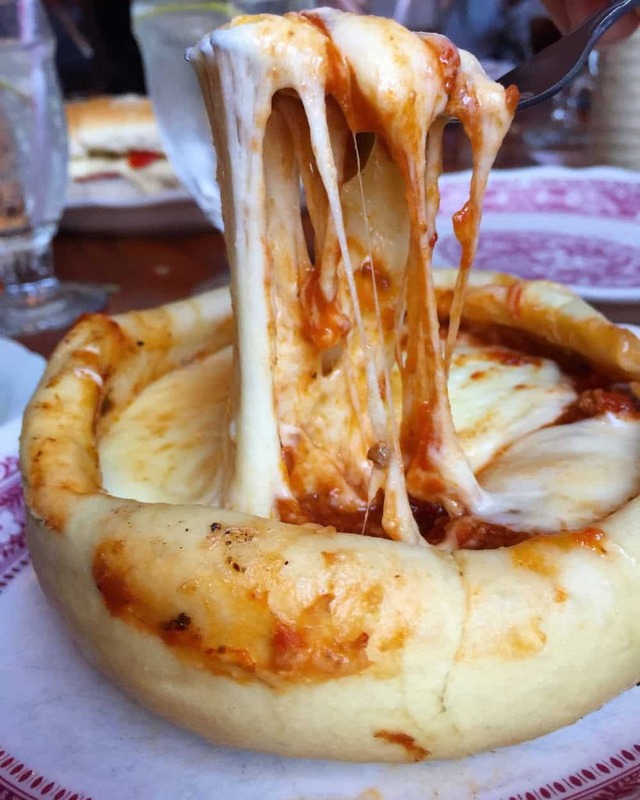 This Pizza Burger had us all drooling! 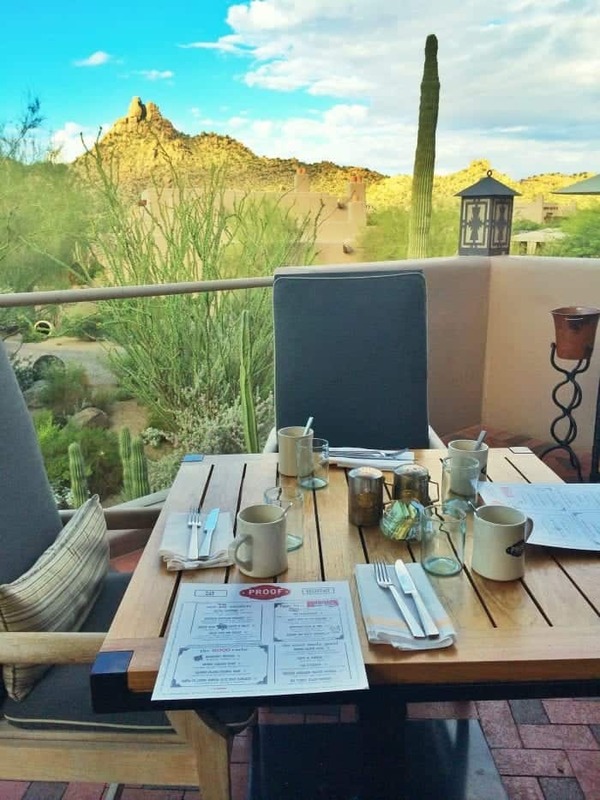 Sarabeth’s is a beautiful place to enjoy breakfast. 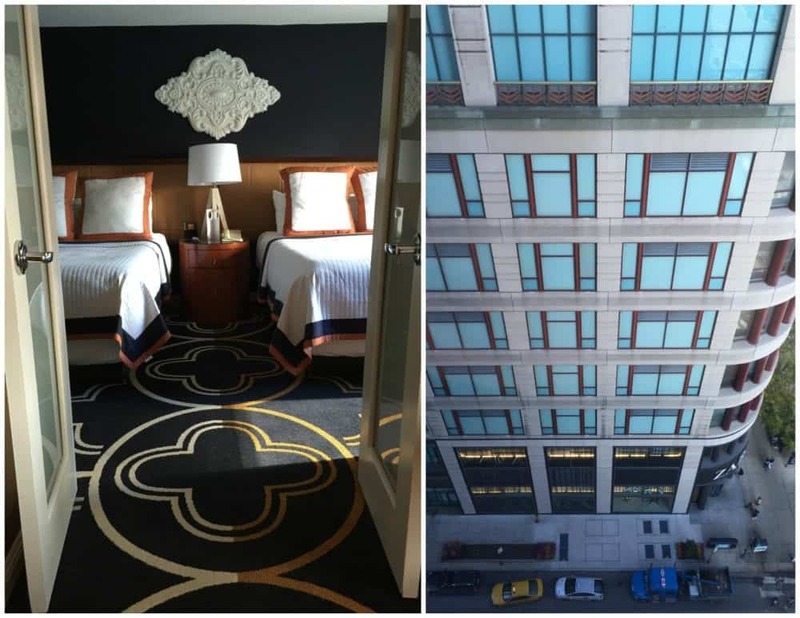 Right across from Central Park, it’s quite magical. 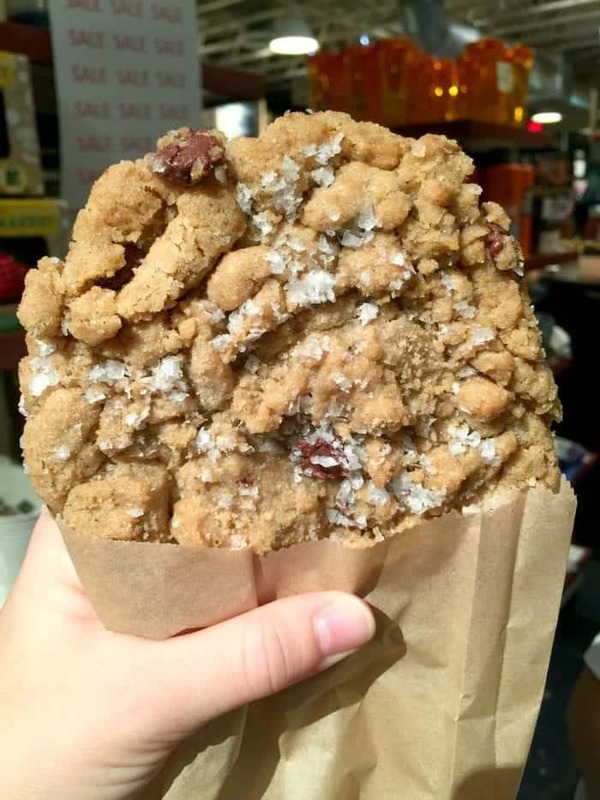 Levain Bakery is one of those places where your cookie dreams come true. Not even kidding. 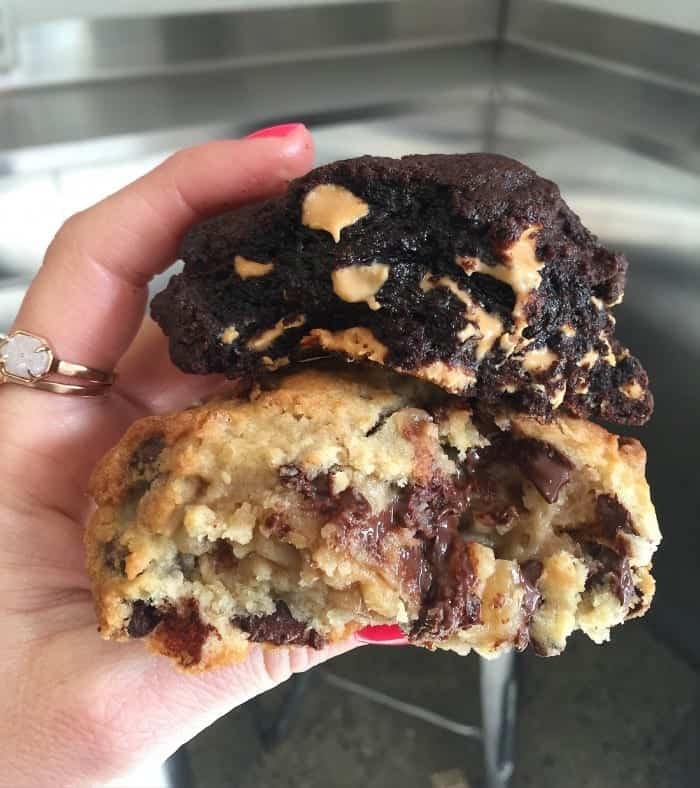 Their chocolate peanut butter chip is the best cookie I’ve ever had. 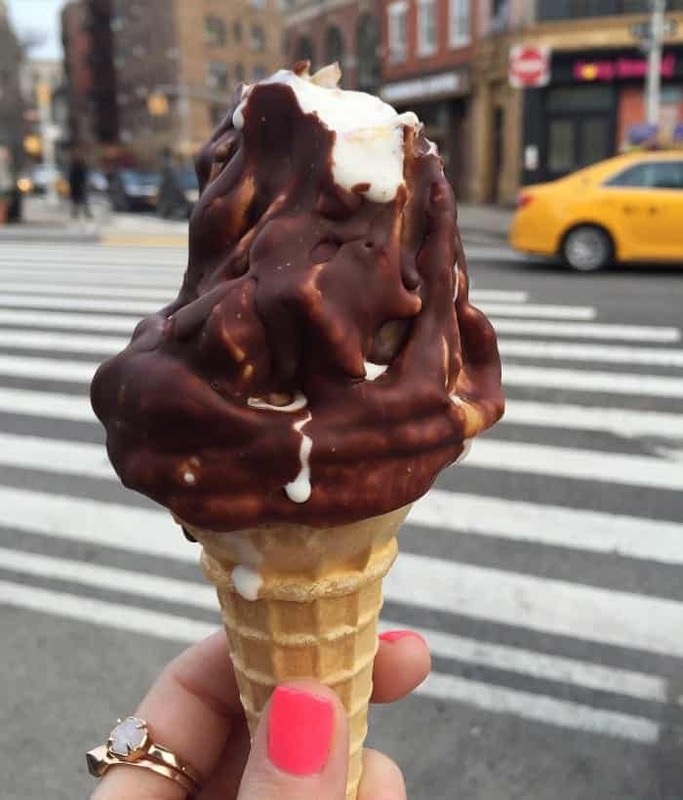 Hands down, best chocolate dipped cone in the city. Plus, it’s close to the Friend’s building and amazing walking around through Greenwich Village. 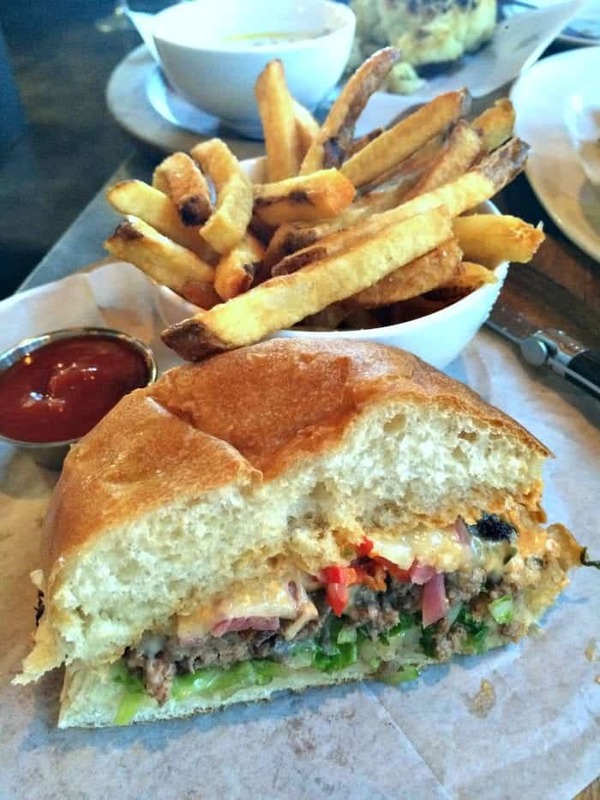 Del Frisco’s Grille knocked our socks off with their gorgeous cheeseburger, fries and appetizers. What a fun place, I highly recommend this one!! 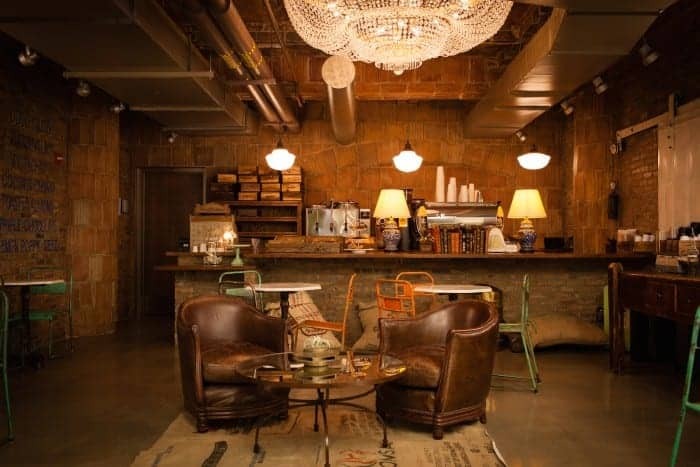 Boulton and Watt is a new to me location that literally blew me away. We went for brunch and stayed for these cutie pie Salted Caramel Ice Cream Cones. To die for!! 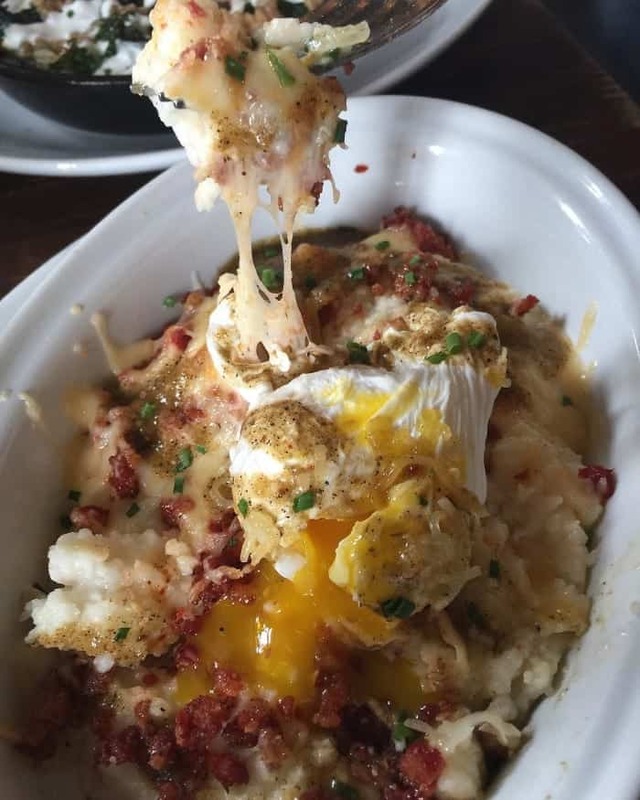 Another Boulton and Watt favorite was this baked grits with chorizo and pouched egg on top. Can’t wait to visit here again. Such a great restaurant. 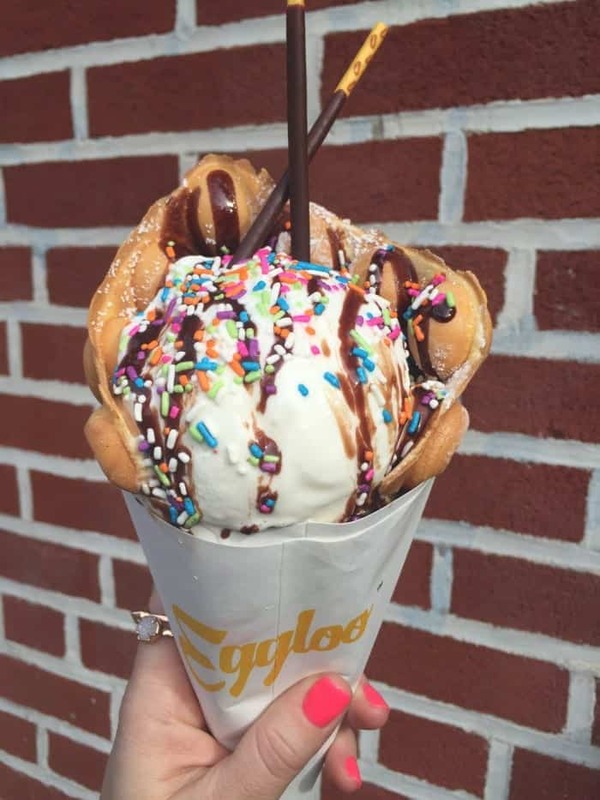 Eggloo is a new ice cream shop that opened up February 2016. I was so happy to get to try it last month. 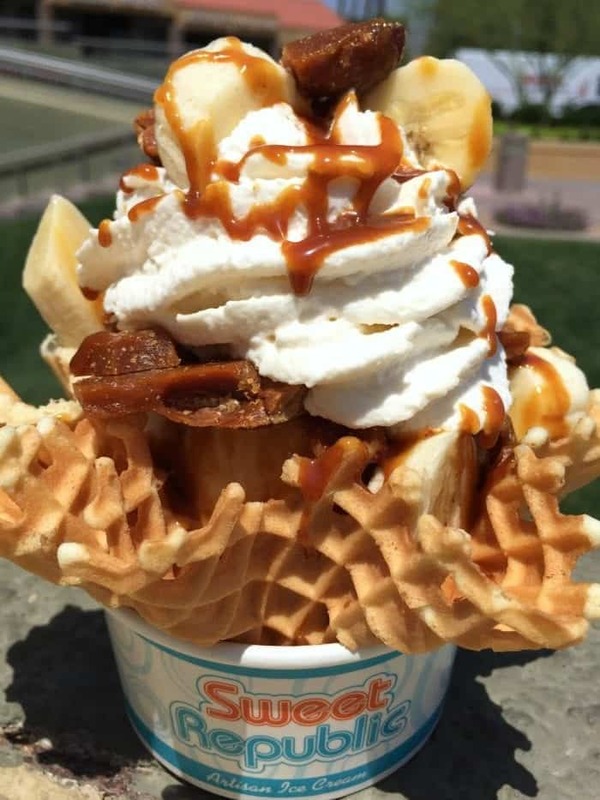 Soft crispy warm waffle cone with your choice of ice cream and toppings. Really fun! 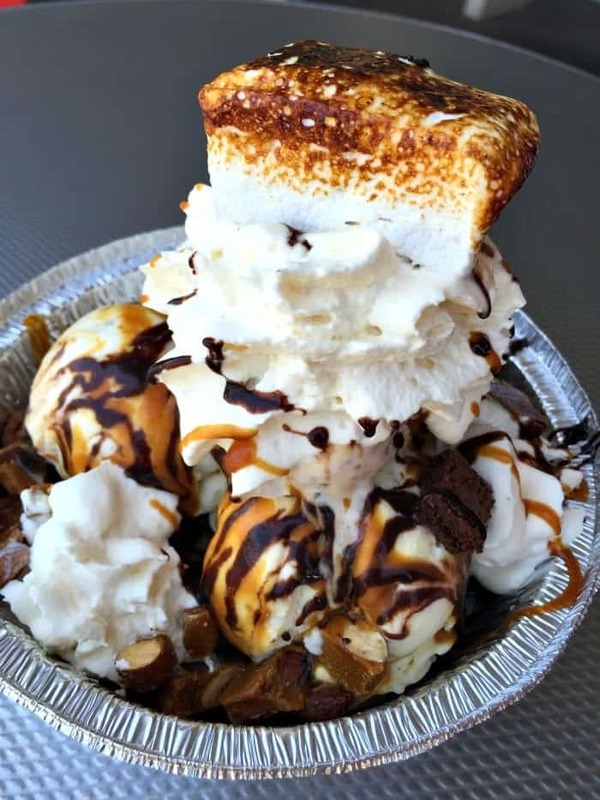 Waffles and Dinges Food Truck is not to be missed. 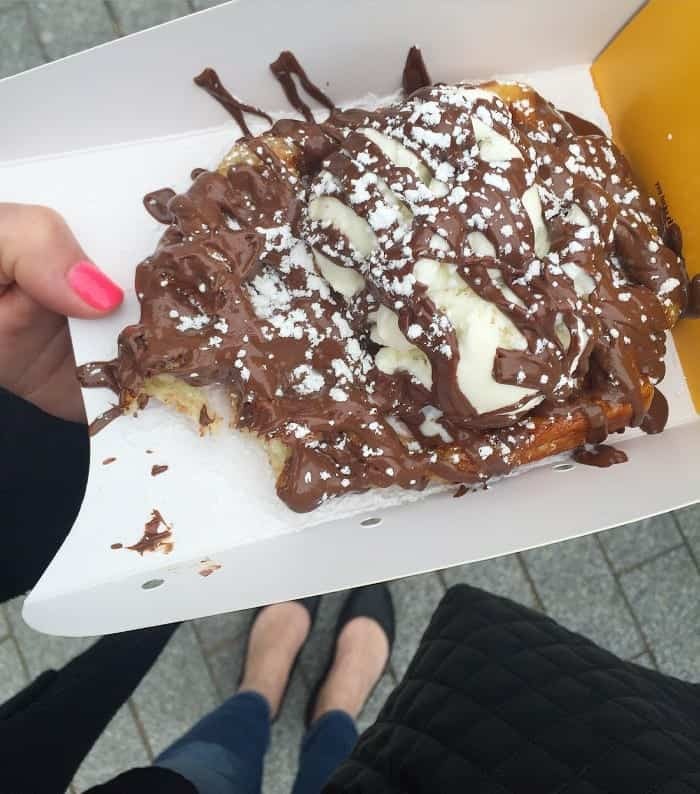 Can’t even handle this Nutella and Ice Cream topped Belgian Waffle!! 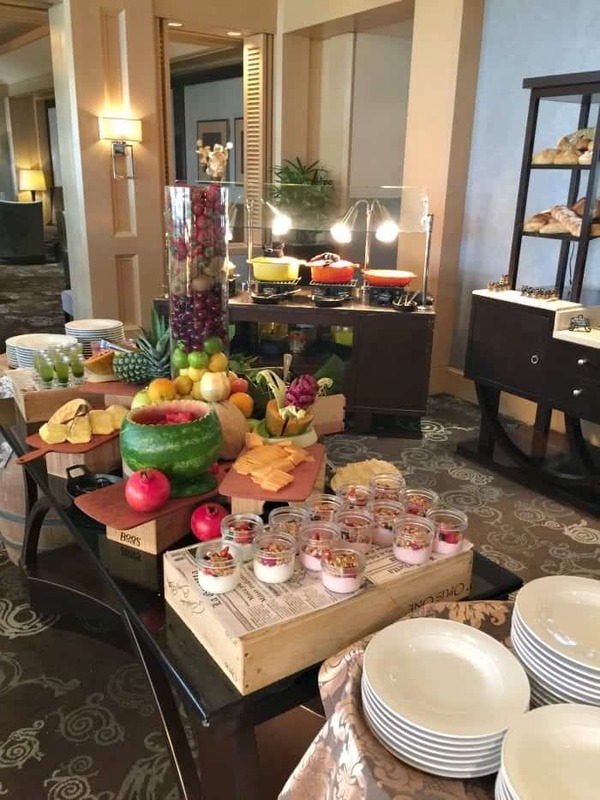 The Waldorf Astoria has the most beautiful Sunday Brunch I have ever experienced. Gorgeous food choices presented and served by the chef’s dressed in their whites. This is something you’ve got to experience at some point. I’ll never forget this dining experience and hope to go back. My husband and I were walking through Tribeca and came up on this adorable bakery, cafe called Maman. 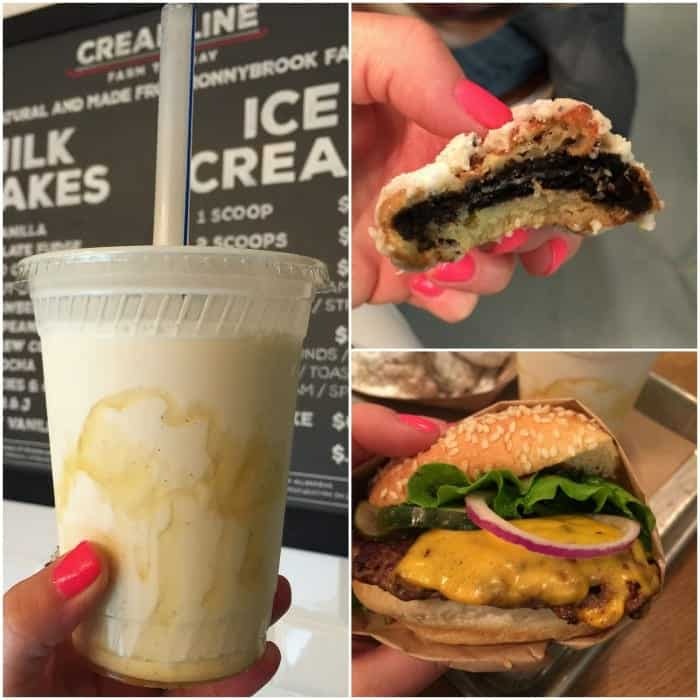 They’ve got all kinds of beautiful food choices, but we sampled their homemade Oreo Cookies. So glad we did. These were amazing! Another beauty from Space Market. 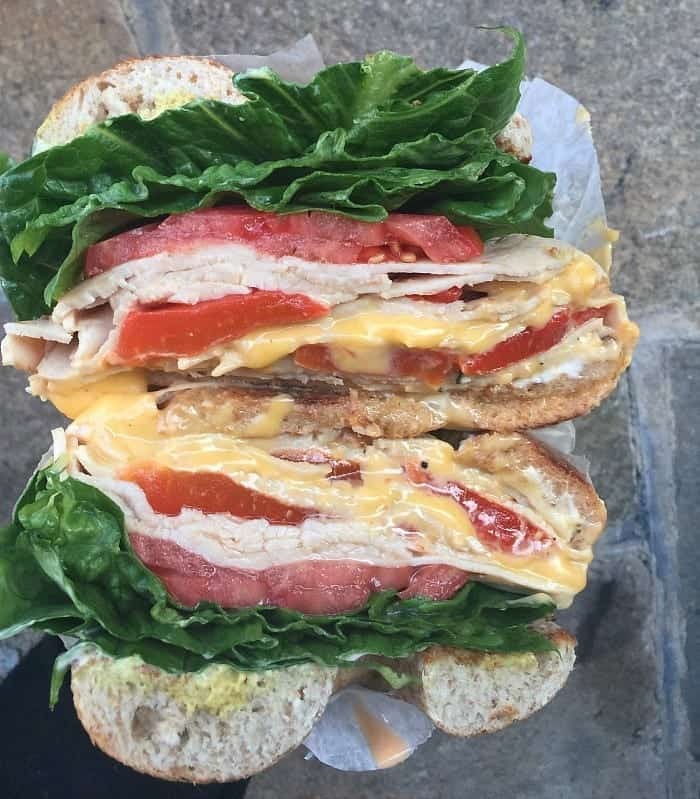 Chose a Turkey, cheese, tomato, lettuce and red pepper bagel sandwich. You can’t go wrong at Space Market! 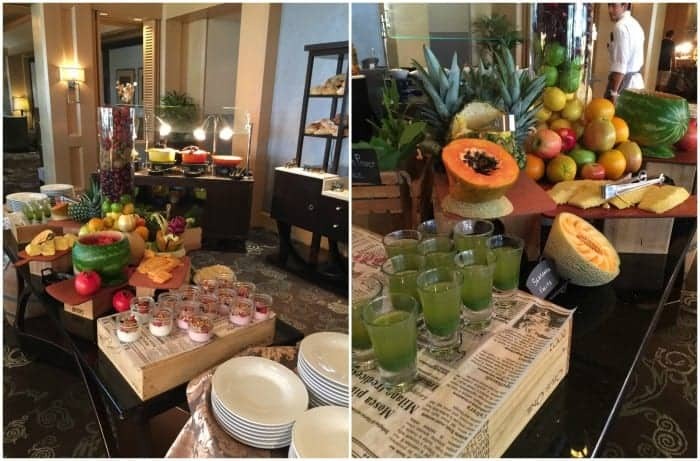 Laconda Verde has a beautiful Brunch. 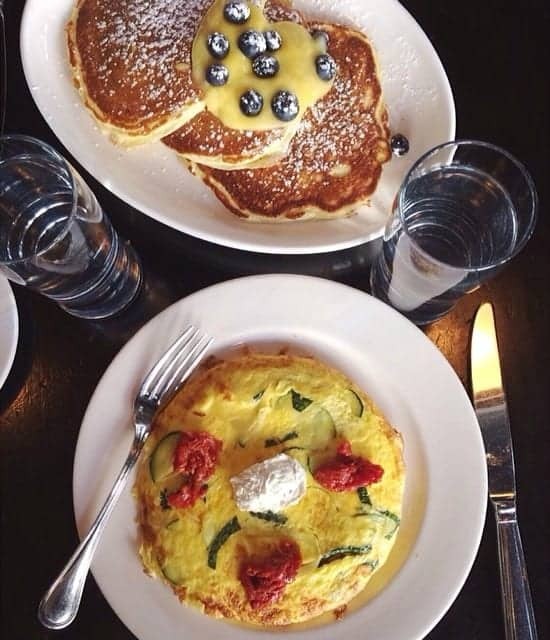 Lemon Ricotta Pancakes and gorgeous goat cheese zucchini fritatta. Great choice for brunch. Sugar and Plumm is the most adorable bakery and cafe. 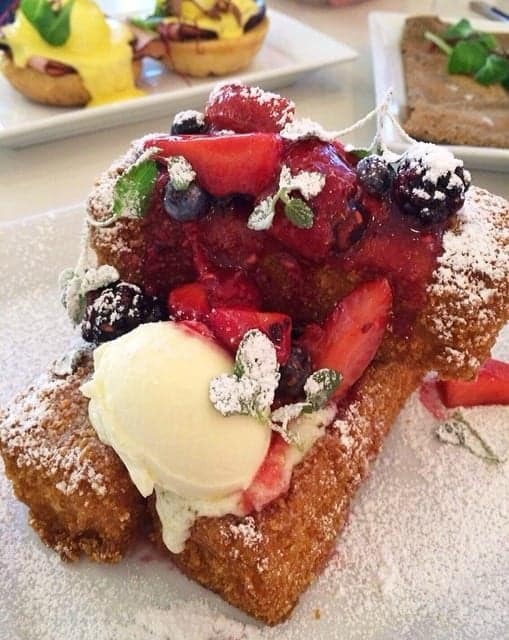 This French Toast Stack was a huge hit. Love it here. 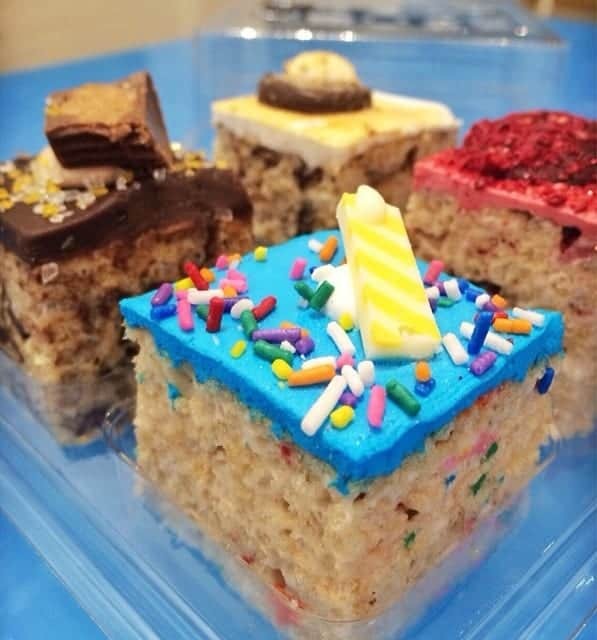 Treat House some adorable rice krispie treats! Such a cute place to visit for some sweet treats. Parm is this adorable little Italian restaurant I visited a few years ago with Amanda. Their Chicken Parmesan was out of this world. 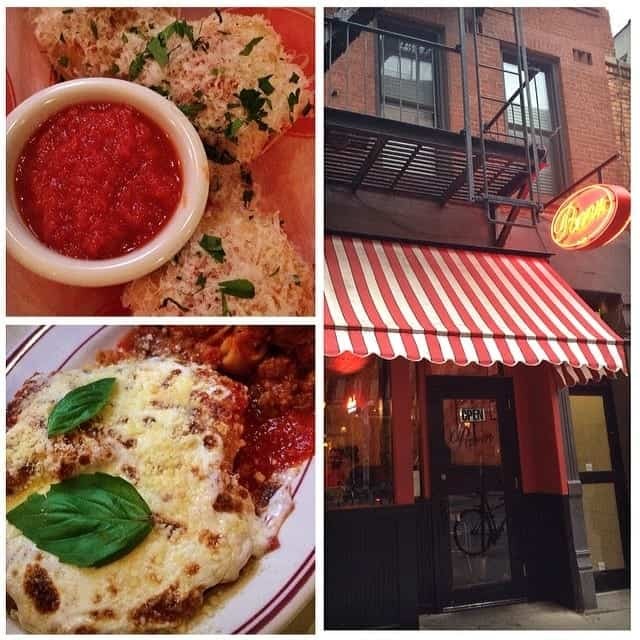 Fun place to visit in Little Italy. 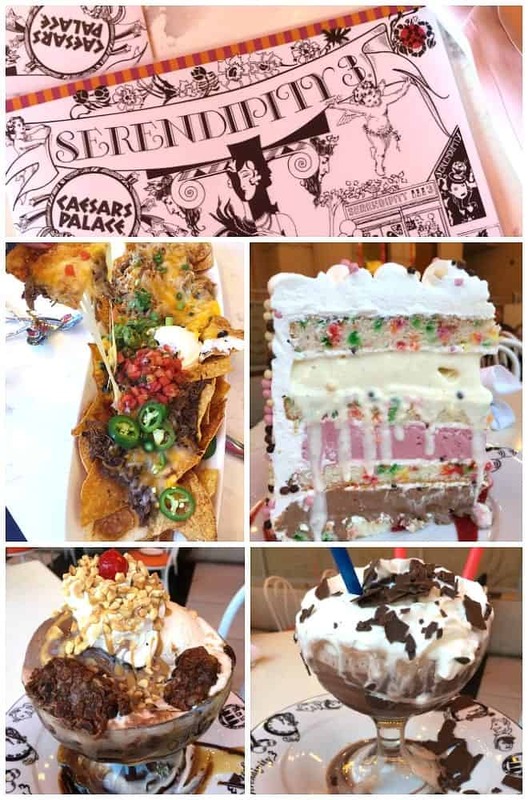 Serendipity 3 is also a must visit. 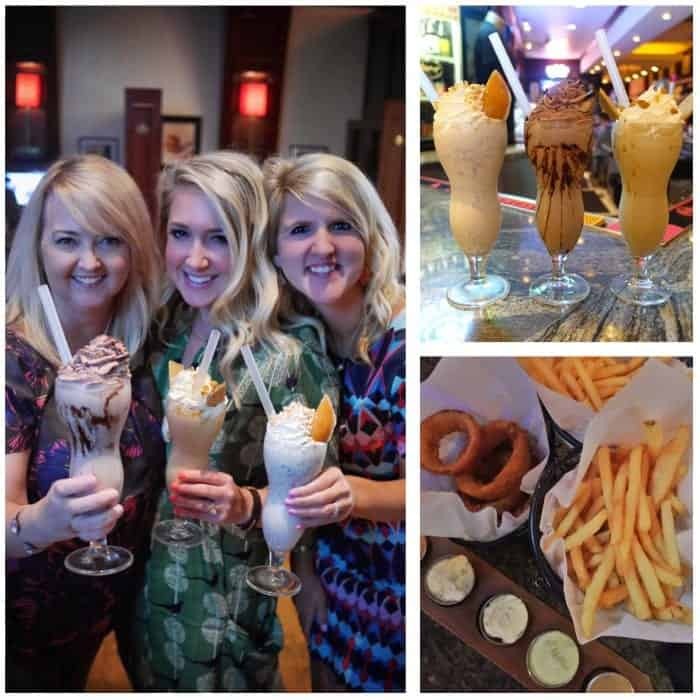 Go for dinner and stay for their favorite Frozen Hot Chocolate! 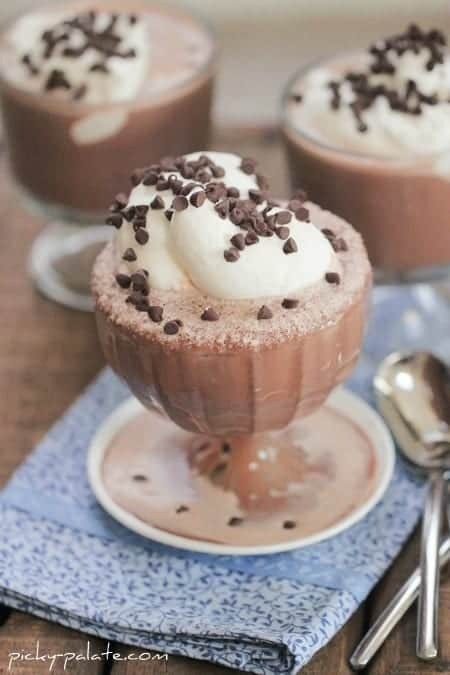 I re-created my own Frozen Hot Chocolate recipe. Click HERE. 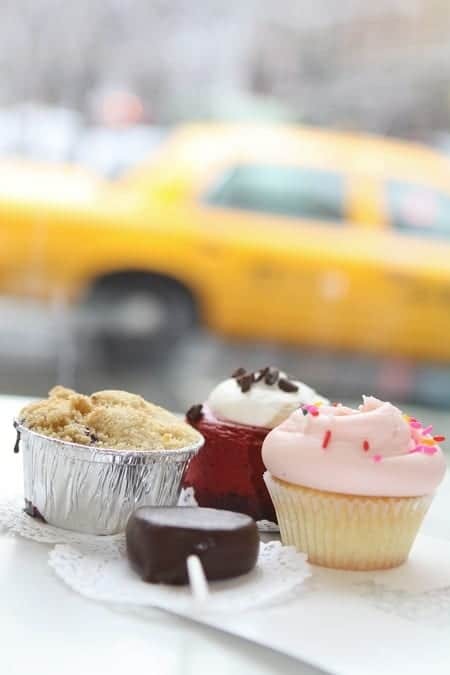 Magnolia Bakery is an adorable bakery, fun to visit and sample all of their delicious cupcakes and baked goods. 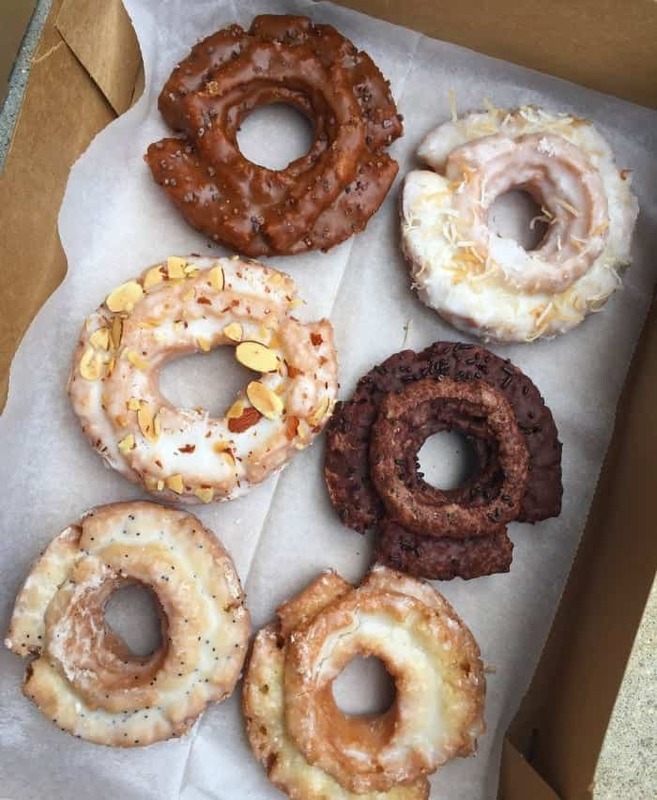 There is no better doughnuts than Doughnut Plant. Don’t miss these bad boys. My favorite it the Creme Brûlée. 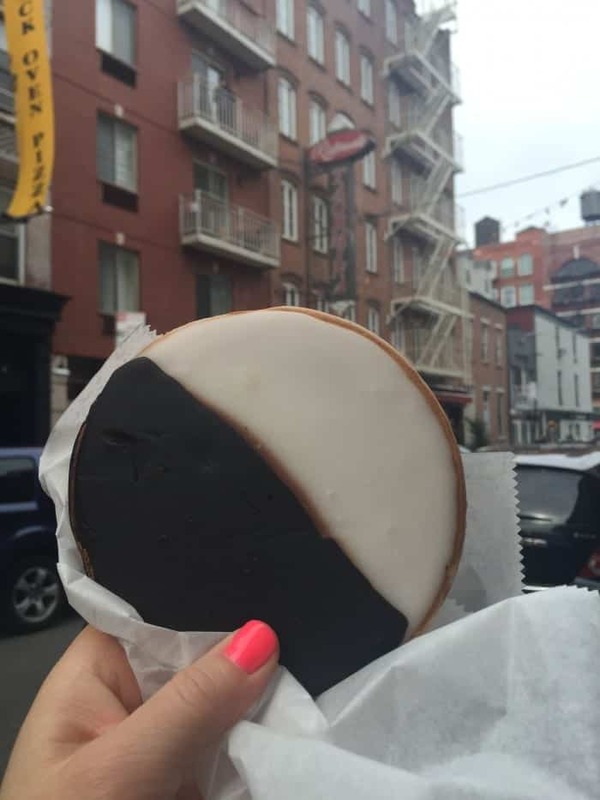 The Ultimate NYC Weekend For Foodies! 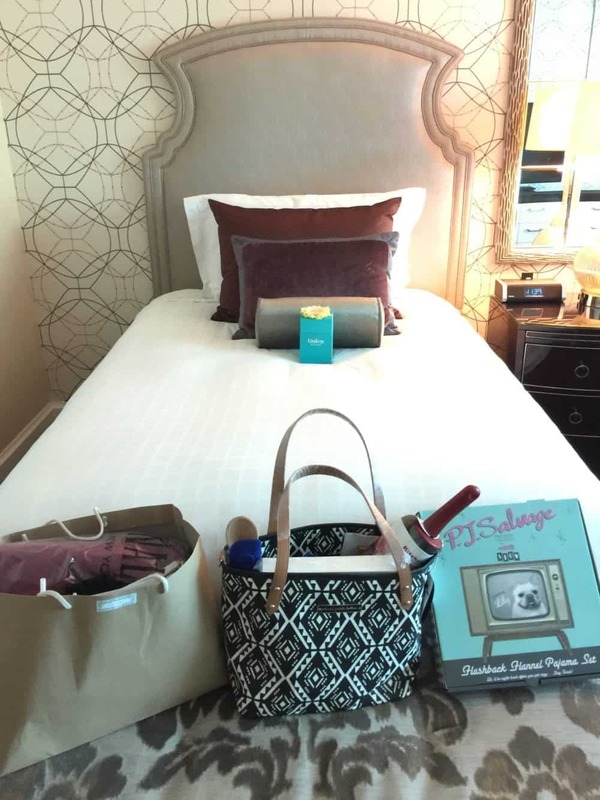 Thrilled to share my Four Seasons Las Vegas Girl’s Trip with you today. 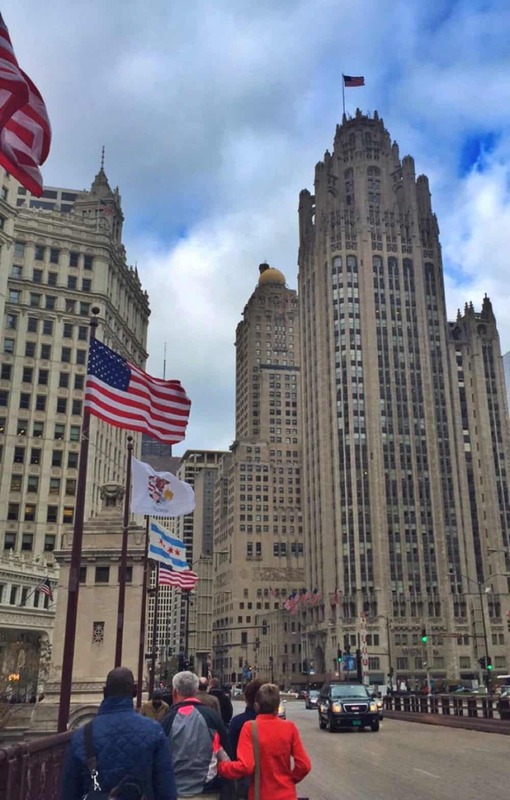 The hotel, the food, the shows, the shopping….when can I go back? 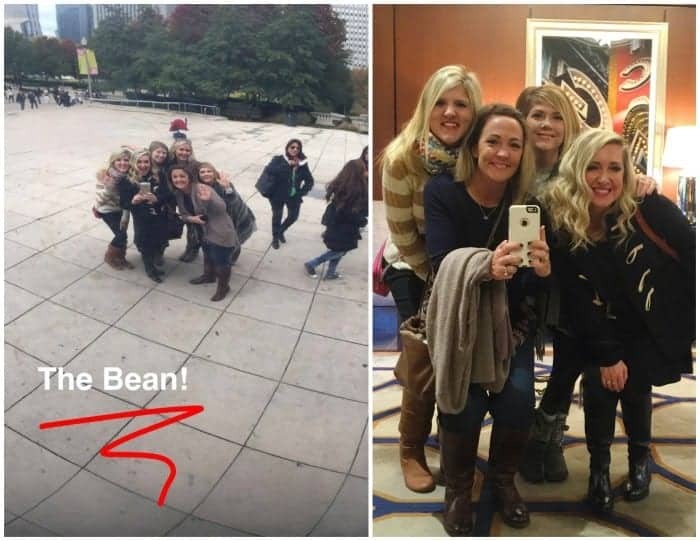 Top Row left: Lauren, Shawn, Shelly and Amanda. 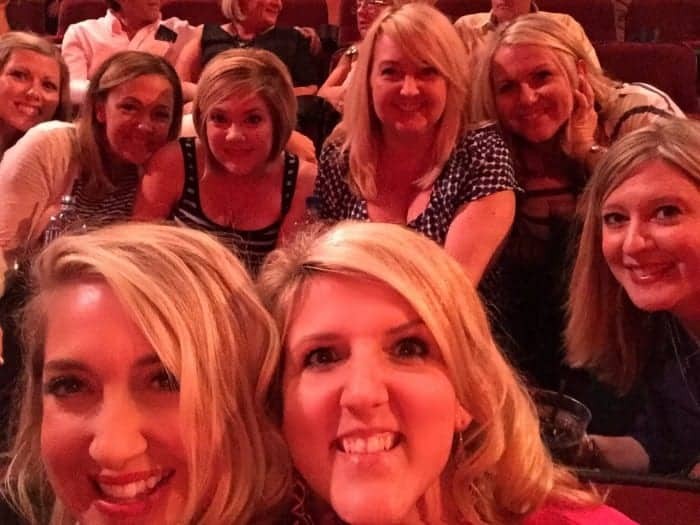 Bottom Row left: Kristan, Angie, Stephanie and Jenny. Last weekend was pretty epic. 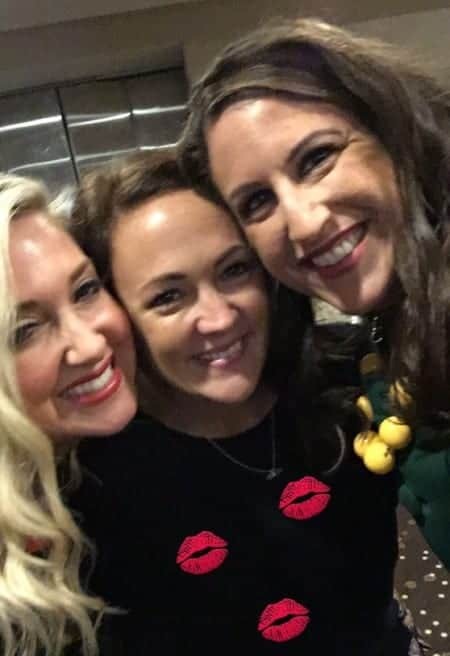 The Four Seasons, Las Vegas, these amazing girls, THE FOOD, the shopping, shows…so many great memories it’s hard to know where to even begin! Our rooms were beautiful! Here’s a great photo from the Four Seasons, Las Vegas website. We had these beautiful chocolate drizzled cake pops waiting for us with a personalized card. Love! So many amazing brands sent us goodies to enjoy for our weekend. In the photo here are Tieks, Petunia Pickle Bottom and P.J. Salvage. 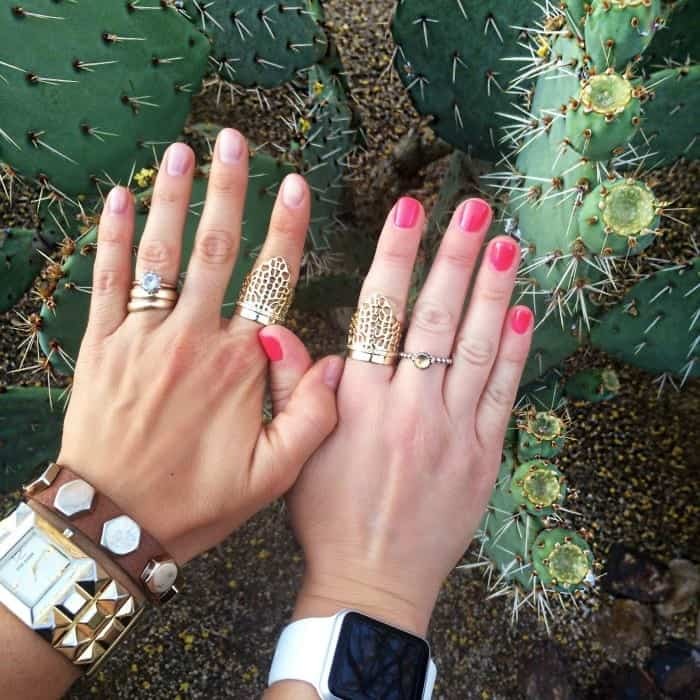 Obsessed with our matching jewelry from Lulu Frost, Loren Hope and Miranda Frye! Matchers! For the love of Tieks! By far my favorite travel shoe. Look at all of our fun colors! 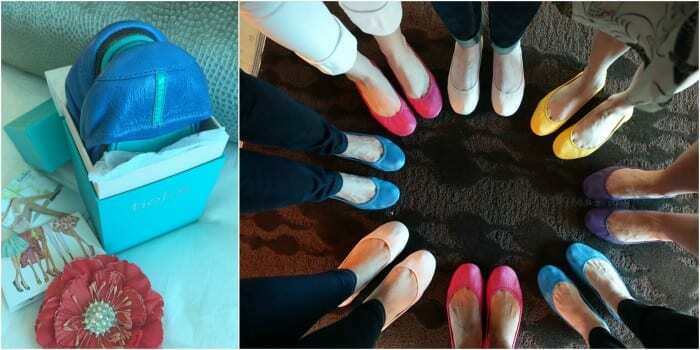 Yay for Tieks. 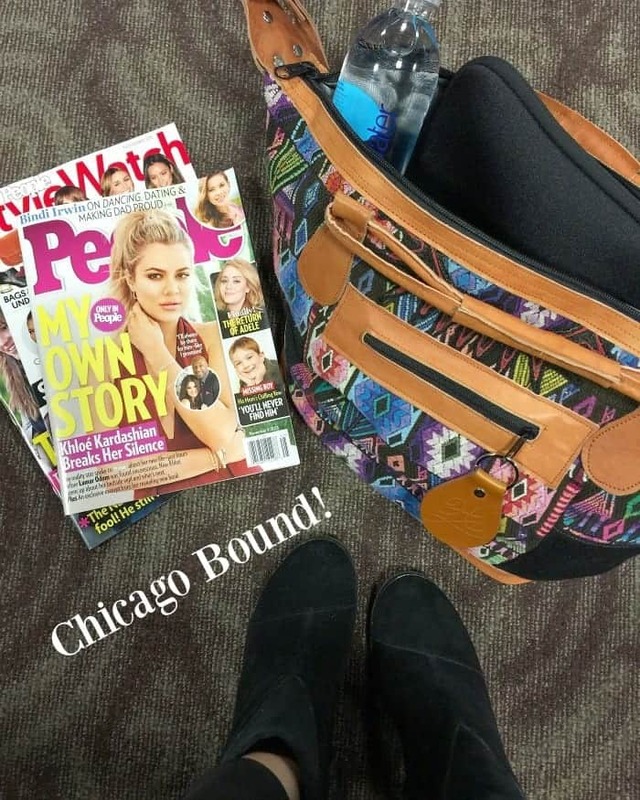 So in love with my Petunia Pickle Bottom Tote. I use them for daily errands not to mention it’s my favorite pool bag! How adorable are these Woven Pear socks? Obsessed with my new MZ Wallace bag too. 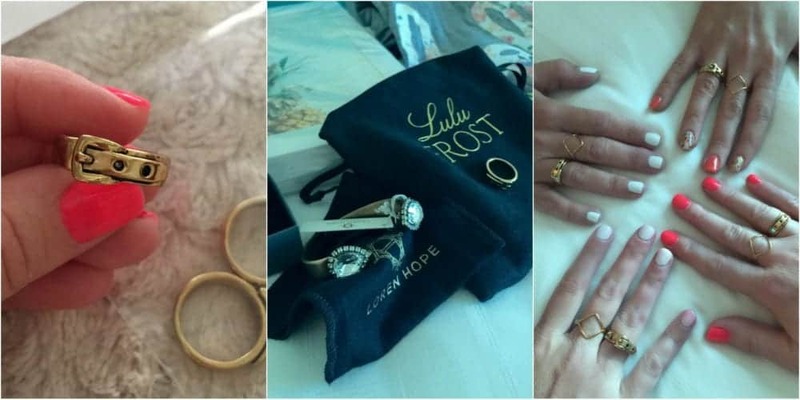 Felt so spoiled! 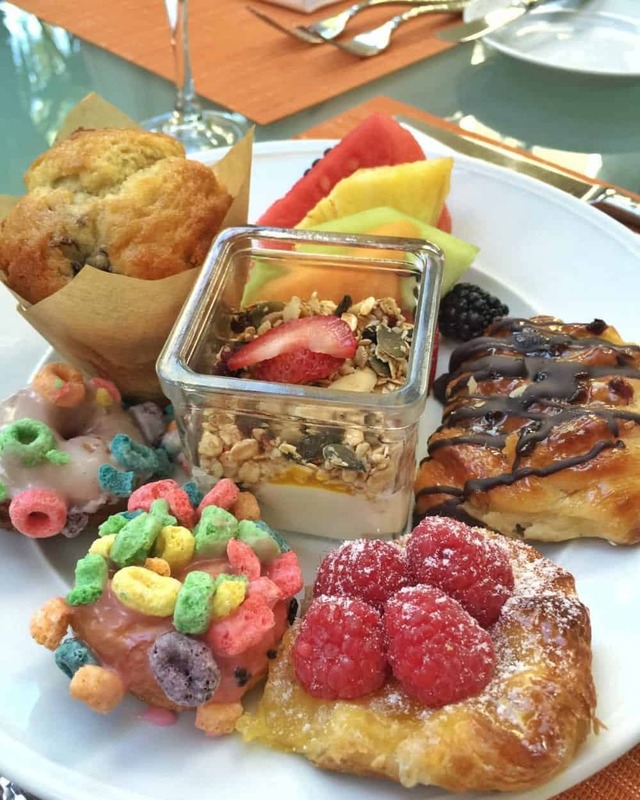 We headed for breakfast at Hash House a Go Go at the LINQ Hotel….is this real life?! 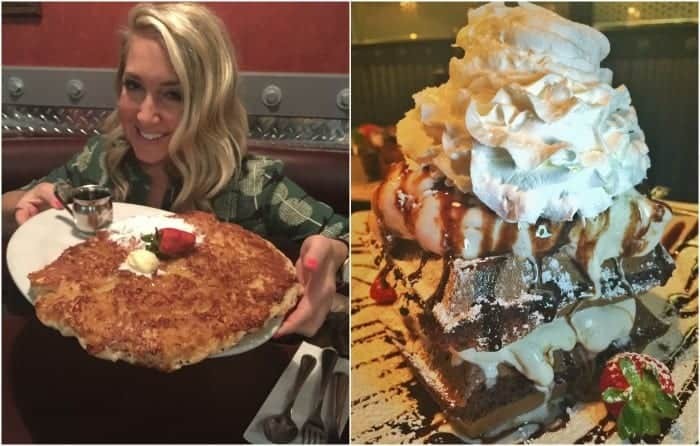 Their portions aren’t ginormous or anything. Lol! After breakfast we had a major shopping day at Fashion Show Mall. Huge thanks to Sabra Hummus and Fashion Show Mall for the gift cards! Quick snacks from The Burger Bar in Mandalay Bay Hotel. AMAZING french fries and shakes! Friday night was so much fun. 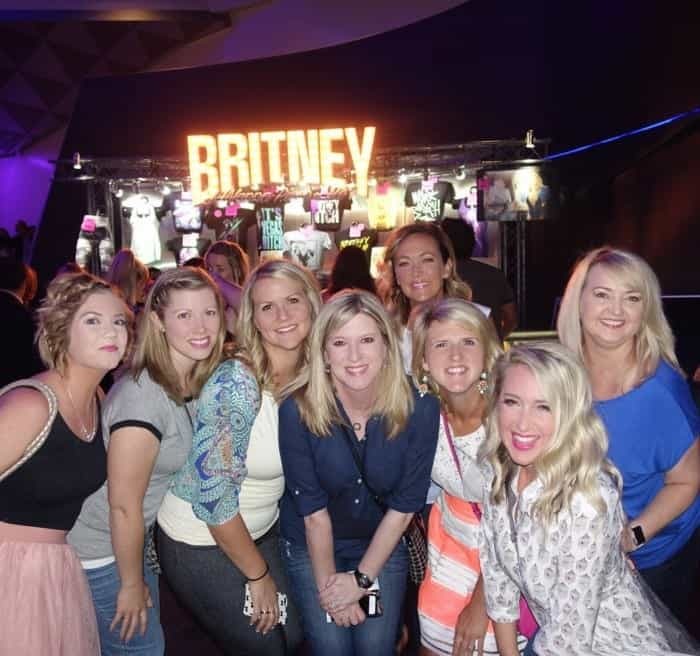 Sang and danced the whole night to all of our favorites from Britney. The show was awesome! The next morning we had brunch at Four Season’s Veranda. How amazing is their outside patio area. Here’s a shot of one of my many plates, lol! 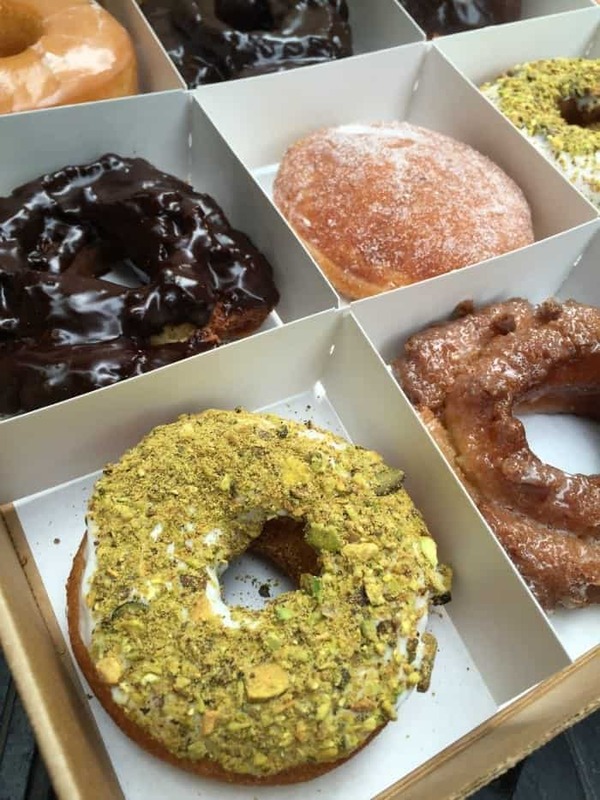 The custom doughnuts, pastries, fruit…all of it. Gimme! After breakfast, we spend the next couple hours at The Four Seasons gorgeous pool. We even had our own private cabana. Heaven. 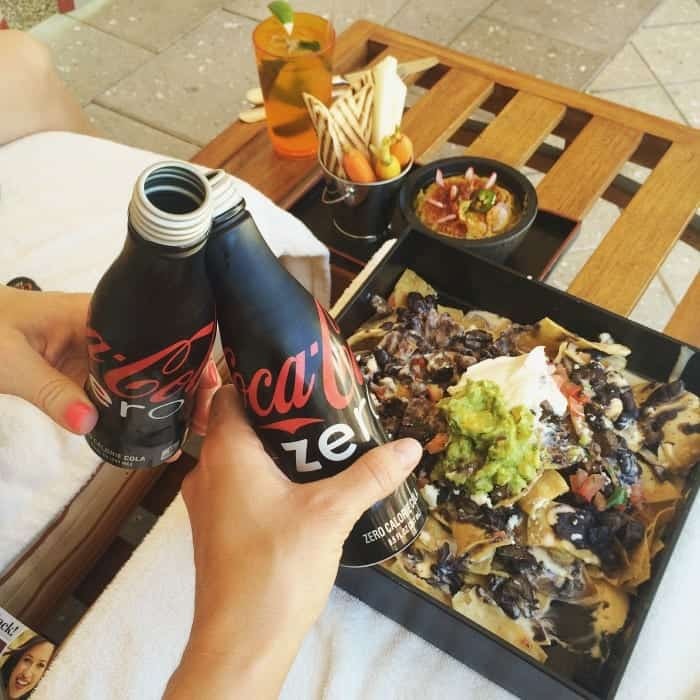 You know we ordered poolside nachos and french fries, lol! Yes, these were amazing! Later that afternoon we did some souvenir shopping for the kids at New York New York Hotel. 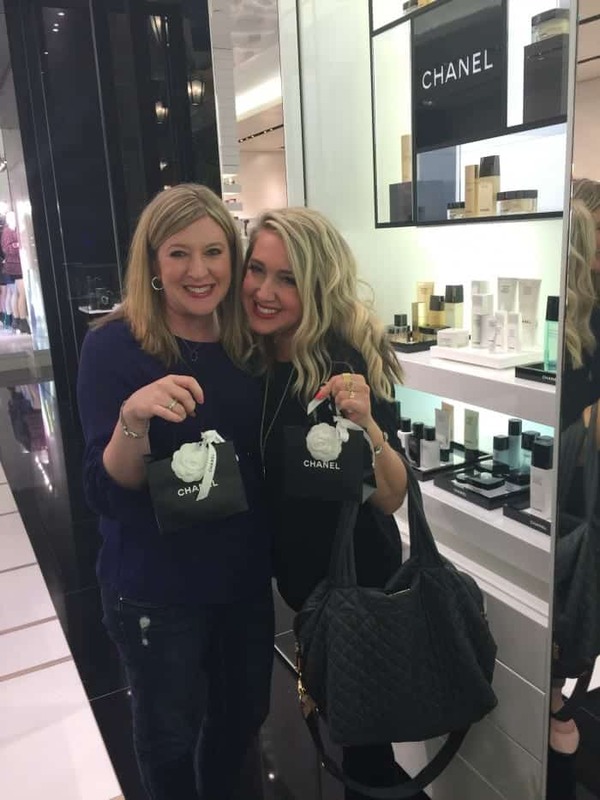 Kristan and I with our fun MZ Wallace Bags. Ours are the large Sutton bags in clay and Magnet. 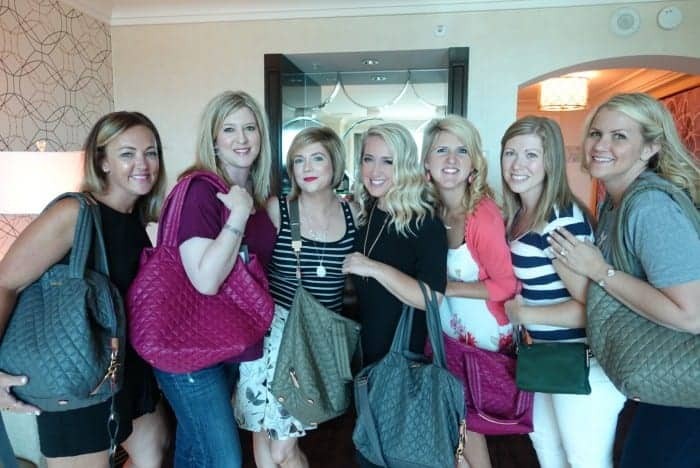 Our fun MZ Wallace Bags! These colors! 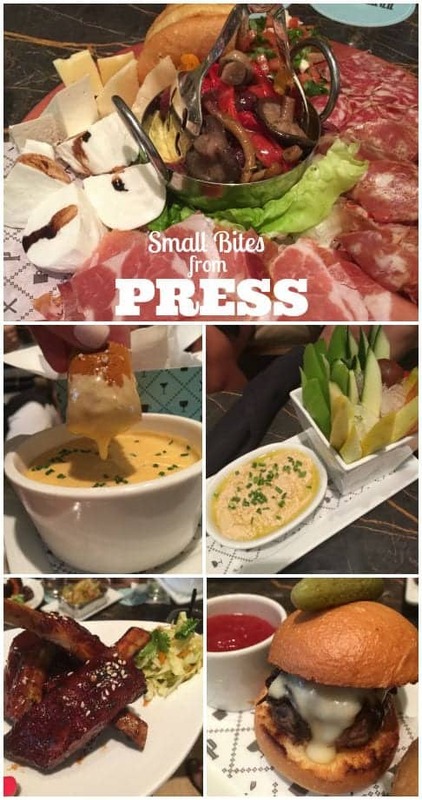 Later that afternoon, it was back to Four Seasons for small plates and drinks at PRESS. We had so much fun munching on these fabulous plates together. It was all just as amazing as it looked! Ready for the show to start! We loved it. After the show we had a massive dessert party with Retro Bakery goodies. 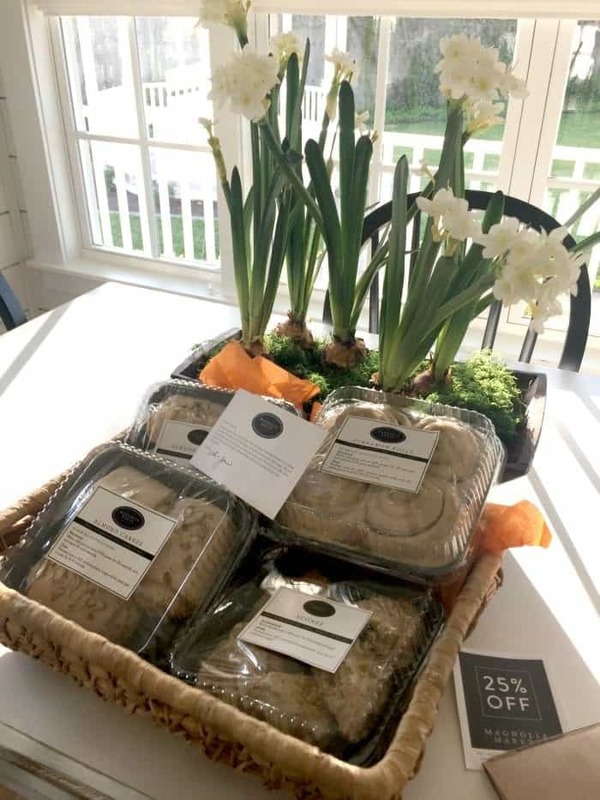 Her cupcakes and cookies are like no other! So fun! 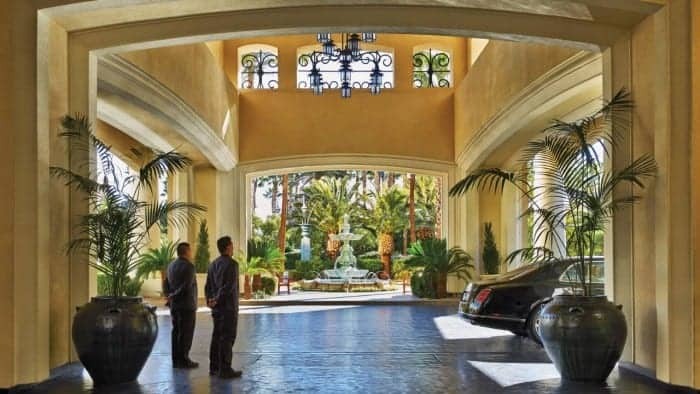 I almost shed a tear having to leave the beautiful Four Seasons Las, Vegas. 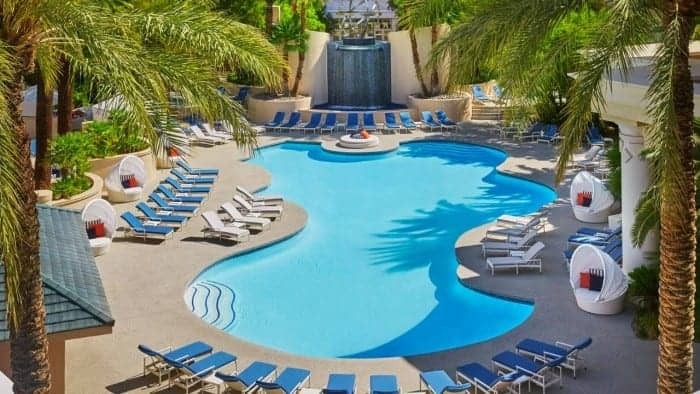 The service is impeccable and you are in your own little oasis that feels nothing like your typical Las Vegas strip hotel. I can hardly wait to visit again. 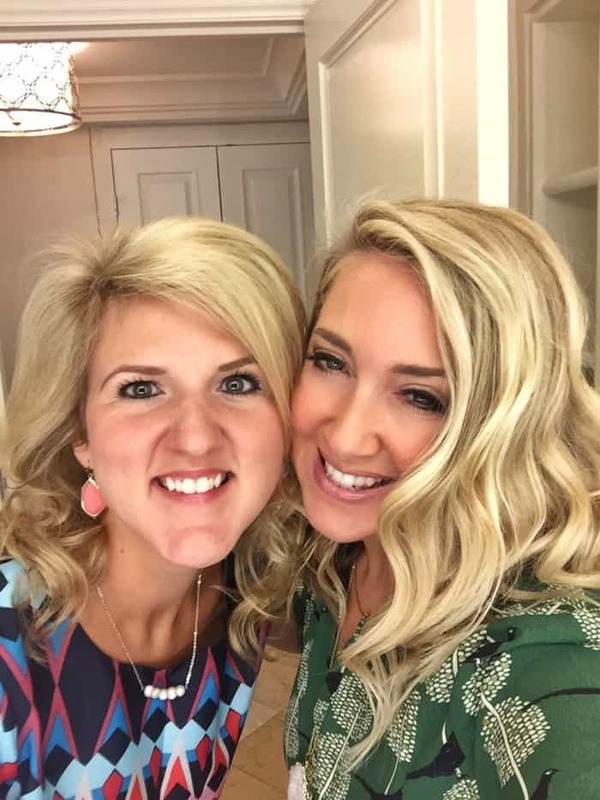 Huge thanks to these amazing brands who made our trip so special: Four Seasons Las Vegas, Sabra Hummus, Petunia Pickle Bottom, MZ Wallace, Tieks, Lulu Frost, Loren Hope, Miranda Frye Jewelry, Minted.com, Tokyo Milk, Hello Apparel, Bella Cotton Candy Maker, P.J. Salvage, KitchenAid, Retro Bakery, Tillamook, Nestle, Planters, Bon Apetit Pizza and Martha White. 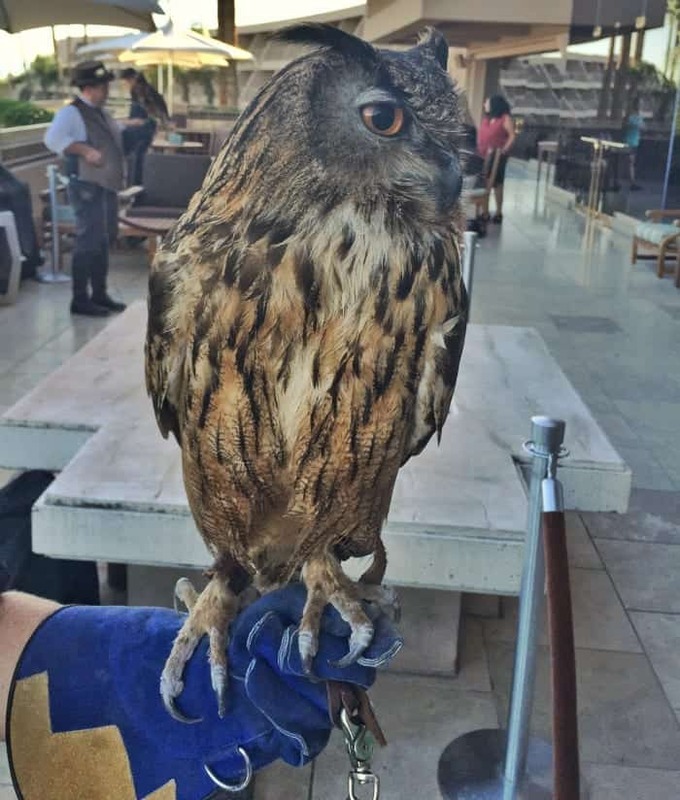 Sharing our weekend at the Phoenician Resort Scottsdale Arizona. So happy to beat this Arizona heat in their gorgeous pools and restaurants! 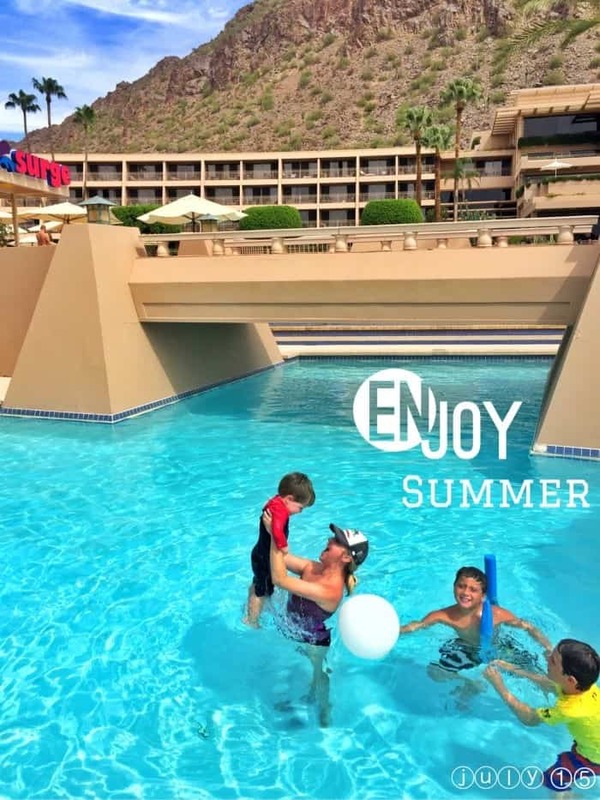 With the kids having such a short summer we decided to do a really fun “staycation” at The Phoenician Resort instead of heading to California like the rest of Arizona does 🙂 We walked outside of the resort after checking in to see this beautiful view. Took my breath away knowing we get to play here for the weekend. Many people asked if it’s a good place to take the kids. My answer, yes it is! So many beautiful pools to choose from. 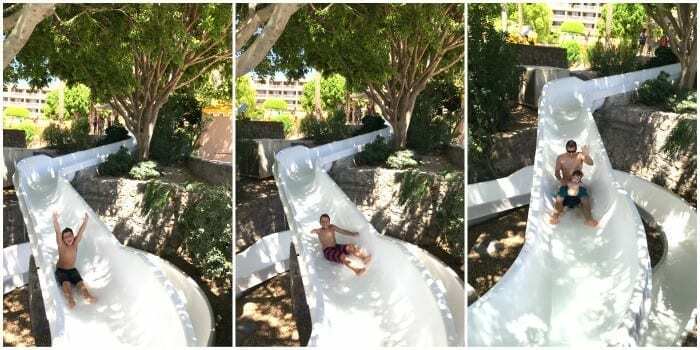 A fun waterslide and splashed that my kids loved. We loved the Flight of The Phoenix demonstration where you learn about beautiful Arizona birds. Pax was obsessed with this beautiful own named Archimedes. The boys also loved the Koi Fish Feeding where the giant Koi fish would flock. Quite a fun sight. So many other activities to choose from too, really something for everyone. 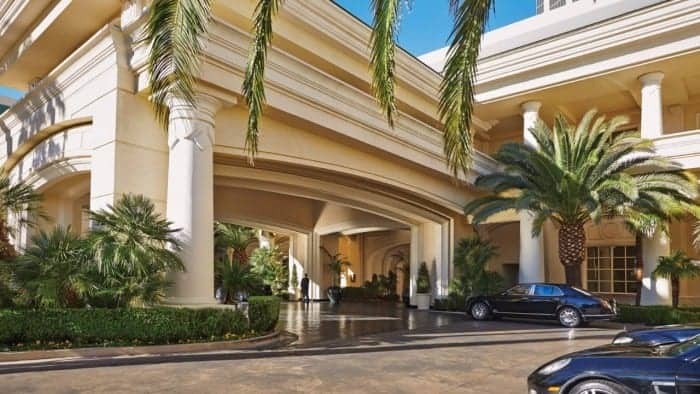 You can find The Phoenician on Facebook, Twitter and Instagram. 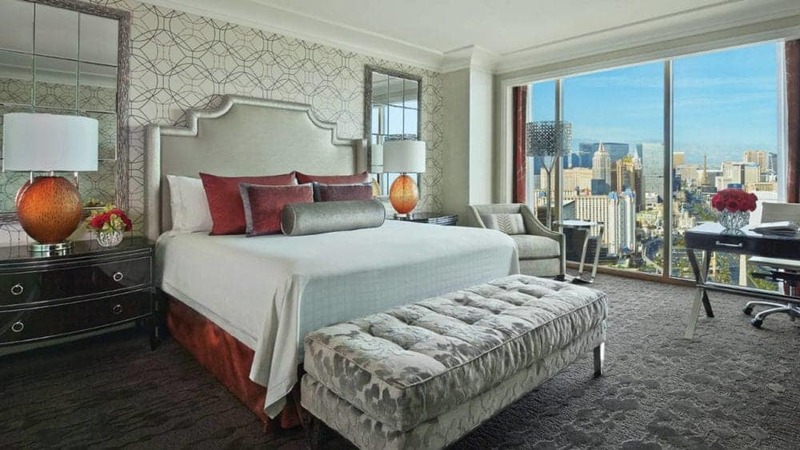 Their rooms are clean, classy and beautiful with lovely views. 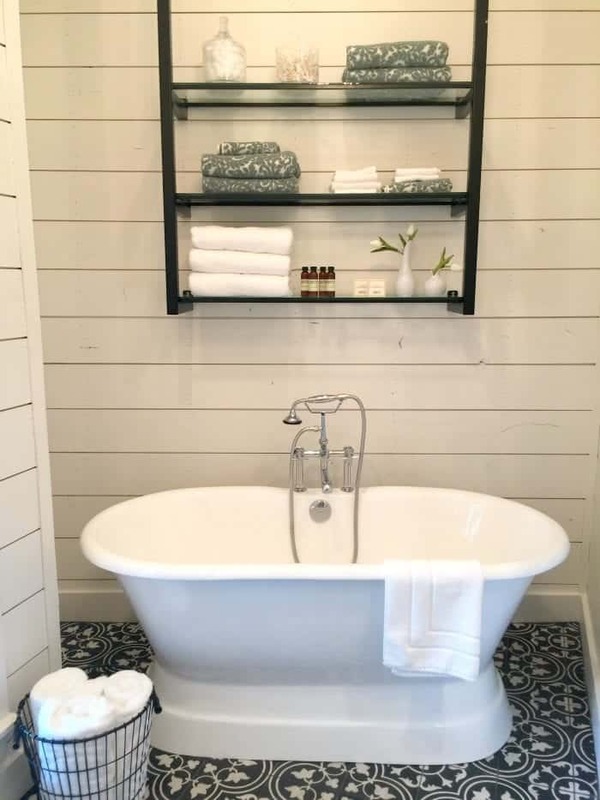 Huge bathroom with a great tub. 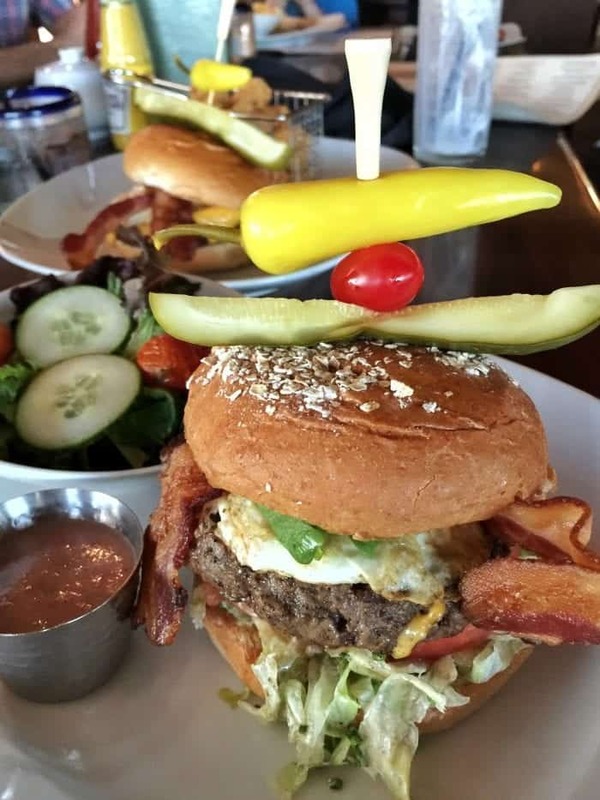 After we unpacked our bags, we strolled over to Relish Burger Bistro. I was really excited to try this with the family. My oldest son ordered this Orange Float….it was amazing. 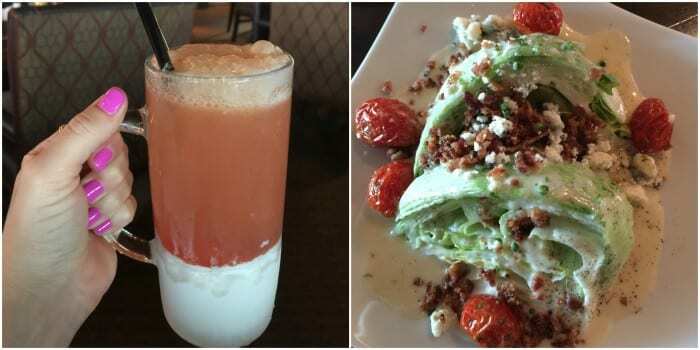 I ordered that delicious wedge salad loaded with blue cheese and bacon. 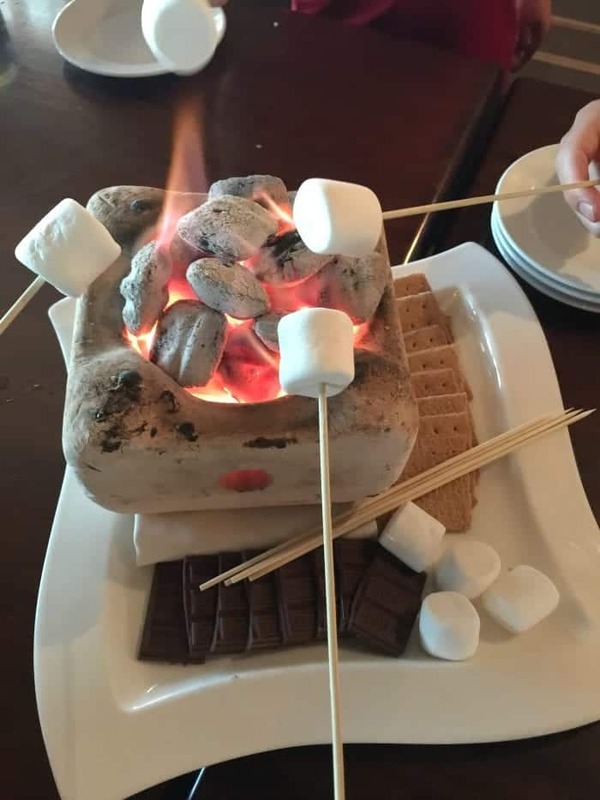 The highlight of our dinner was definitely the do it yourself s’mores brought right to the table. I mean, how fun is that?! 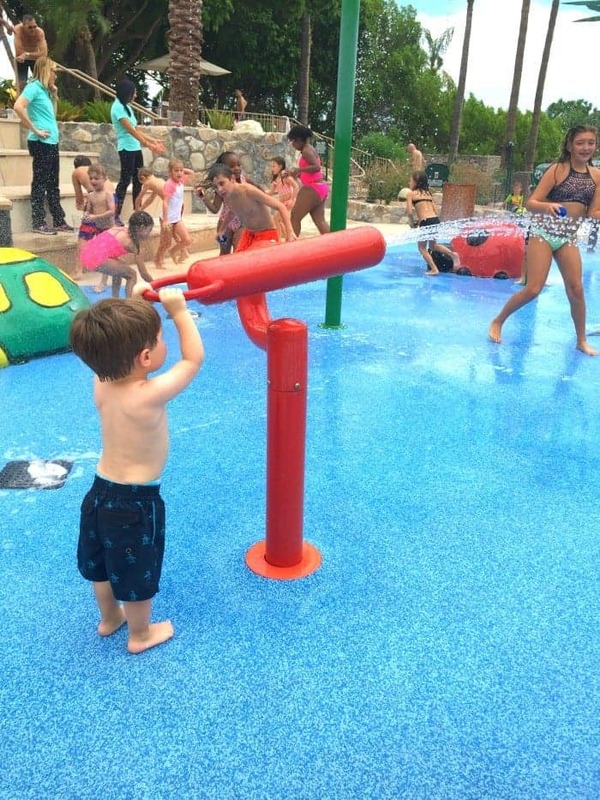 The kids thought it was the coolest thing ever…and so did I, lol! Poor Pax was not happy he didn’t get a skewer, ha! Don’t worry, he got plenty of marshmallows to snack on. 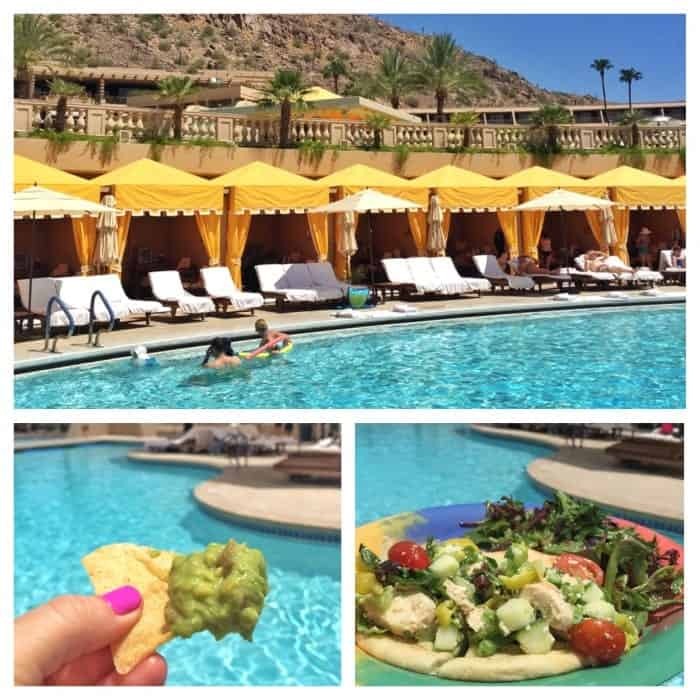 What a treat to enjoy a pool day in one of the Phoenician Cabanas stocked with cold drinks, sunscreen and an Evian mister! (my boy’s favorite) Felt spoiled for sure. Always good times on a waterslide when it comes to my boys. Pax even loved going down on dad’s lap. More beautiful pool views and snacks. All delicious! 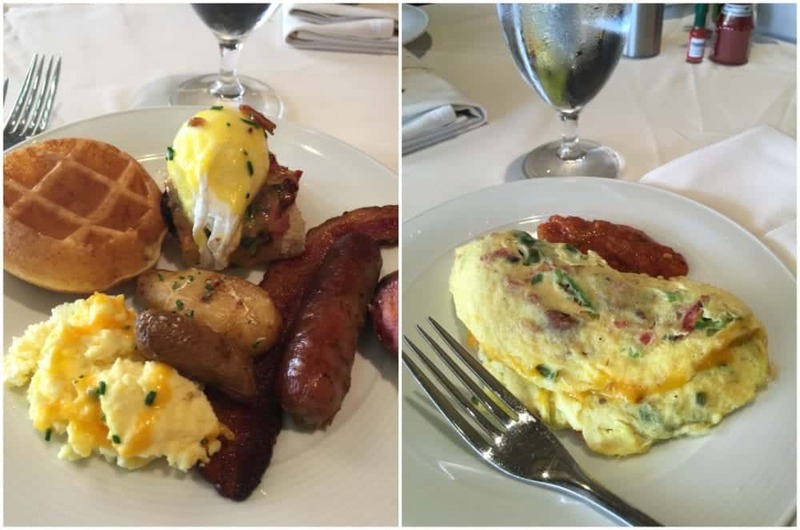 Sunday brunch was out of this world at Il Terrazzo. So much beautiful food to choose from. Everywhere I walked there was beautifully prepared dishes for the taking. 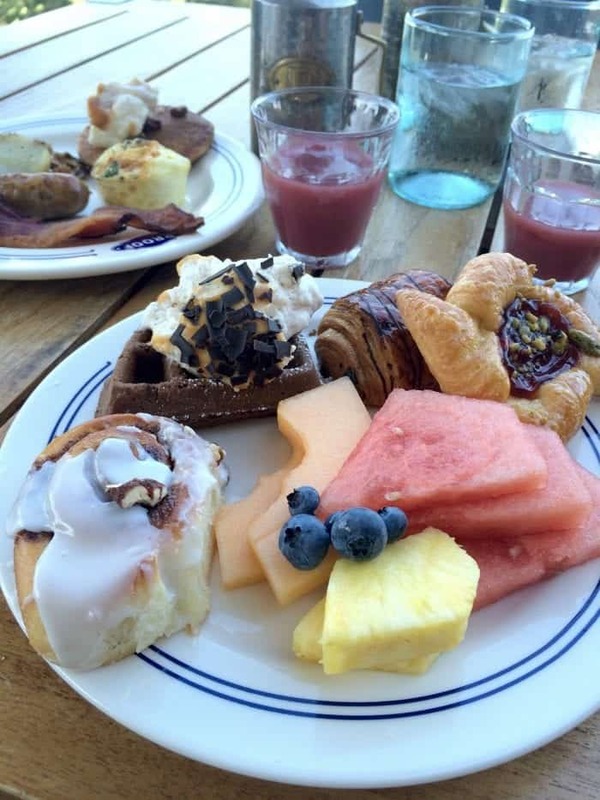 Yogurt parfaits, fresh green juice shots, waffles, omelet bar, hot casseroles with bacon, sausage and potatoes. Seriously the list goes on and on. I was so frustrated when I was full, because I wanted to try everything, lol! Two of my many plates. 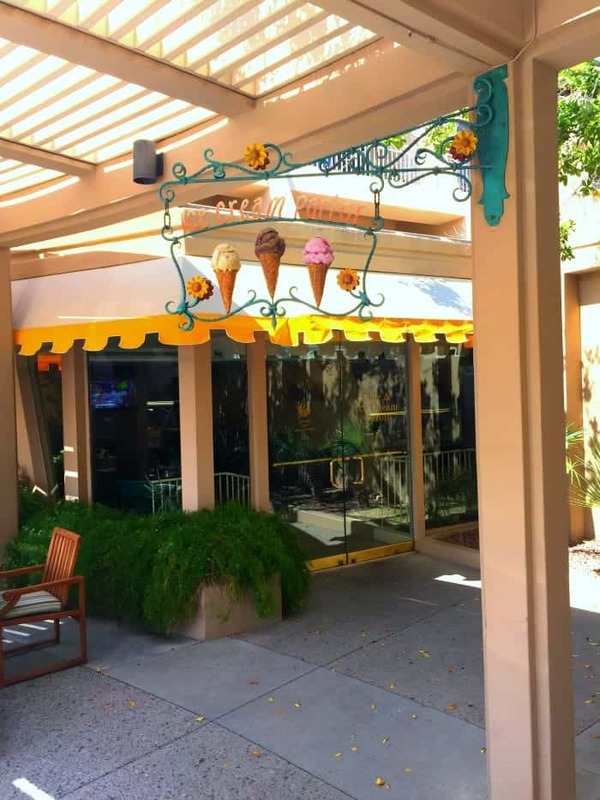 Another highlight for us is The Phoenician Ice Cream Parlor and Cafe. We visited often. Breakfast, lunch, pastries and ice cream. Can’t beat that! 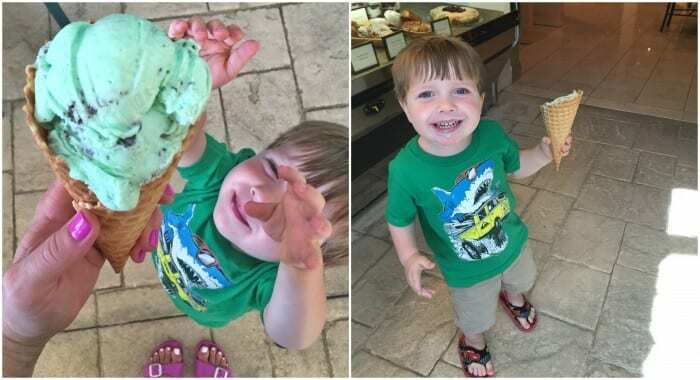 Pax was so excited for his Mint and Chip Ice Cream Cone. So many amazing memories were made at The Phoenician. So happy to have spent the weekend with my family. Looking forward to planning another visit in the future. 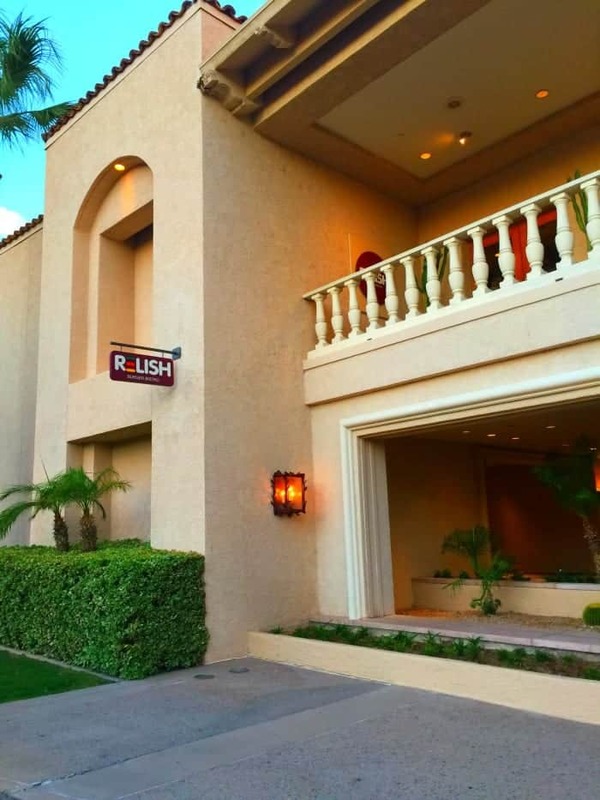 Disclosure: This post is in partnership with The Phoenician, however thoughts and opinions are 100% my own. 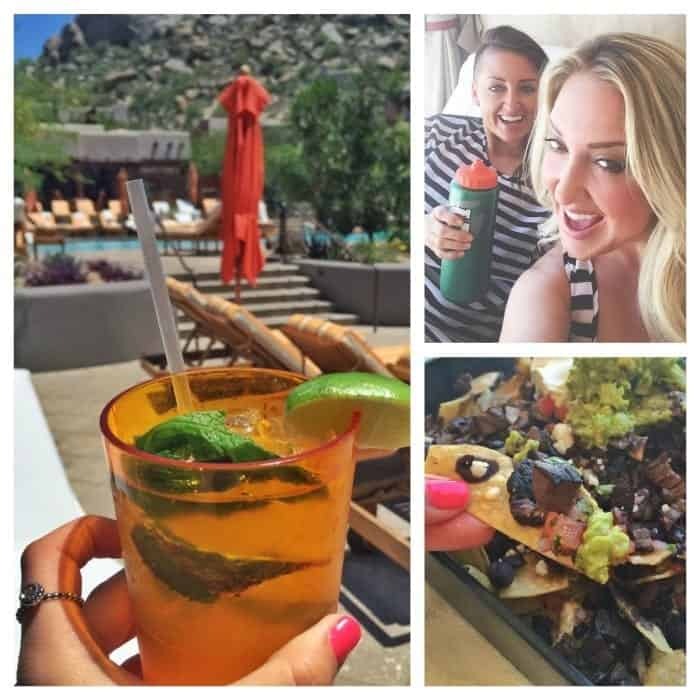 So excited to share my time at Four Seasons Scottsdale Arizona for my sister retreat! 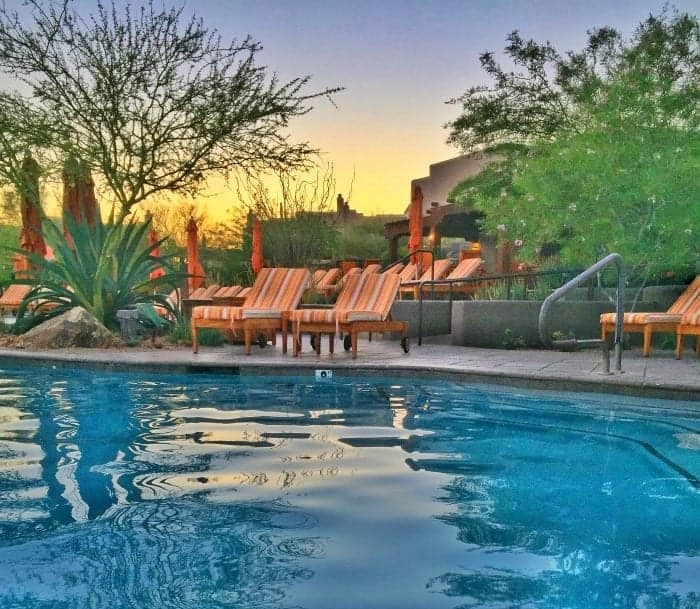 There’s nothing like the warm AZ desert and sunshine at this resort! Hands down one of my favorite places to visit is the gorgeous Four Seasons Scottsdale. 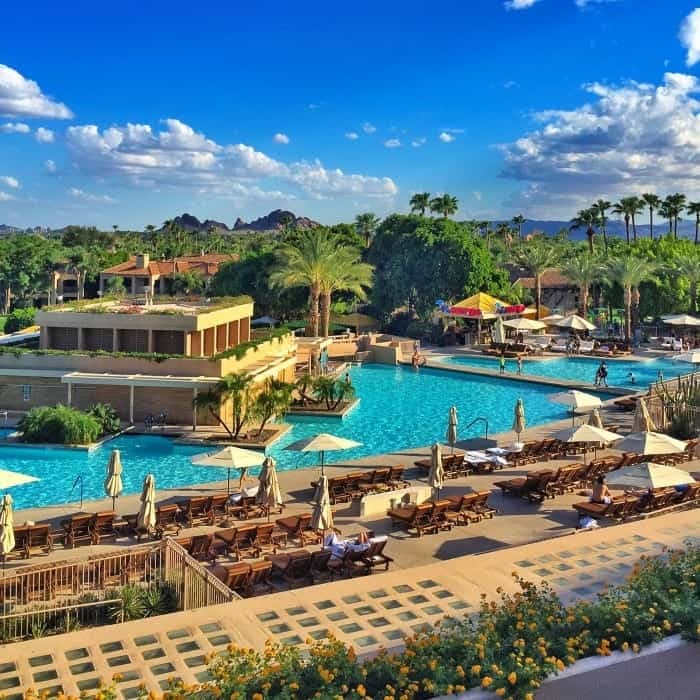 The lush colorful desert landscape, beautiful resort grounds, relaxing pools and fabulous restaurants make for the perfect getaway. I look forward to every time I have a trip planned here. My sister and I had our first stay last year and were so excited to come back this year. See our trip last year HERE. We had a count down going over a month before our trip, lol! We started our stay with dinner at Talavera. 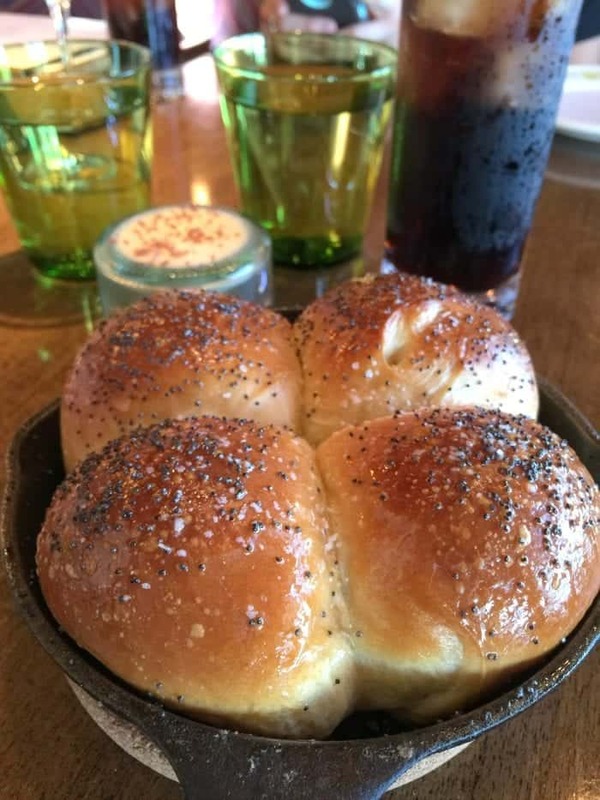 Can you even handle these buttery hot rolls? They are literally even better than they look if that is possible. Still dreaming about them. The sea bass was out of this world as was everything we ordered. The lobster mac was ridiculous in the best way possible. 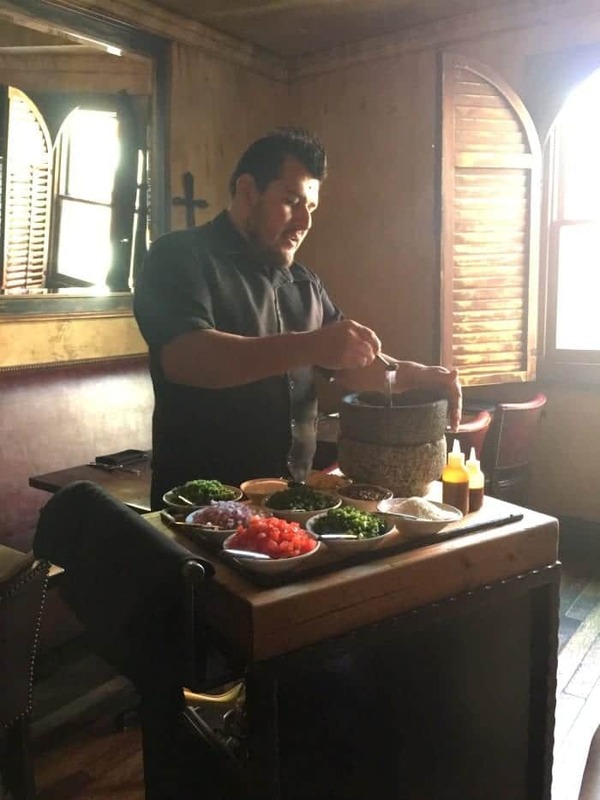 Chef Mel at Talavera spoiled us rotten with the amazing food we enjoyed. Loved every minute of it. This pool!!! Took a sunset walk around the resort. So colorful. 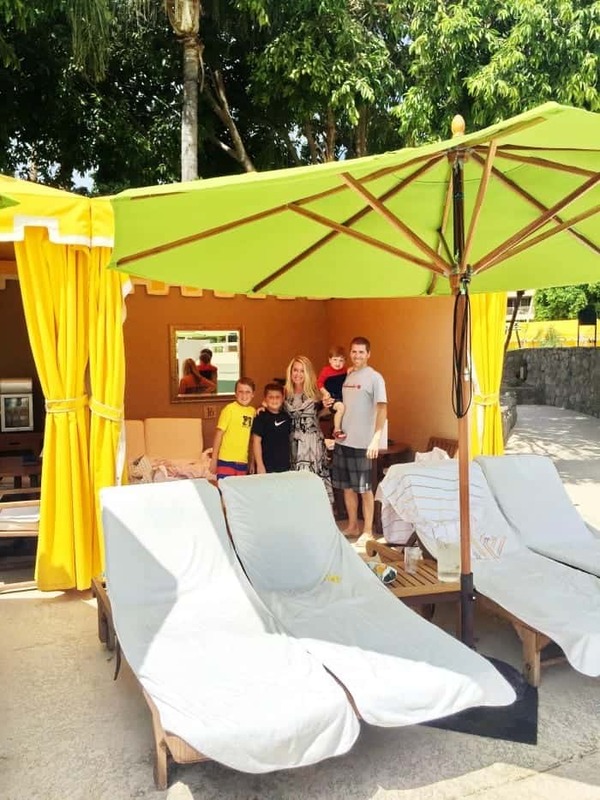 One of the highlights of our trip is always hanging at the pool in our favorite cabana. Most relaxing place ever. Such fun things to order poolside. These carne asada nachos have my heart. Amazing! Love. The “No-jito” drink. All the mojito, no alcohol 🙂 Minty and fantastic. 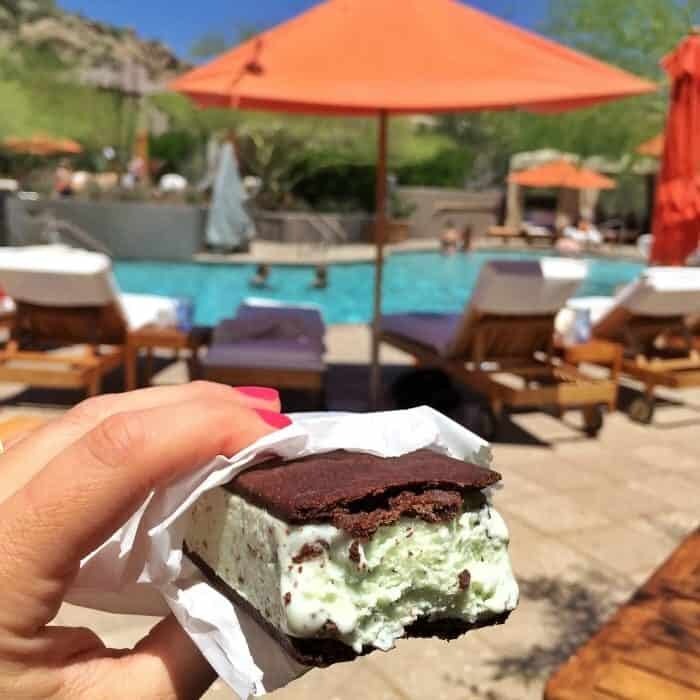 Mint ice cream sandwiches YES and YES! 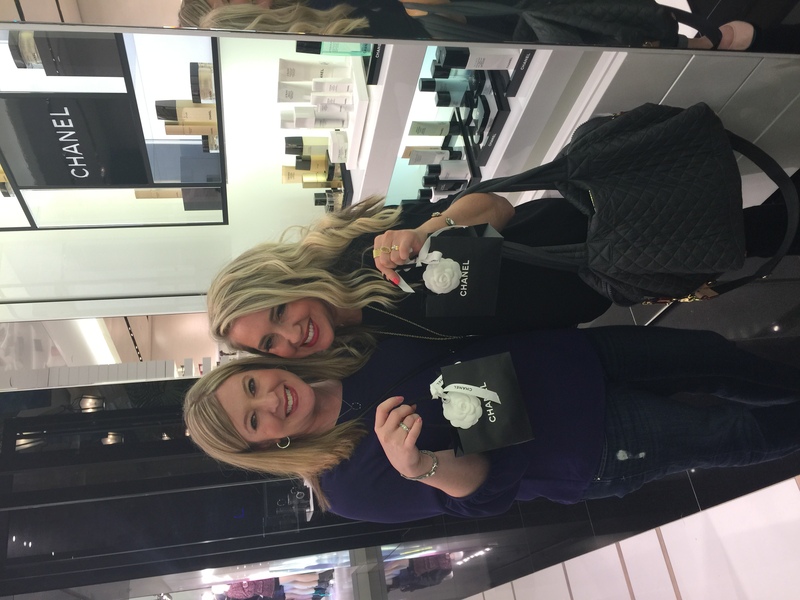 We had a fun night shopping and got matching Kendra Scott rings. Love!! Dinner at Proof Restaurant is always a highlight for me! 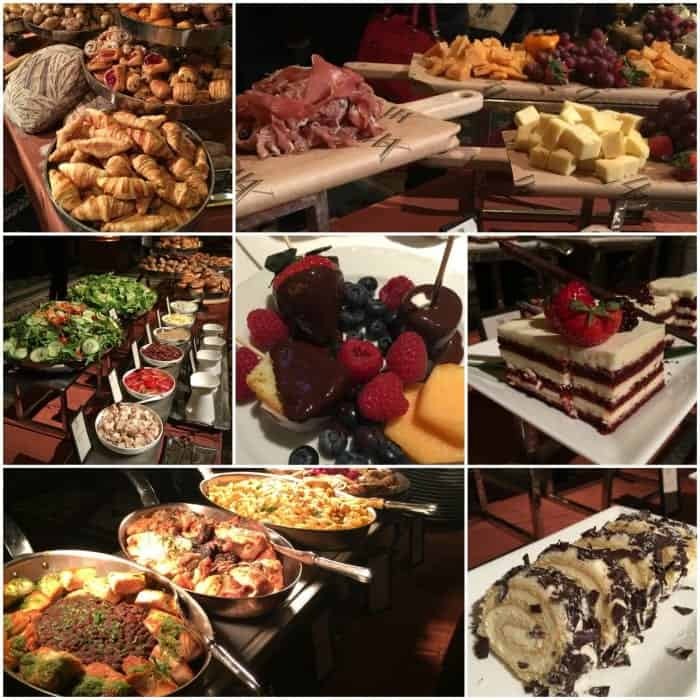 We had so many delicious dishes…mmm! On our last morning we did a great morning yoga class on Global Wellness Day. One last breakfast at Proof before heading home. Nothing but the best memories this weekend. So happy to spend so much fun time with my sister. Can’t wait until we can go back! Disclosure: Four Season hosted part of our weekend, however thoughts are my own.